On April 13, 2015 we celebrated our fifth anniversary of moving out of a house and beginning our life as nomads. 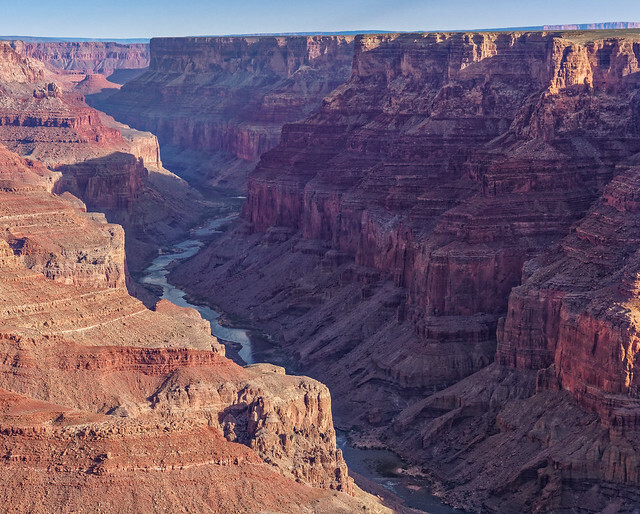 We have traveled quite a bit in the western portion of North America in our 26 foot motorhome. It is definitely showing signs of wear and tear but John does an excellent job keeping everything in working order. And he continually looks for ways to improve our living space, utilizing every nook and cranny. He is the master of the Command Hook! Our motorhome still meets our needs completely and we have no desire to upscale. While we love backpacking and sleeping in our tent we also look forward to returning home to our palace on wheels. After spending the past several months at our new “winter base” (Jojoba Hills RV Co-op in Aguanga, California) we were happy to be back on the road. 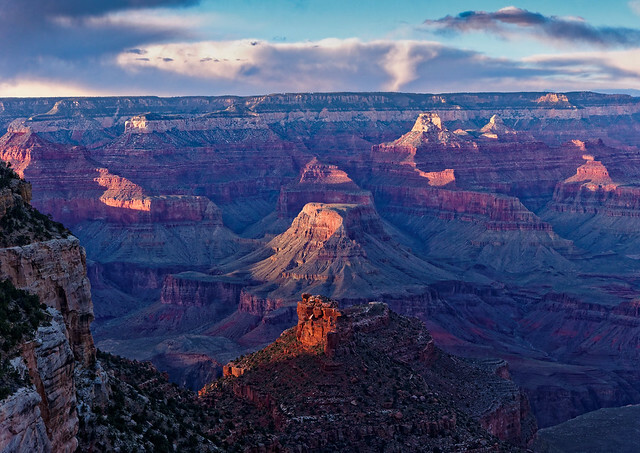 Our first destination for our travel season was Grand Canyon National Park. We arrived with a plan to continue working on our goal to hike every trail in the park. We had four trips in mind so we headed to the Backcountry Information Center the day we arrived and were able to get the permits we needed. The first was for a 2 day/1 night trip out to Cape Solitude located on the eastern part of the South Rim. 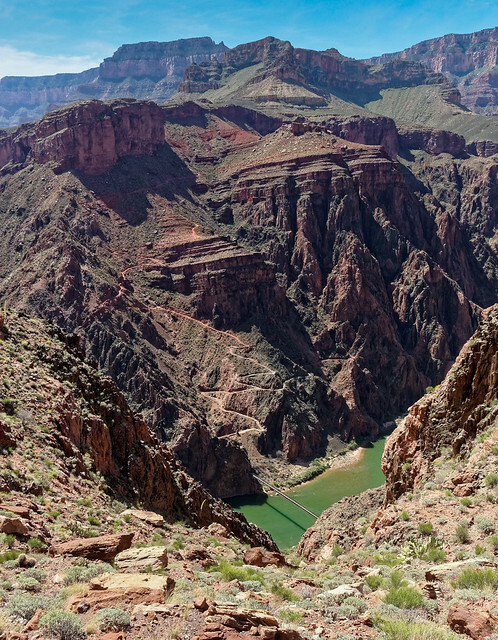 Cape Solitude overlooks the confluence of the Colorado River and the Little Colorado River. 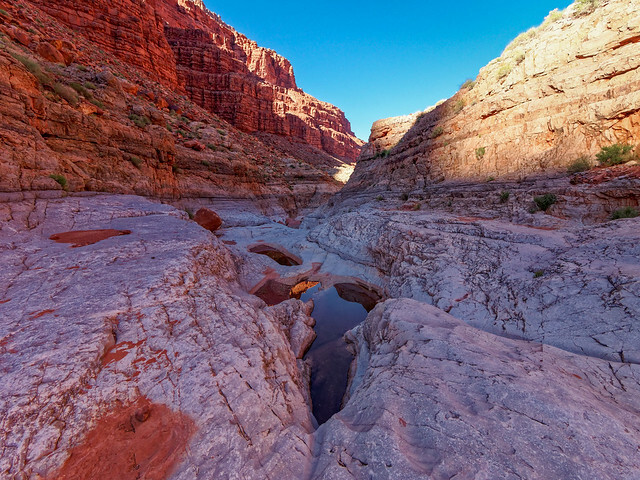 We knew we would really enjoy the views of the confluence from above as we had seen it from below when we hiked to it last spring on the Beamer Trail. 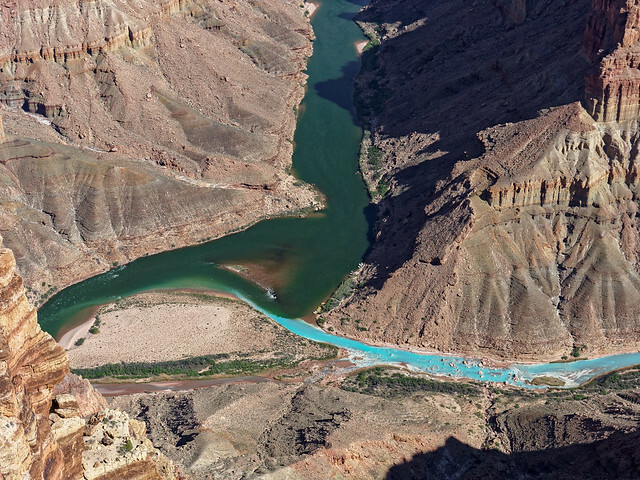 The Little Colorado is a lovely shade of turquoise apparently caused by a high mineral content. One of the reasons we wanted to get out to Cape Solitude sooner rather than later is our fear that one day the Escalade project will become a reality. 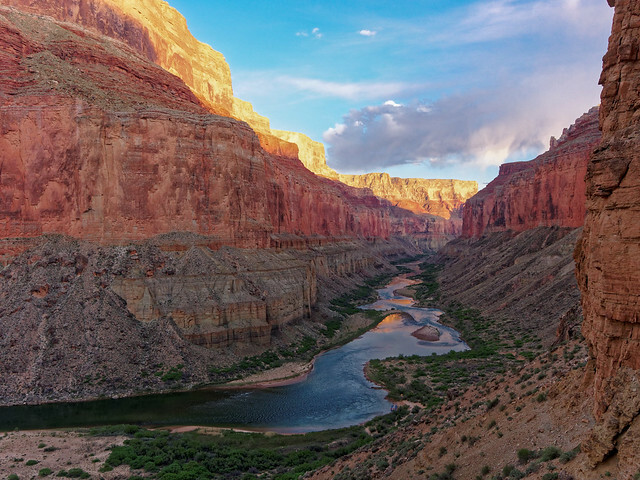 This proposed development would be situated just opposite Cape Solitude on Navajo Tribal land and would have, among other monstrosities, a restaurant and a gondola tram to convey people down to an elevated river walk at the confluence. 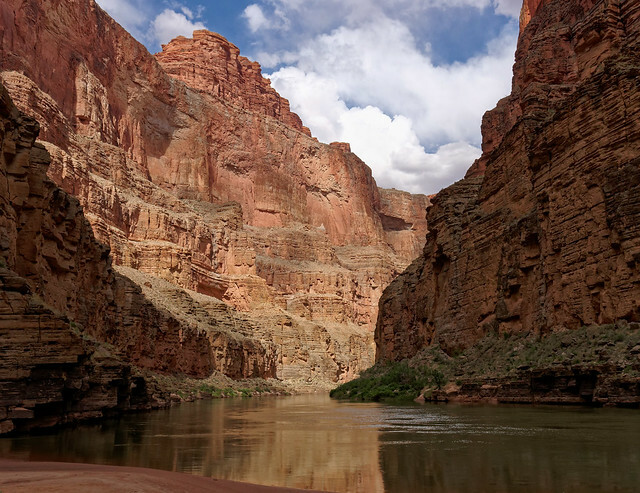 If interested I encourage you to read more from "Save the Confluence" and the Grand Canyon Trust. 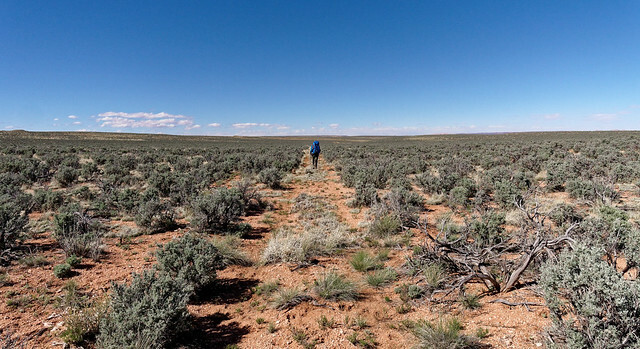 The trail to Cape Solitude is 11 miles long on a converted old Jeep road and there is no water. 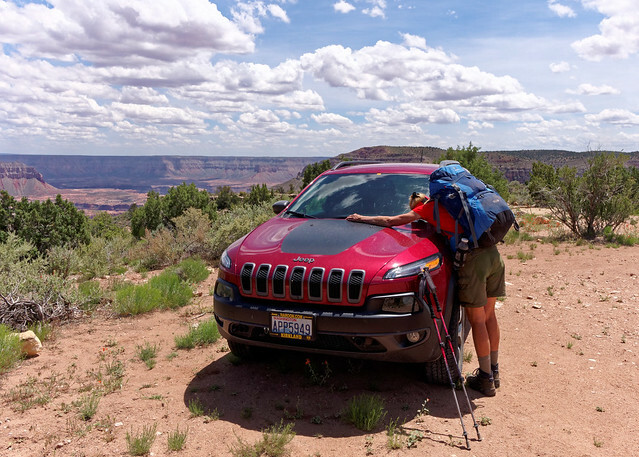 It was the last South Rim trail we needed to do for our project and just getting to the trailhead was an adventure in itself; 2.3 miles on a true Jeep road. We have read accounts where people without the proper vehicle park before this road and walk down it but that makes for a much longer trip. 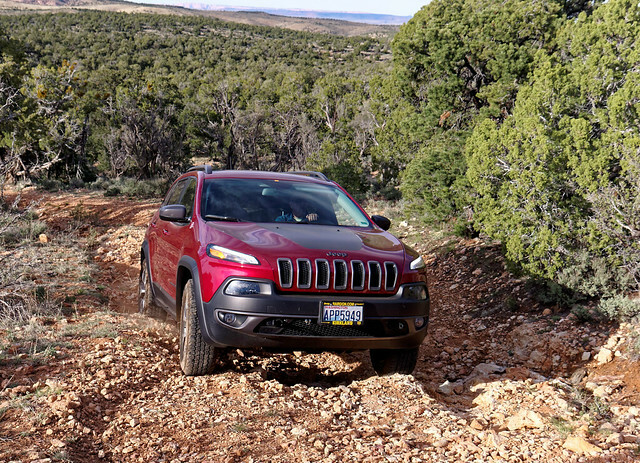 We were once again grateful for (and impressed by) the capabilities of our Jeep Cherokee. 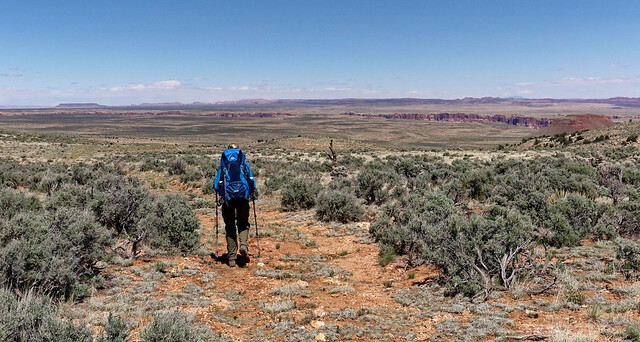 It was our first backpack trip of the year and our packs were heavier than normal as we would be dry camping and were both carrying extra water. The trail first covers more rolling terrain. Unfortunately neither of us had kept up with our conditioning over the winter and we were both feeling it at the slightest incline. We were also not acclimatized to the altitude. Fortunately this trail is mostly flat and it was not too hot. In fact the weather was chilly and quite windy. 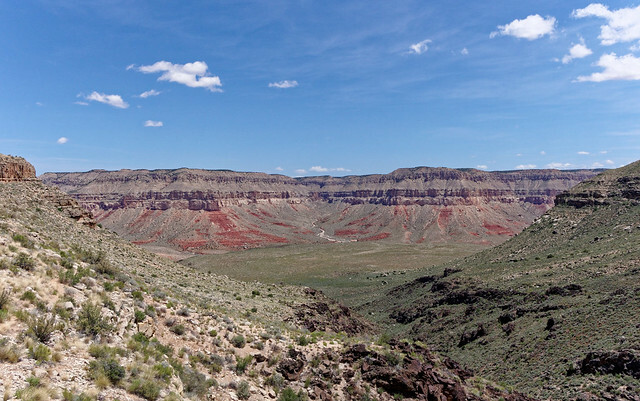 We could see the top of the Little Colorado Canyon in the distance but the confluence was still a ways away. We enjoyed the hike out to Cape Solitude far more than we had thought we would. 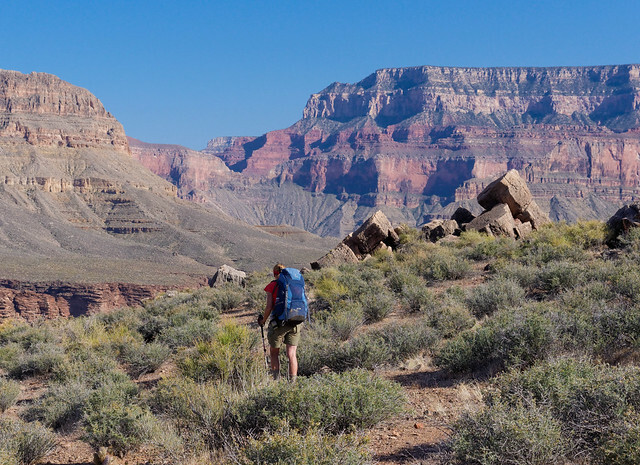 It was a unique experience to be backpacking within Grand Canyon National Park and not be looking up at anything except sky. 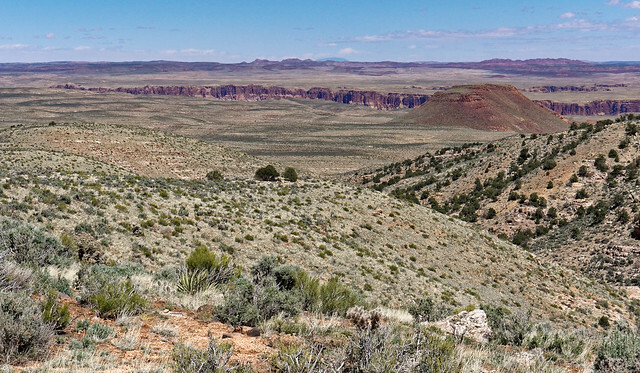 We had read that this trail crosses briefly onto Navajo Tribal land. So we followed it through the fence and continued for a ways. However, it seemed it was taking us farther away from where the trail actually was. So we went cross country to get back to it. What we discovered on the way out was that it would be easy to simply follow the fence line up the slope to reconnect with the trail. 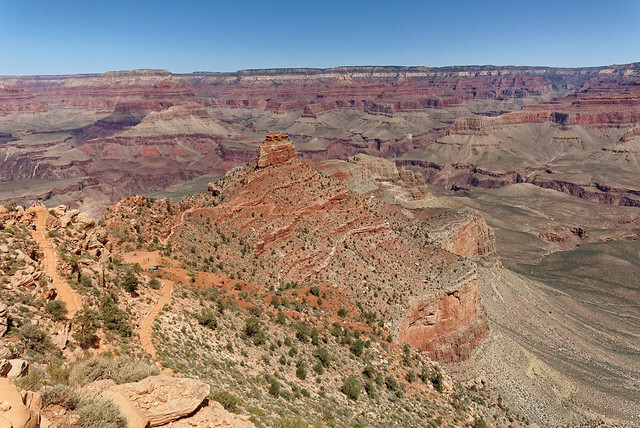 The trail eventually gets closer to the South Rim. Although we couldn't see it we knew the Colorado River was below us somewhere. The temperature was dropping but it was approaching darkness so we pressed on rather than stop and put on more clothes. So we were both quite cold by the time we reached where we would camp. We immediately put on all of our clothes and then set up the tent. We then got into our sleeping bags and cooked supper just outside the tent. We normally don’t like to do this. We prefer to keep food odors off the tent as we are sometimes in bear country. The next morning we were happy that the wind had died down and the temperature was not uncomfortably cold. ... as well as down the river. ... the confluence of the two rivers. 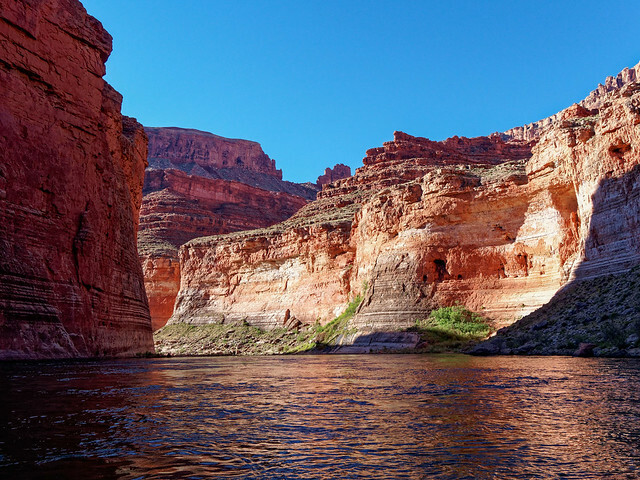 The blending of the two colors is especially attractive when the Colorado appears green rather than a muddy red. 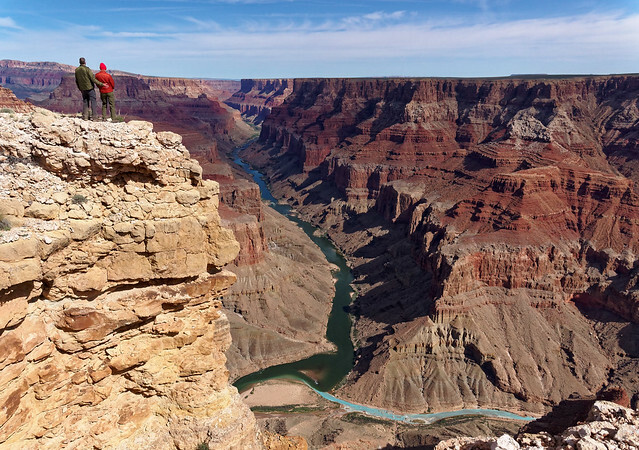 The view from this spot is so expansive and amazing! We felt privileged to have seen this place (and to not be looking across at a restaurant, tram etc, etc). On the hike out I found myself wondering how our Jeep would do going back up the road. But I needn’t have worried. 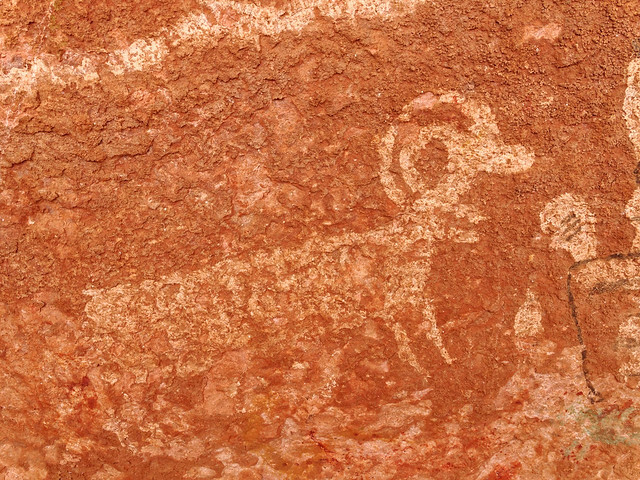 It "walked" up every rock and climbed out of every rut without any trouble. Unfortunately photos don't accurately illustrate the "quality" of this road (I was disinclined to get out at the really bad spots). 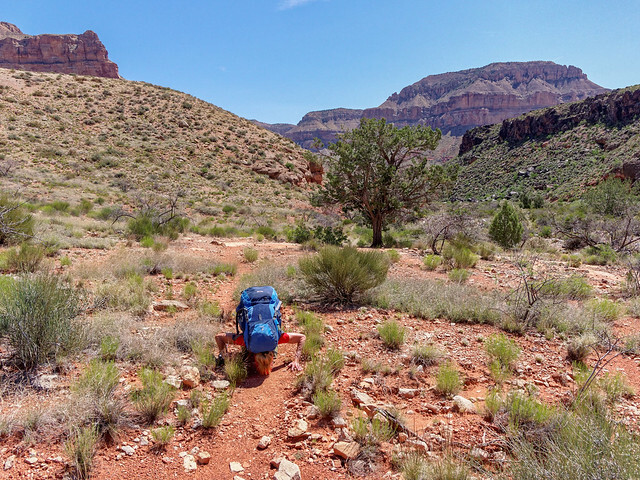 All of our photos from this backpack trip are on Flickr. The next trail we planned to do was the Clear Creek Trail. 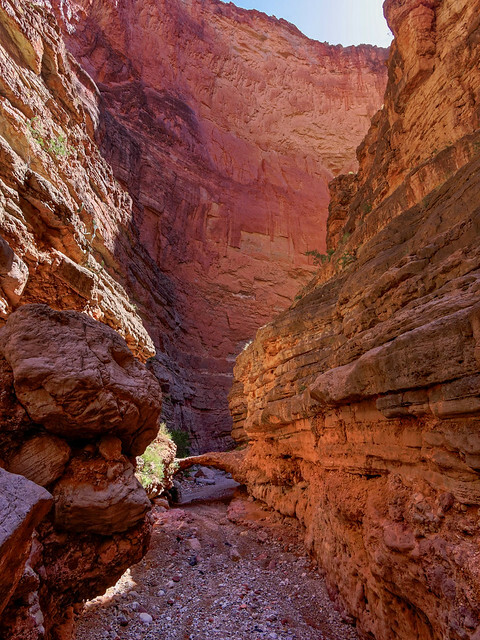 This trail is located north of the river off of the North Kaibab Trail. 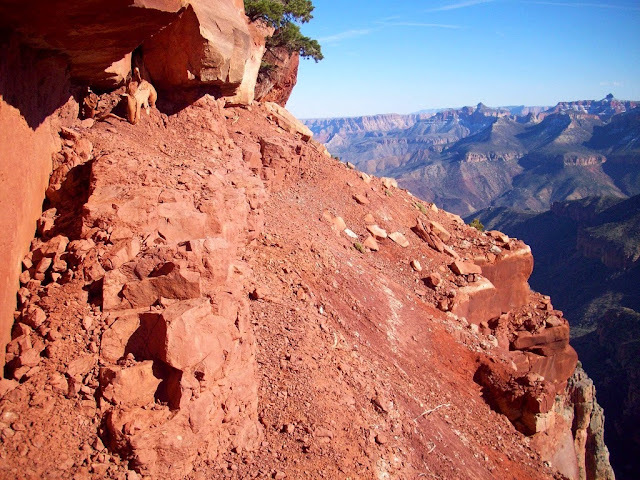 From the South Rim one can get there by hiking down the Bright Angel or South Kaibab Trail. We planned to spend 5 days/4 nights on this trip. 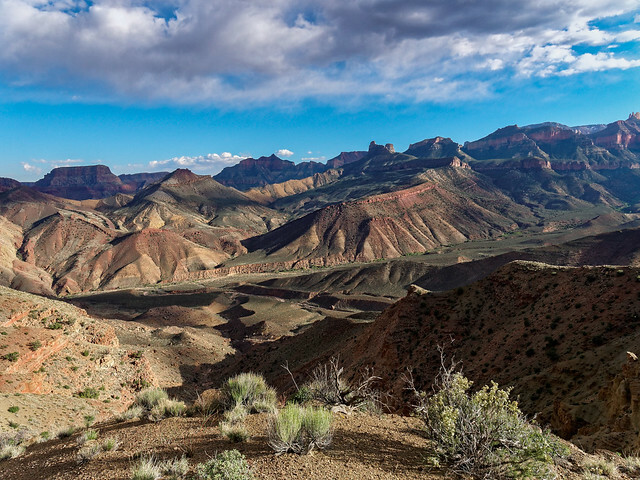 We originally intended to hike up to Utah Flats to camp our first night but the Backcountry Ranger we spoke to discouraged us from that as there was much elevation gain. 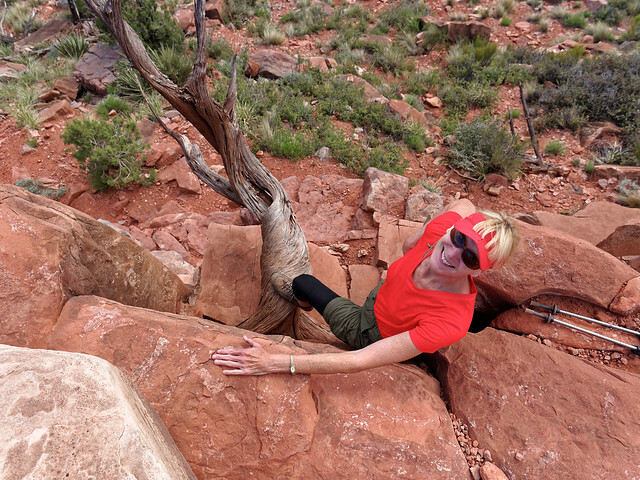 As we were still not “canyon fit” we followed her advice. 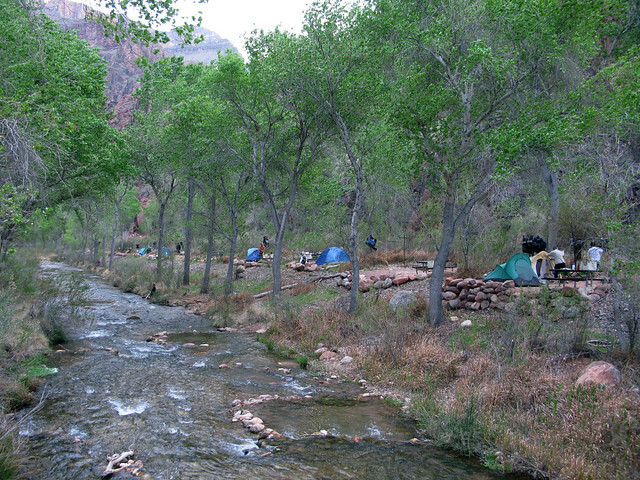 But we were concerned about getting all the way to Sumner Wash, the first place one can camp on the Clear Creek Trail. It would be a dry camp and would require us to carry a lot of water. 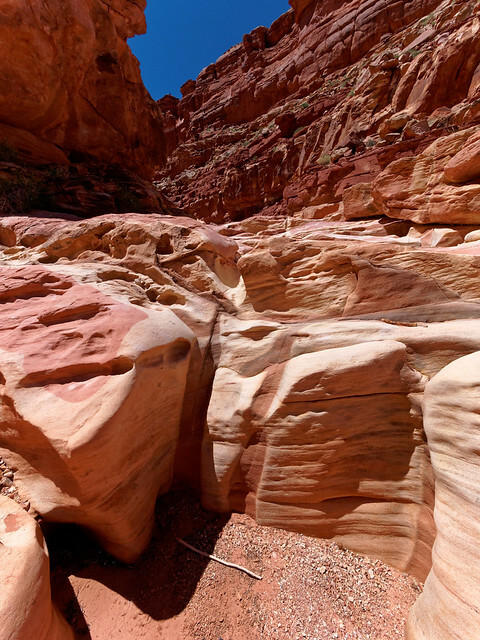 Fortunately for us there had been a cancellation for Bright Angel Campground. 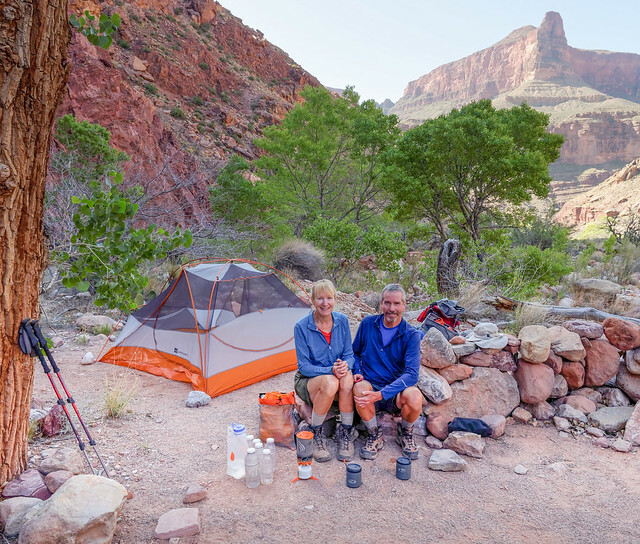 We decided to take that for the first night then spend two nights at Clear Creek and camp at Sumner Wash on our last night out. As this last camp would be a dry one we planned to cache water on our way in. 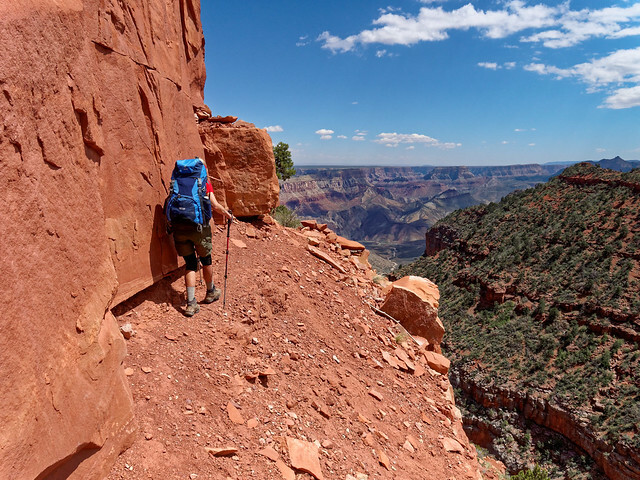 Our last day would be a long one but we are quite familiar with the Bright Angel Trail and would have no trouble heading back up it by headlamp if necessary. 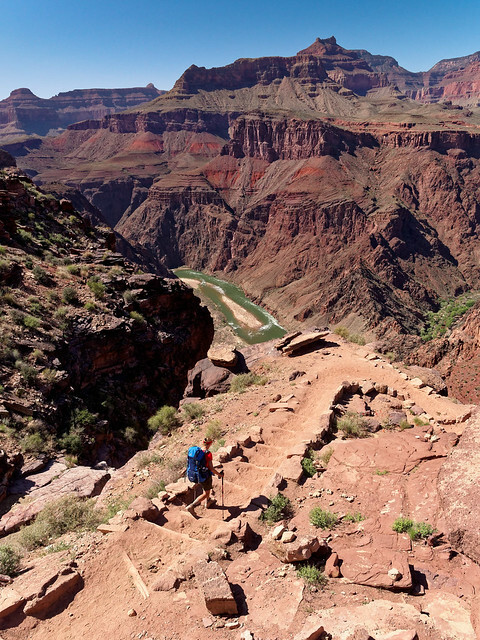 We descended into the canyon on the South Kaibab Trail as it is less crowded than Bright Angel. That is not to say it isn't crowded, it is all relative. However, we knew from experience that the lower we got the fewer people we would see. 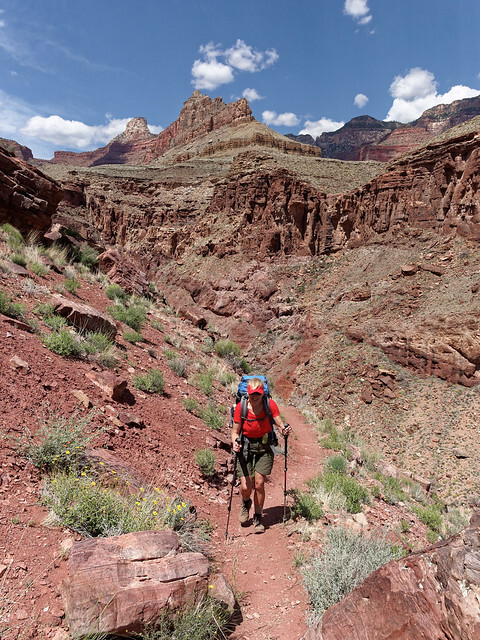 It is also the best constructed trail and easiest on the knees descending into the canyon. 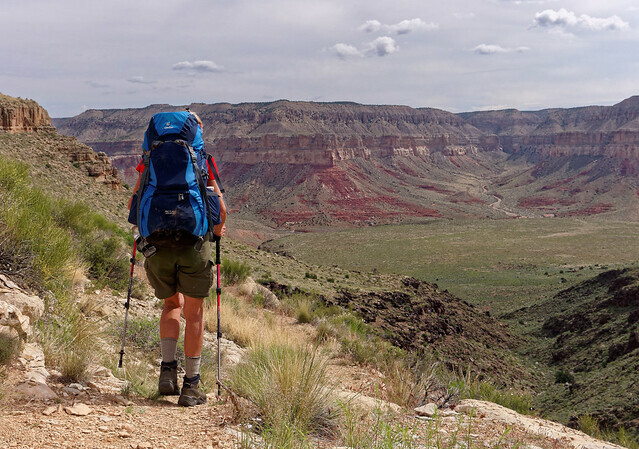 However, the best reason for choosing this trail is that the views are much more expansive. We continued on and were happy when we started getting views of the river. It was visual proof we were definitely getting closer especially as we could see our destination for the day (the trees on the right side of the photo). On the way down we saw what looked like a rescue in progress below us. We observed a small group clustered around an individual who appeared to be just barely moving under their own power. Before too long we caught up with them. 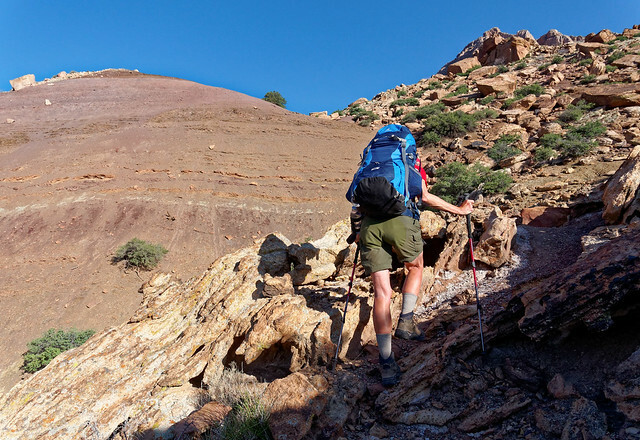 One fellow in the group had apparently done this hike 17 times before and now, at the impressive age of 85, his legs were just letting him down. The following day we talked to some members of the group and learned that he was doing fine but plans were being made to get him out of the canyon. I assume this would involve riding a mule. We knew the Clear Creek Trail was somewhere on the plateau across the river on the right. 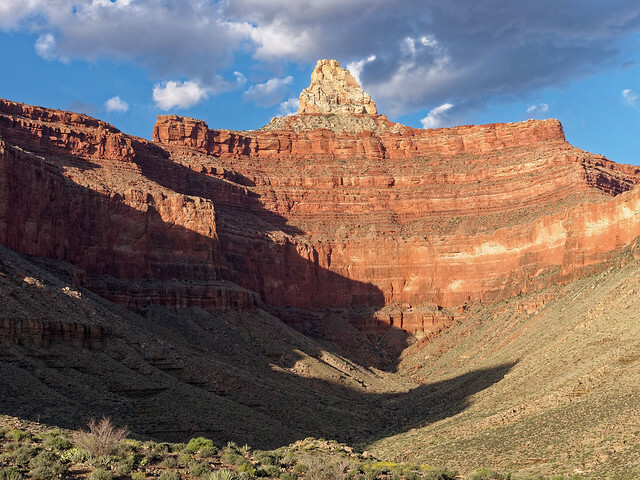 Our best guess was that it skirted the cliffs just below the top of the plateau. 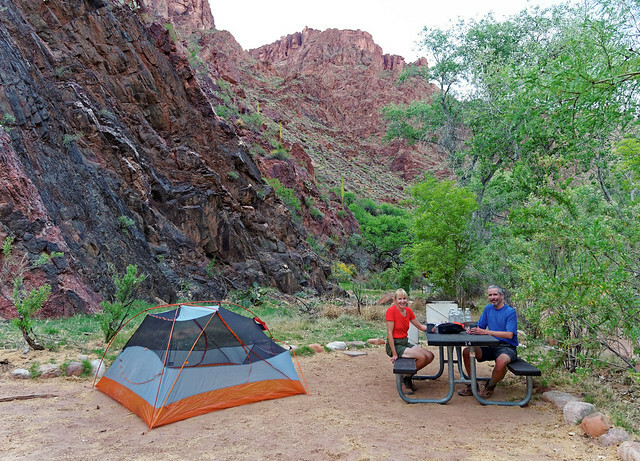 We were surprisingly tired when we reached Bright Angel Campground so realized that this really was the best option for our first night. We have never wanted to stay in any of the corridor campgrounds because they remind us of a popular state park on a busy weekend. However, we were very grateful to have a site there that night. 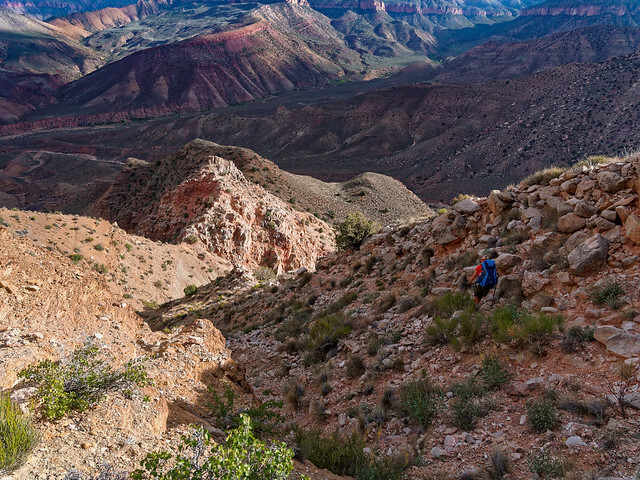 We left camp the next morning and headed a short way up the North Kaibab to the trail junction. 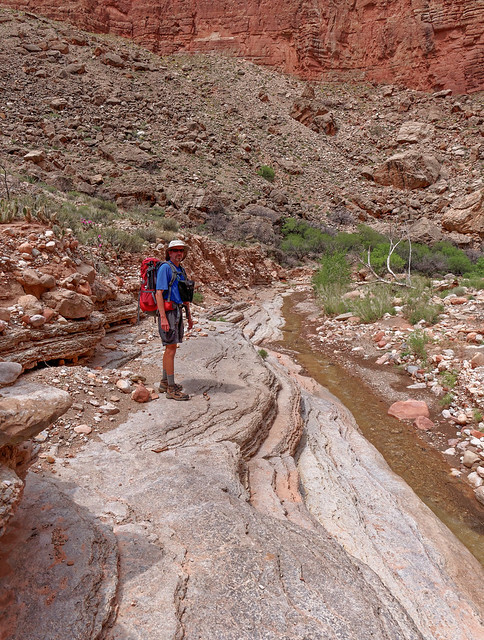 We were both carrying an additional half gallon of water to cache near where we would camp at Sumner Wash on our last night. The trail is steep and the going was a bit demoralizing. We were both still regretting not keeping up with our conditioning over the winter. Playing Pickleball does not prepare one to do this! 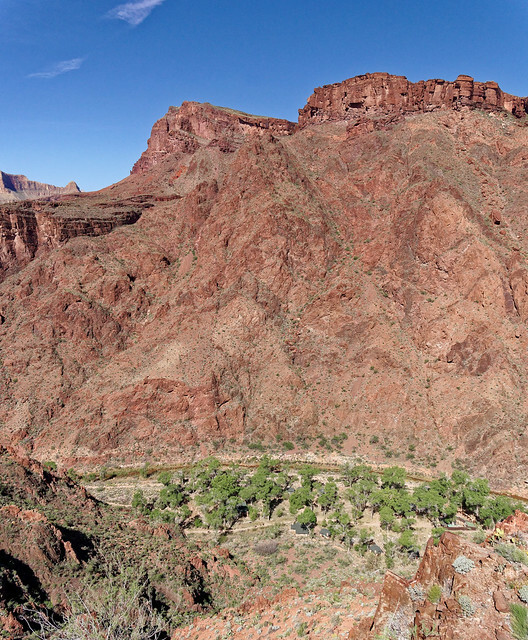 There is an overlook that provides views of the river and Phantom Ranch. 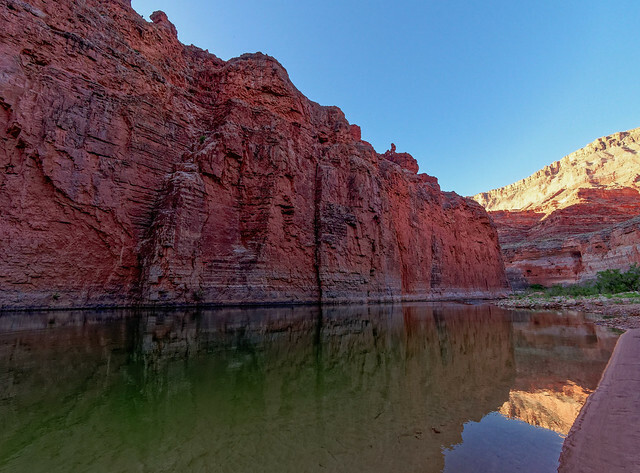 This is a popular dayhike for those who are spending multiple days in the Bright Angel Campground and Phantom Ranch. Some continue as far as the Tonto Platform. 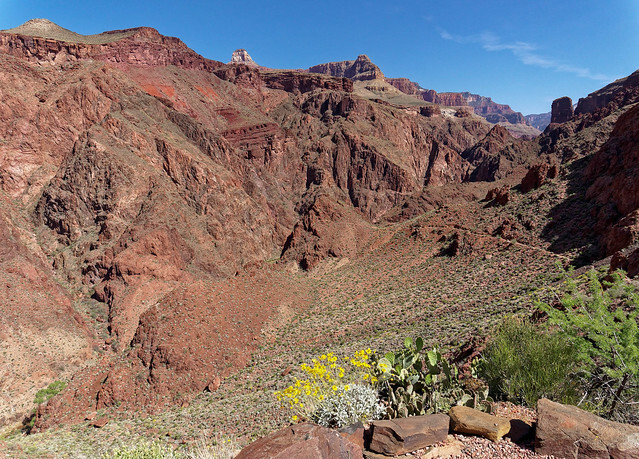 We also got a view of the South Kaibab Trail. ... to the Tonto Platform. 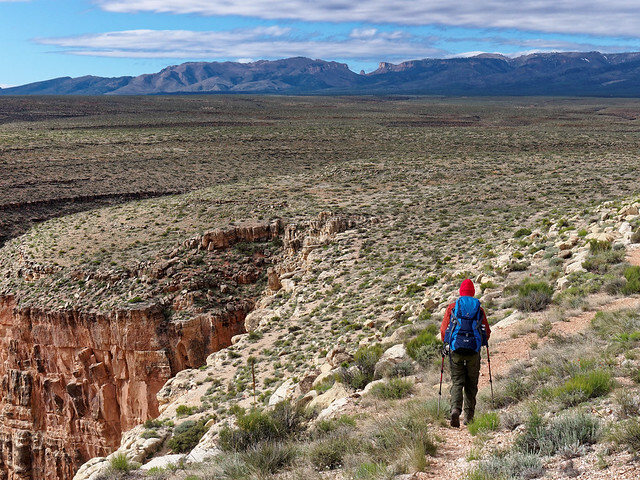 It felt quite familiar as we have spent many a day hiking on the Tonto Platform south of the river. However this is the only trail north of the river that crosses it. The trails north of the river are notorious for the absence of shade so it is important to take advantage of any shade you can. We could see the top of Clear Creek Canyon in the distance but we knew we still had several miles to go. It was somewhat reassuring to see the beginning of Clear Creek Canyon in the distance and know that at the very least we would not have to go that far. 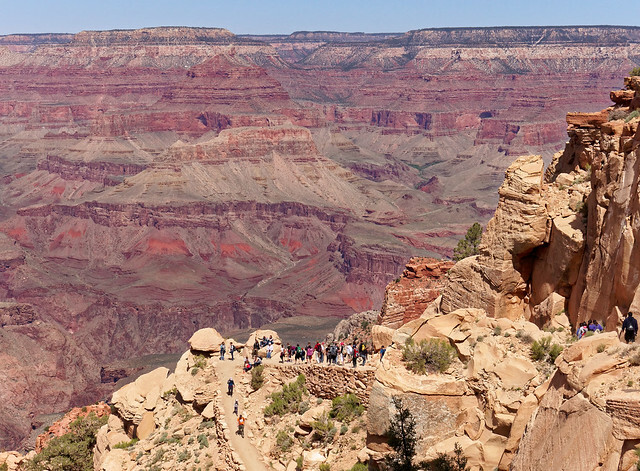 We could also see across to the south rim. 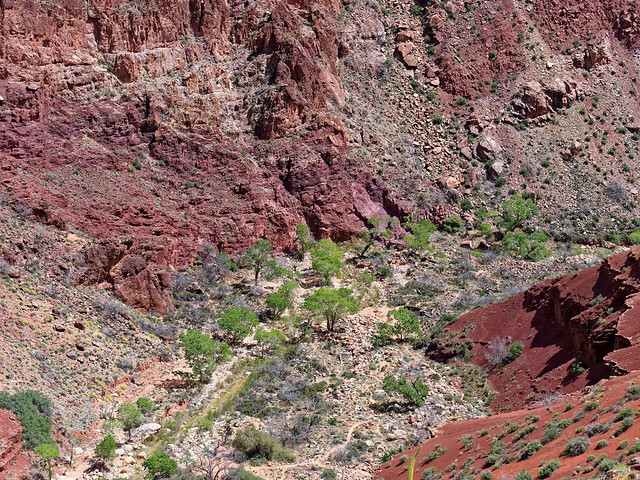 We were relieved to finally see that the trail (zig zagging across the red slope) would soon drop down toward the creek. I have read than some have trouble with this section of trail because of the sense of exposure. 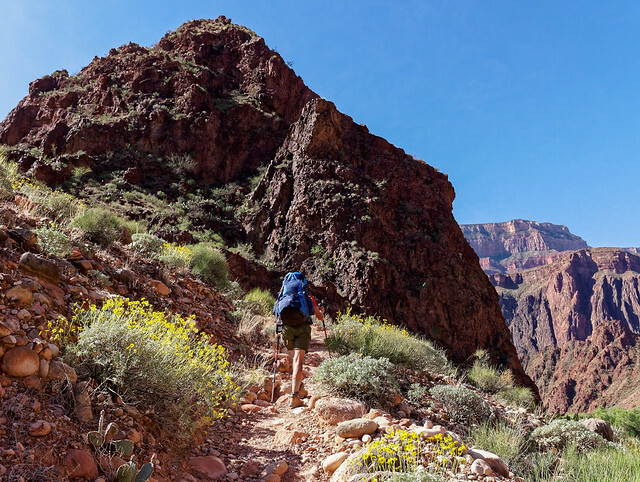 I can understand that if their previous experience in the canyon was limited to the "corridor trails"; the Bright Angel, South Kaibab and North Kaibab Trails. However, compared to several of the trails in the park this is pretty mild. 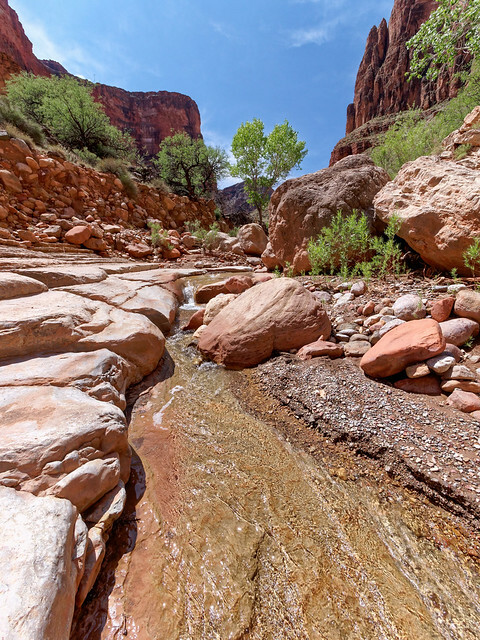 We expected Clear Creek to be crowded as this is a popular trail. In addition we had heard that there was a group of trail maintenance workers camped there. However, on the way in some other backpackers told us of a good campsite further downstream from the main camping area. We followed their advice and found a fine well developed site under some trees that was surprisingly private. 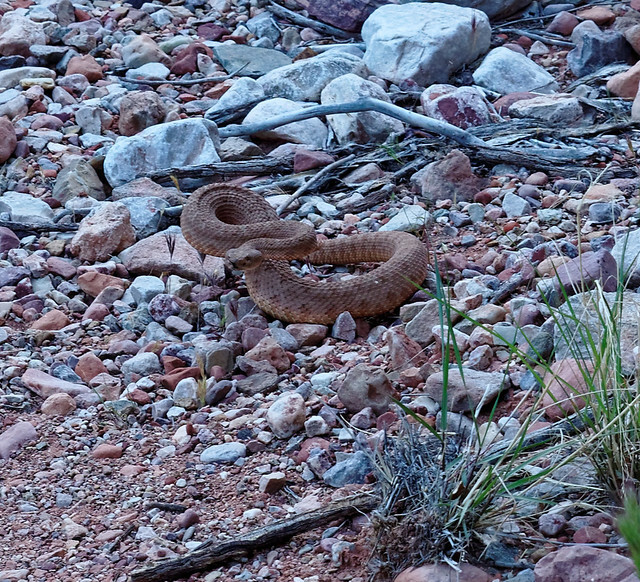 I have read that there are an abundance of mice, and therefore an abundance of snakes, in the Clear Creek camping area. I have also read that Ravens are a problem and some have been able to get into Outsak mesh bags, which is what we use to protect our food. There are several YouTube videos that show ways to help protect your food from these "Mega Ravens". We place our Ziploc bags of food in a Silnylon bag first. We place that inside the Outsak and then suspend it from John's tripod (which he usually carries) and have had no problems. However, we did not see any mice or Ravens. It could be they frequent the larger and more commonly used campsites further upstream from where we were. The next day was a layover day and we planned to do a dayhike. 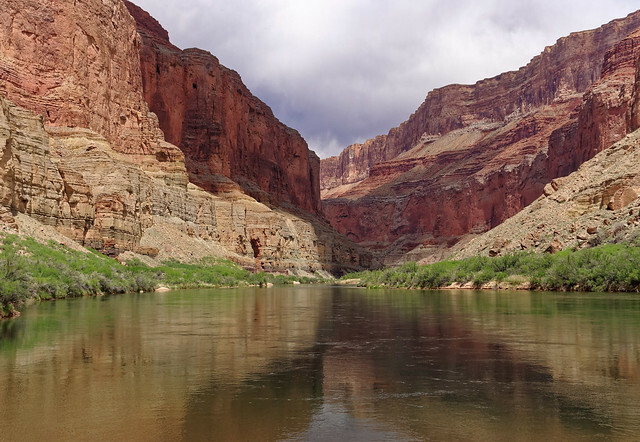 One option would have been to hike down to the Colorado River. 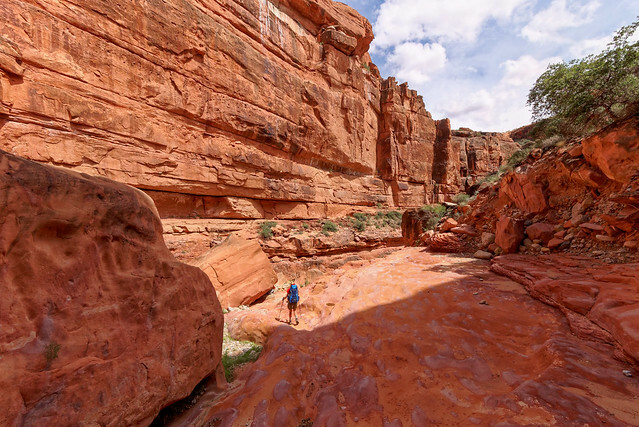 It is six miles to the river and the route goes back and forth across the creek as well as there is apparently a pour off requiring a 15 foot down climb near the river. We did not feel a need to get to the river as we would be camping by it on upcoming trips. 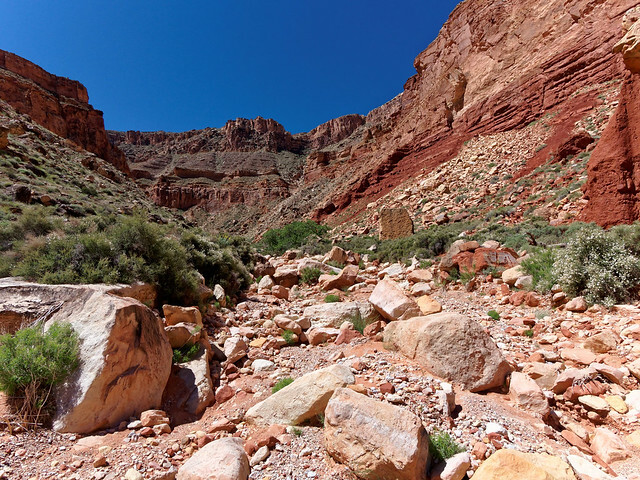 We would have loved to have hiked up canyon to Cheyava Falls and but had heard it was dry. However, there are other sights to see. Something I especially enjoyed seeing at this site were these "grinding stones". 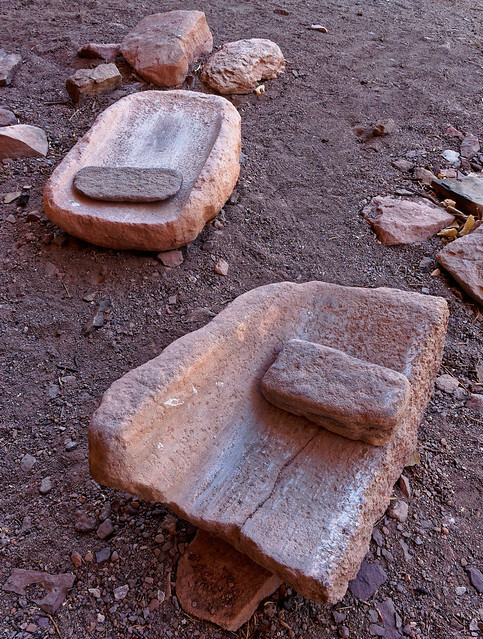 There is just something so personal about touching an implement that was used on a regular basis by the ancestral Pueblan people who once lived in the area. We then hiked back down canyon. We were very nearly back to the main camp area when John suddenly jumped back. Fortunately for him this rattlesnake was courteous enough to warn him of its presence. 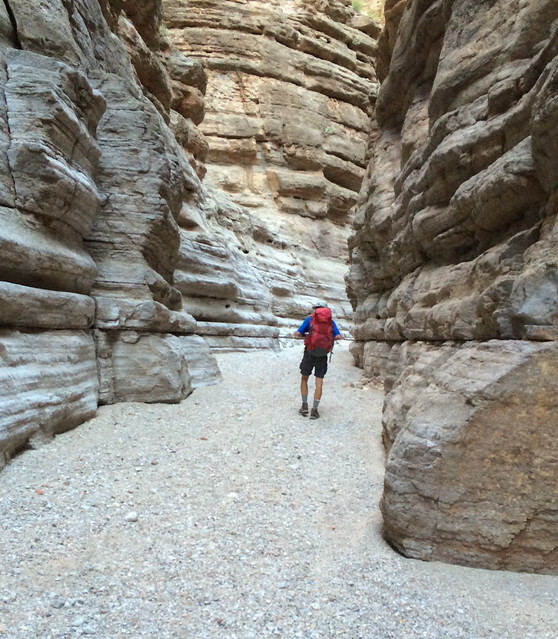 Once back at camp he explored down canyon a bit. The next morning we began hiking out. We realized we could look down at our campsite (located just down and left of center). 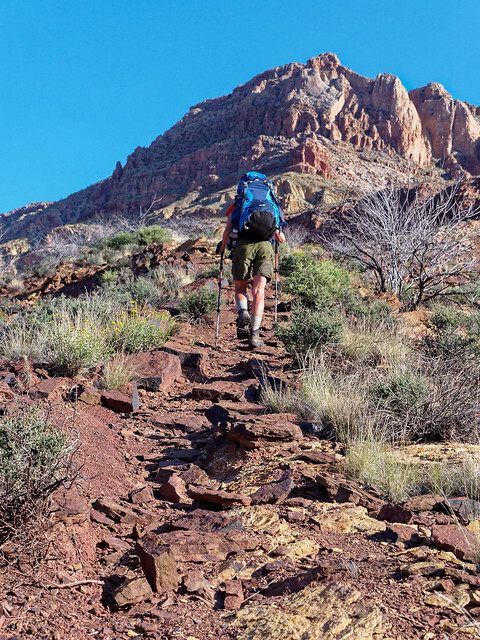 As a general principle we prefer loop hikes. However, even an out and back trip such as this one can provide one with different views of the same features due to changing light and weather conditions. 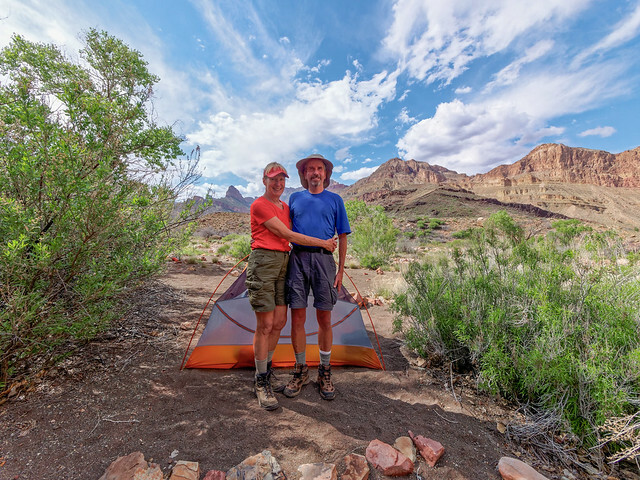 We camped our last night at Sumner Wash. 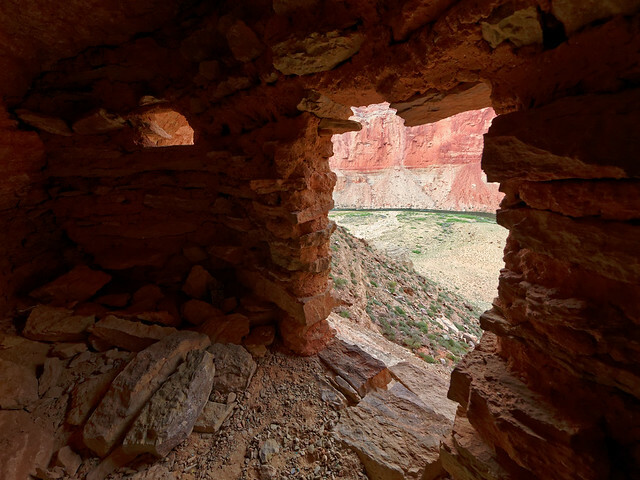 It had become quite windy and the developed sites located there are all completely exposed. 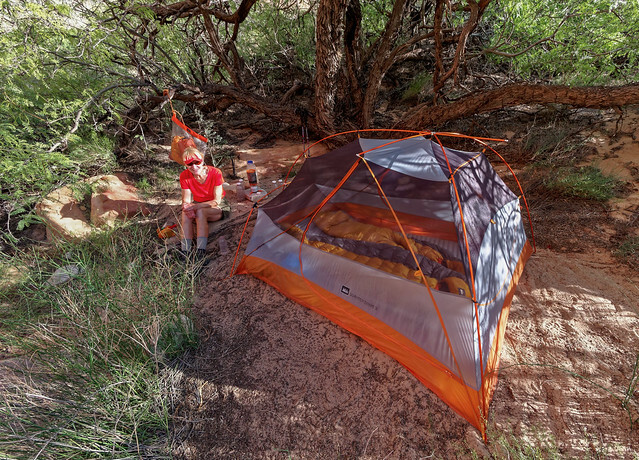 After reclaiming our cached water we backtracked a bit and found a narrow wash with a relatively flat spot just big enough for our spacious tent. Fortunately it offered enough protection. 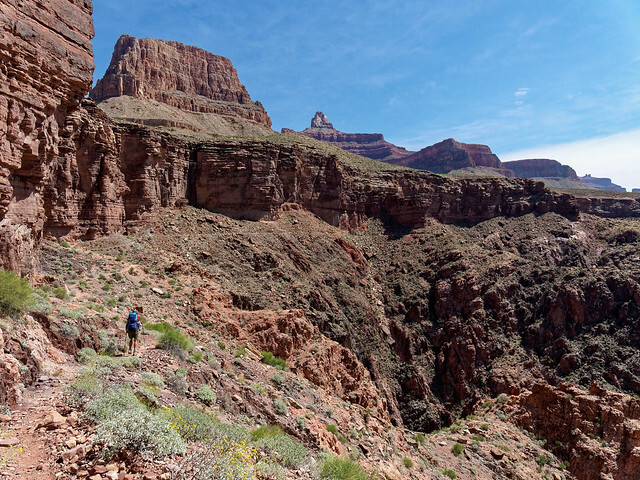 ... and heading up the Bright Angel Trail. 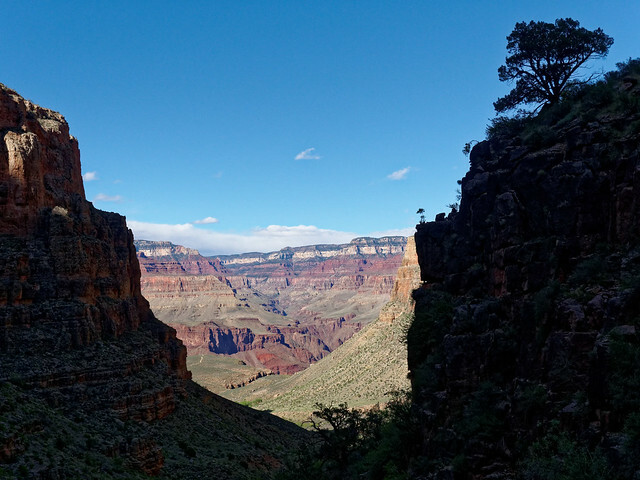 We welcomed the shade, one of the advantages of South Rim trails. 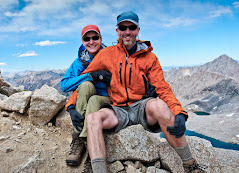 We were happy to finally get to the top and not too disappointed with how we did on this first climb from river to rim. We were starting to get back in shape! 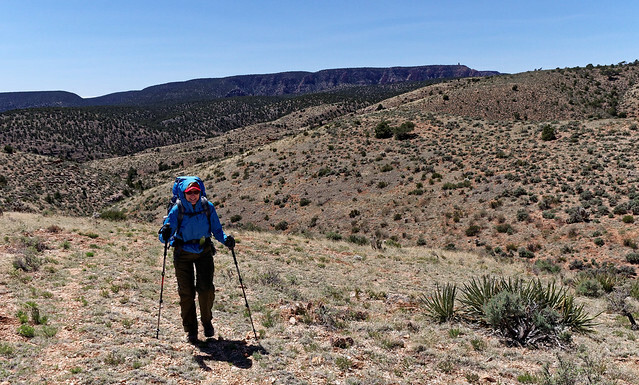 All of our photos from this backpack trip are on Flickr. 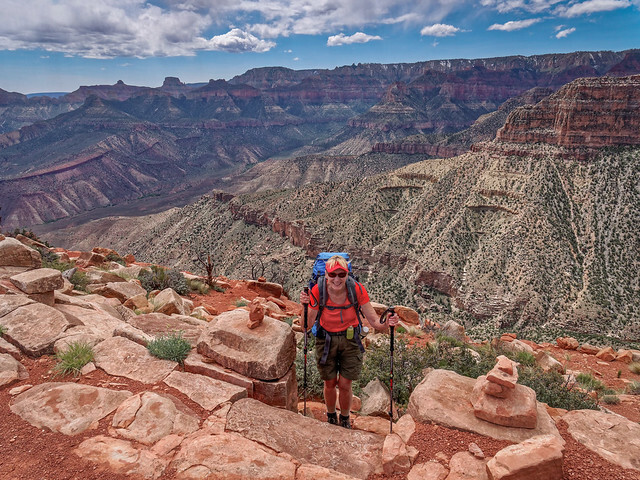 The next trip we planned to do was 5 days/4 nights on the Nankoweap Trail, a North Rim trail. 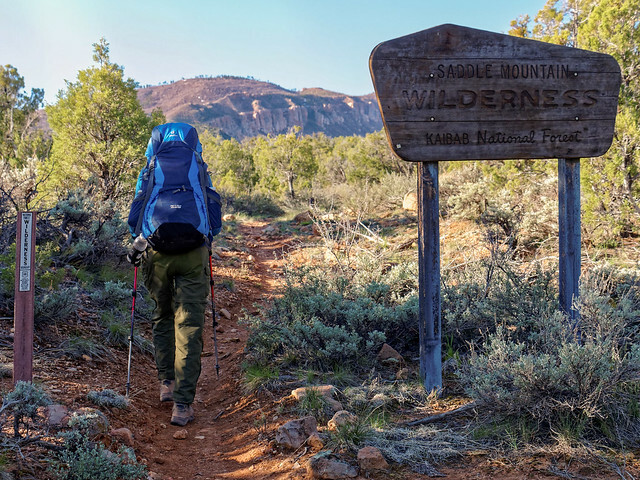 Even though the North Rim would not open until May 15th there is a way to access the trailhead before this date, the Saddle Mountain Trailhead within Kaibab National Forest. 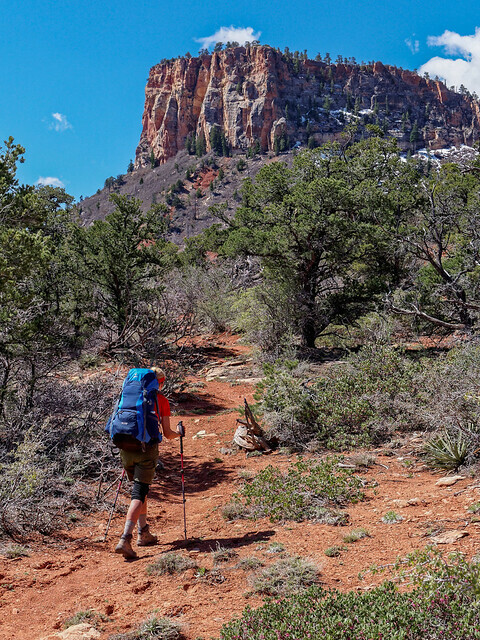 One recommendation is to hike in the night before and camp within the national forest near the park boundary. 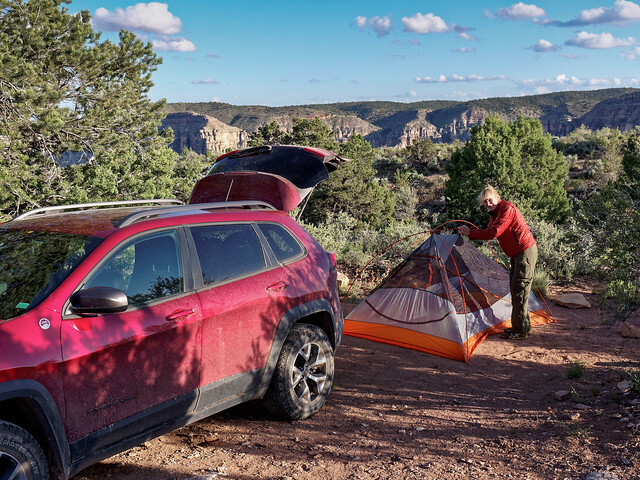 Or at the very least camp at the trailhead in order to get an early start. 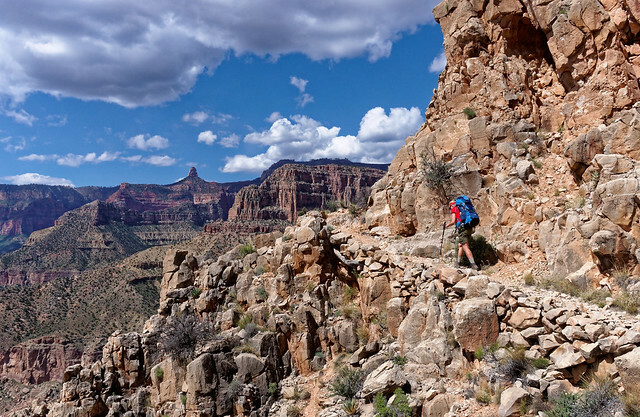 Heat on North Rim trails can be a serious issue however the weather was cool and the nights on the rim downright cold. Therefore, we opted to just get up very early and make the drive from Lee’s Ferry, where we left our motorhome, to the trailhead. We started at the Saddle Mountain Trailhead about 7:30 in the morning. 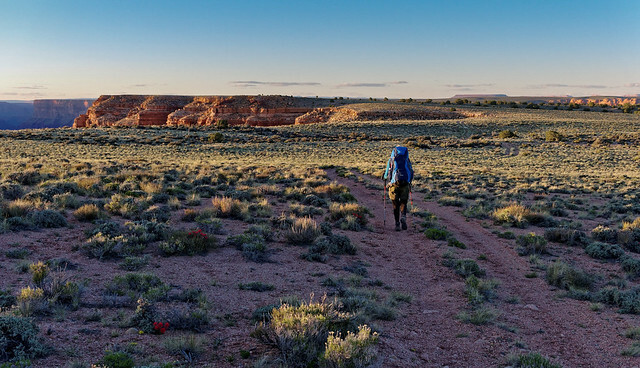 It is 3.5 miles from this trailhead to the park boundary and about another 7.5 miles to Nankoweap Creek where we planned to camp for the night. 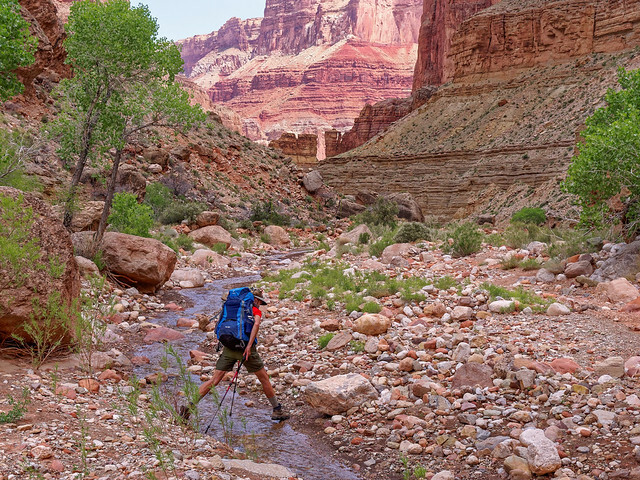 There is no water along the way and we have read accounts of people dry camping at Marion Point or on Tilted Mesa but we planned to go all the way to the creek. However, we did decide to carry extra water to cache for use on our hike out so we were both carrying a additional half gallon of water. 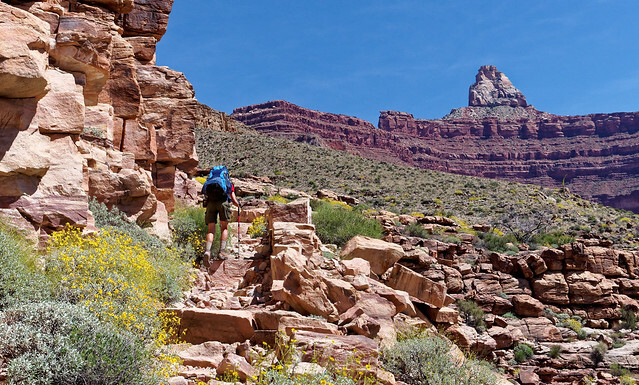 The trail first crosses a plateau and then descends down a broad but rocky trail. After it crosses a gully it then climbs back up. 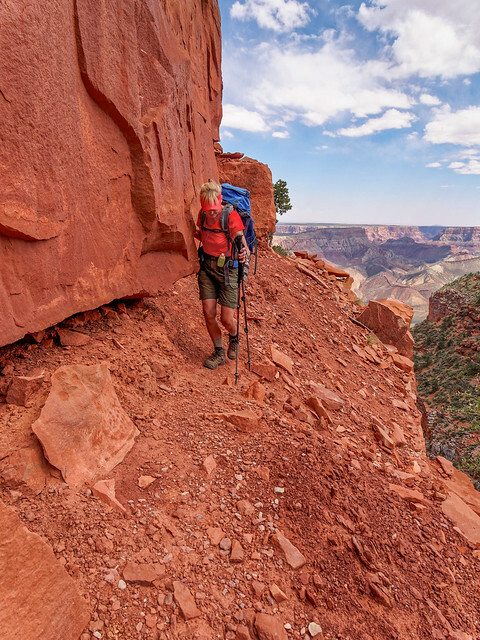 After reaching the National Park boundary the quality of the trail begins to deteriorate becoming steep and brushy as it descends partway into the canyon. We were relieved to finally reach what is affectionately known as the “endless traverse”. 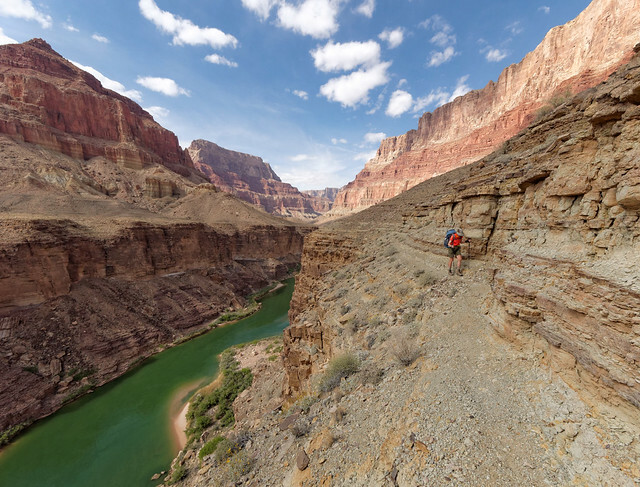 But this is where we would encounter the exposure the trail is well known for. I have been apprehensive about doing this trail. 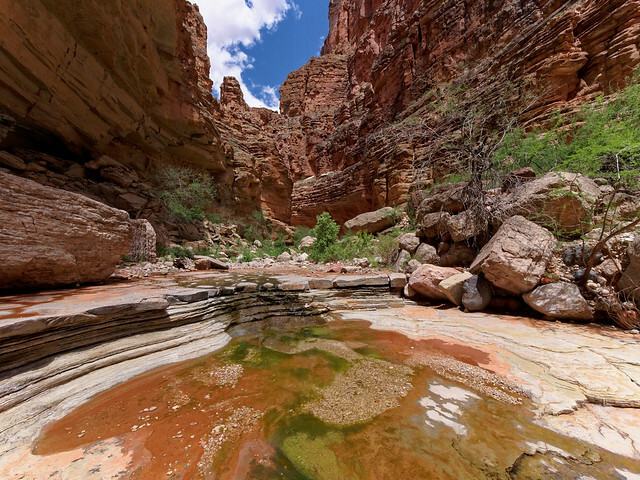 The Grand Canyon National Park Service Trail description states it has “... significant exposure in places. This trail is not recommended for people with a fear of heights... 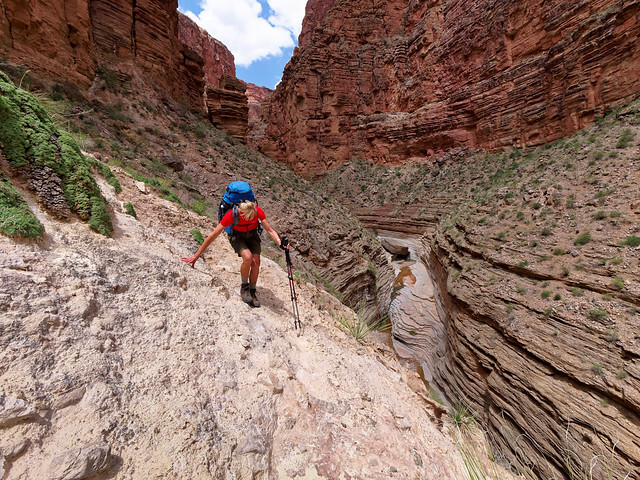 This trail is classified as MOST difficult of the named trails in Grand Canyon”. I do have a fear of heights and am a bit clumsy so I occasionally trip and fall. However, I was very careful with foot placement and had no trouble. John, on the other hand was quite comfortable and moved faster than I did. After about 5.5 miles we reached Marion Point where we cached our extra water. Our packs then felt much more comfortable. We continued on and eventually reached a spot that made me a bit more nervous. Some trip reports I’ve read about hiking this trail have referred to the “scary part”. 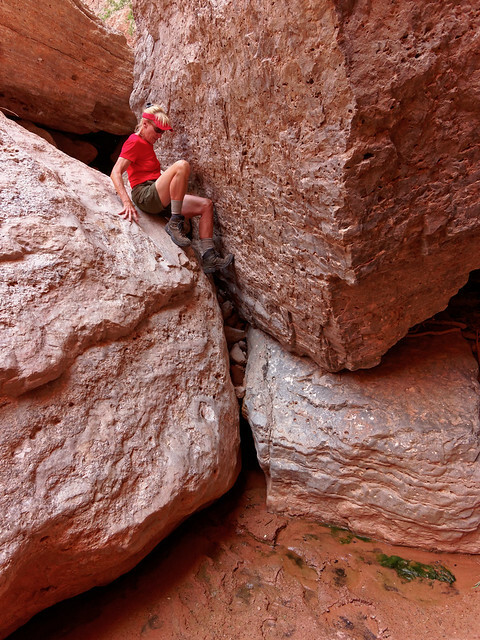 The photo I've seen didn't match this spot where one must slip around a rock that juts out a bit. I don't know where the "scary part" that others have referred to is but I had no real trouble getting around this spot. The views from the trail were quite good. We could look back to Marion Point, look ahead toward Tilted Mesa and down into the valley toward our destination for the day. 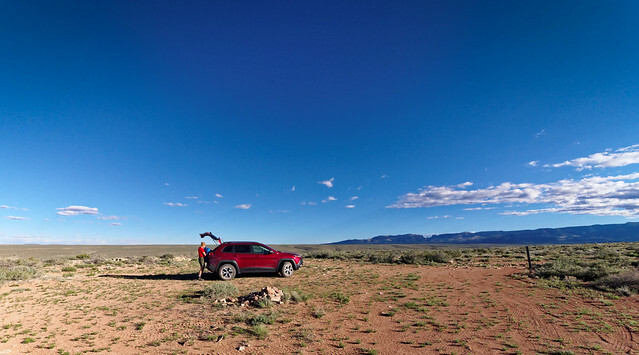 While the traverse does truly feel "endless" intellectually we knew it would eventually come to an end. Still it was reassuring to actually see it in the distance. 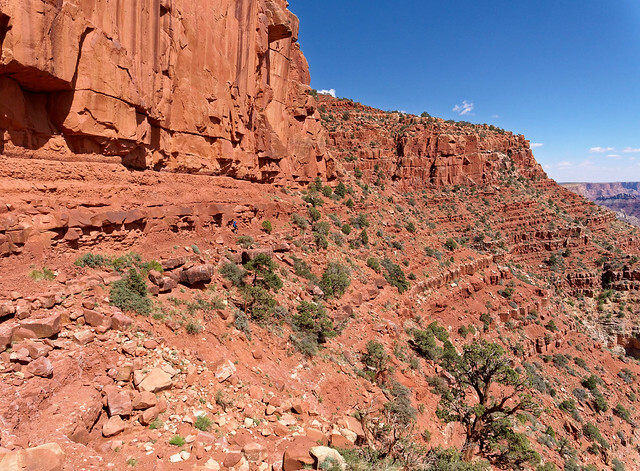 Once we reached Tilted Mesa we knew it was time to descend the rest of the way into the canyon. And the trail wastes no time. There are two short down climbs early on that I needed to remove my pack to do. Fortunately there are conveniently located trees to assist. But the trail doesn't go straight down and gave us ample opportunities to enjoy the views. However, we had to lose the elevation sometime and we encountered the sections of trail that contribute to the Nankoweap being labeled as the "most difficult" trail. ... enhances the beauty of the natural surroundings. We finally reached the bottom and set up camp not far from the creek. The next morning we headed down canyon along Nankoweap Creek. There is no trail. One just takes the path of least resistance. For the most part the going is quite easy. As it is only about 3.5 miles down to the river we arrived at the beach early in the day. We felt fortunate to find a camp site with some shade as it was quite warm. 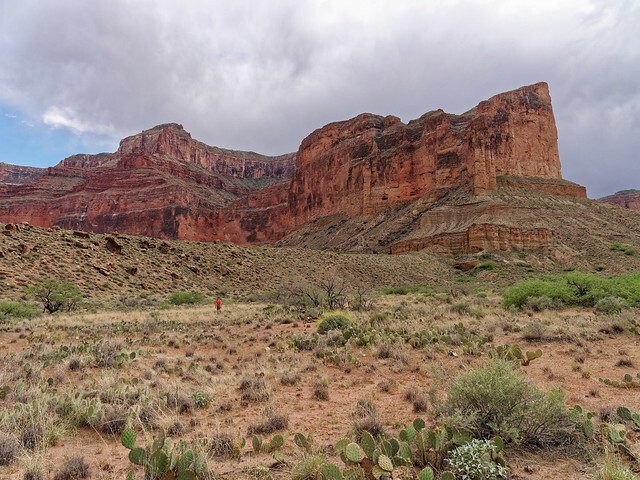 After setting up camp we did the short dayhike over to see the ancestral Pueblan granary situated high above the canyon floor (about in the middle of the large rock to the right). 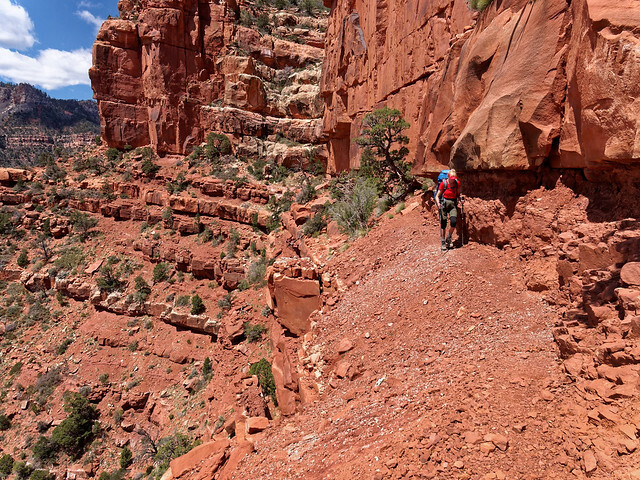 The trail up is initially steep and loose but moderates as one nears the ruins. It is a stunning archeological site as well as a beautiful sight! It is difficult to imagine what it took for people to be able to live in the area. I wonder if they ever got tired of the view. I don't think I would. 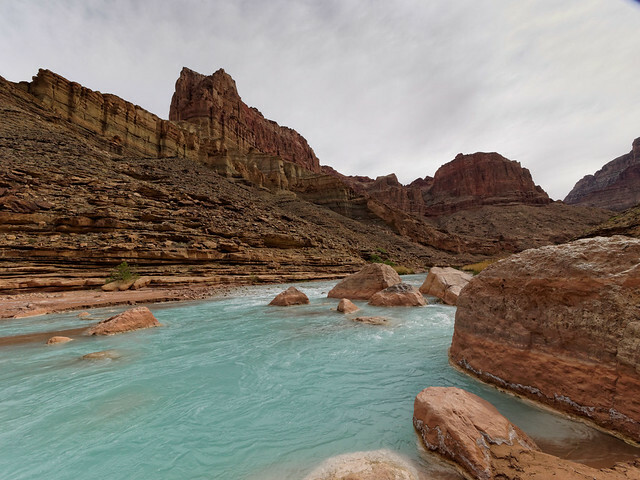 We always enjoy being near the Colorado River and have really appreciated the fact that when we have had to rely on it for our drinking water it has always been clear rather than muddy. As we were camping two nights at the river the next day was a layover day. 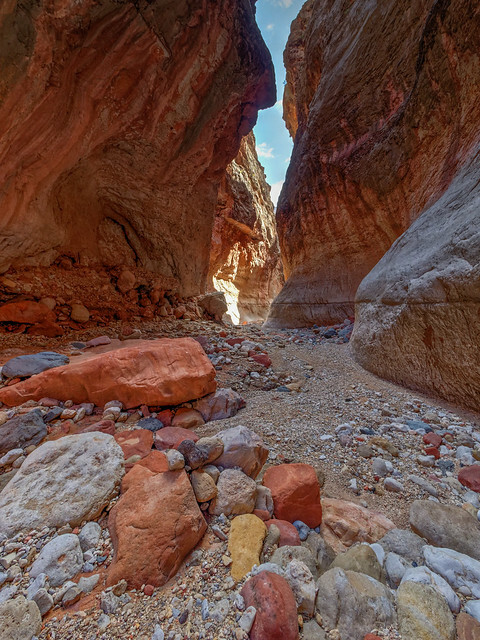 We took the opportunity to explore up Little Nankoweap Canyon. 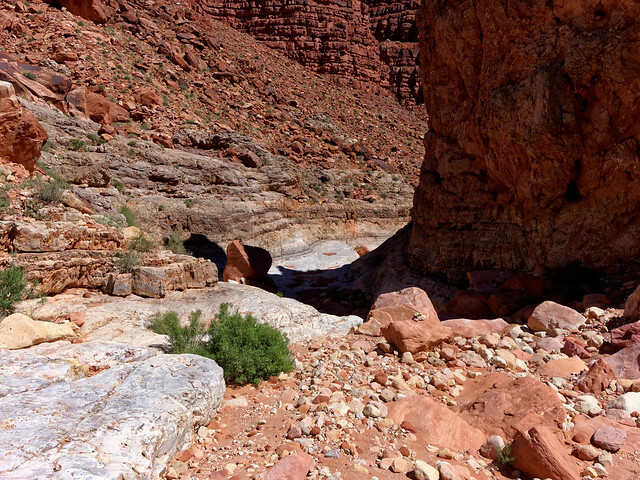 The canyon becomes more narrow and provided opportunities for me to go into "4-wheel drive" (AKA crawling). We explored until we reached a pour-off that I was uncomfortable climbing up. John continued up a short distance while I waited below. 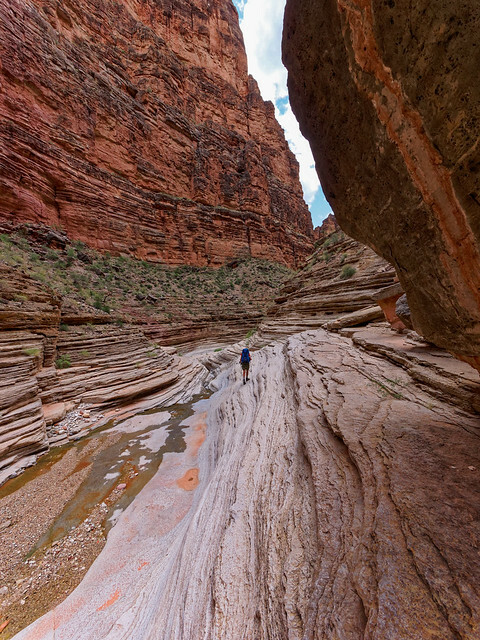 Every side canyon in Grand Canyon National Park is unique. 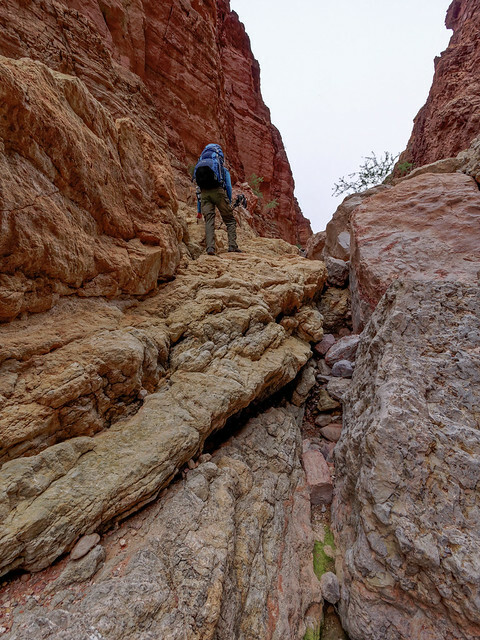 Some are expansive such as those we encountered while backpacking on the west Tonto Trail and some are narrow and intimate like this one. All are beautiful in their own way. 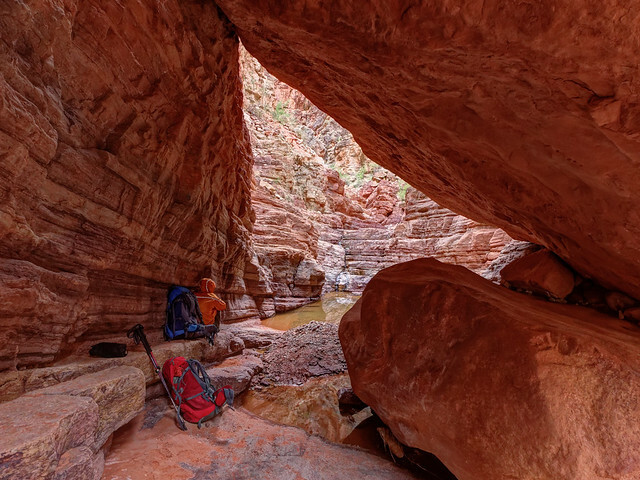 On our way back to our camp we were a bit surprised to find this well developed trail and decided it had been constructed by rafters who regularly stop at Nankoweap Canyon to do some exploring. 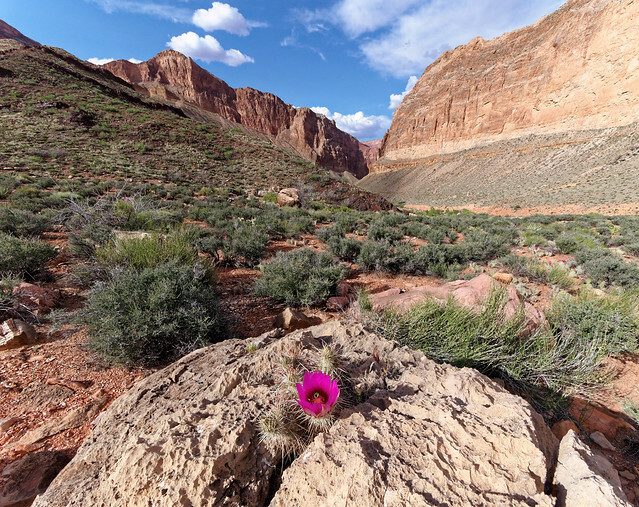 Spring, when the wildflowers and cacti are blooming, is a wonderful time to be in the canyon. 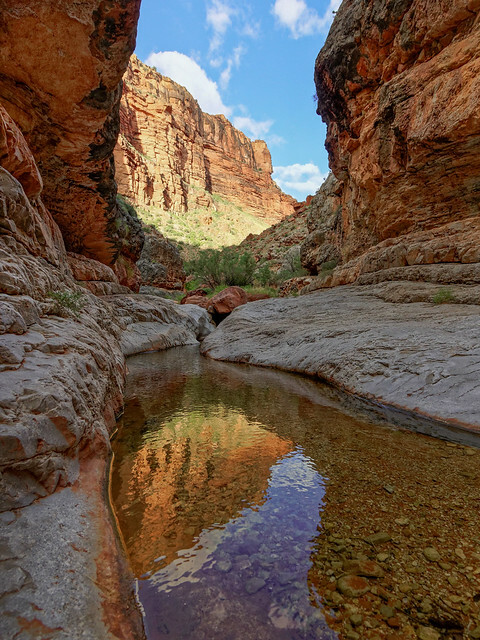 The next morning we hiked the short distance back up Nankoweap Creek to camp again. We found a lovely spring and decided to get some water. Over the years we have used a variety of methods to treat our water. We used Iodine tablets for many years, then Aqua Mira and then a pump/filter. Each had its problems. What we have used for the past four years, and have been quite happy with, is a SteriPen (batteries are most economical from Amazon). ... and set up camp in a bit of shade. 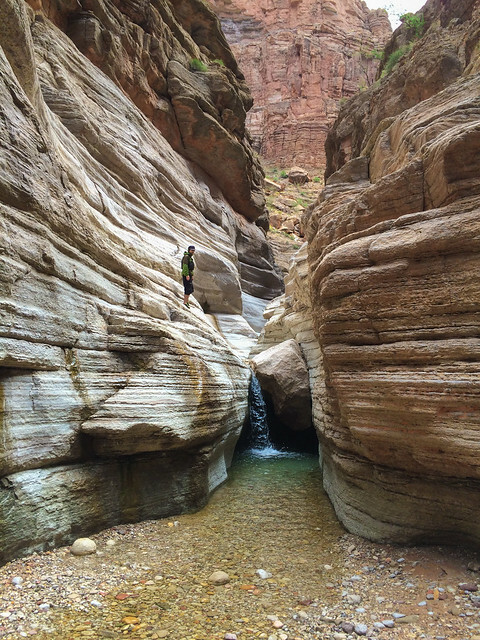 We explored up the canyon looking for a spring. While the water from Nankoweap Creek wasn't bad we had read that the water from the spring was better tasting. However, we were unsuccessful. We returned to camp where I got comfortable and John headed out with his camera. One advantage of traveling with a photographer is you get to see more the area around you even if you aren't motivated to get up and go see it for yourself. 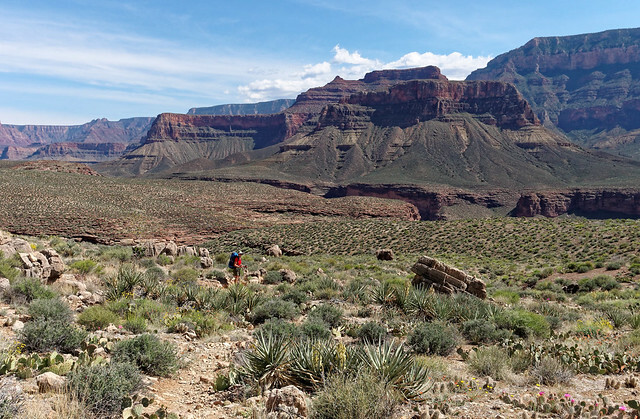 We got an early start the next morning as trails from the North Rim are notoriously hot and lack shade. Fortunately, as we had cached water at Marion Point we were not unduly burdened. Still it was slow going up the sometimes steep and loose trail. We were surprised to see this amount of construction on this more obscure trail. It is classified as an "unmaintained trail" but we found it to be in reasonably good shape. Once again we were treated to expansive views. We were happy to reach the "gate" that marked the end of the steep uphill portion of the trail. It was then time to get back on the "endless traverse". We again reached the one spot that made me more nervous. It really is not as bad as it looks. With Marion Point not far ahead we knew we were nearly half way back. We stopped briefly there to recover our cache of water. We continued and eventually reached the end of the traverse and had to climb back up the steep brushy trail to the National Park boundary. We then retraced our steps on the Saddle Mountain Trail and that last rocky climb out of the gully was surprisingly arduous. Neither of us had remembered it and perhaps the reason it seemed so bad now was that we were just tired. After all, we had just completed the "MOST difficult" trail in the park. All of our photos from this backpack trip are on Flickr. 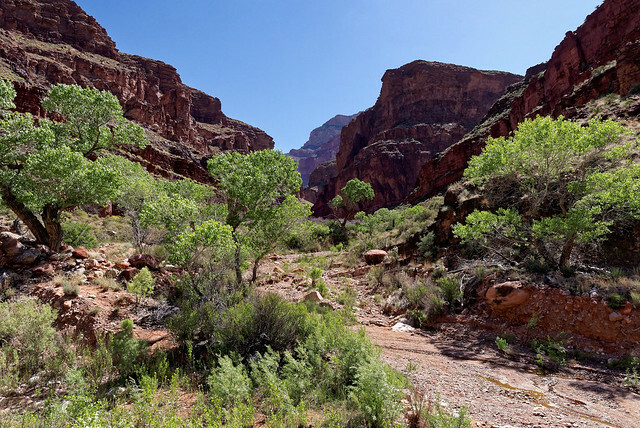 The next trail we planned to do was the South Canyon Trail. 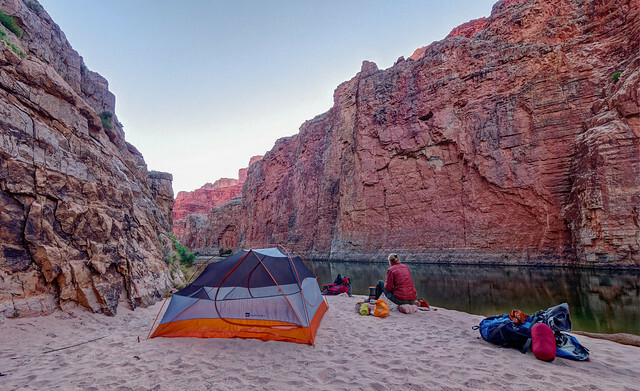 This would be a short 2 day/1 night trip and we would camp at the river. I’m glad we did this trail after Nankoweap as I would have been even more anxious about it if it was supposed to be worse than this one. 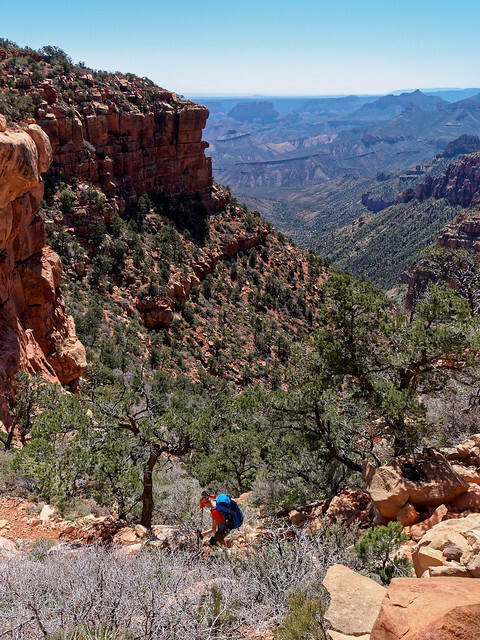 I assume South Canyon was not in contention for a "difficult" trail designation as it is only 6.5 miles. Although in our opinion it seemed much longer because it is so slow. 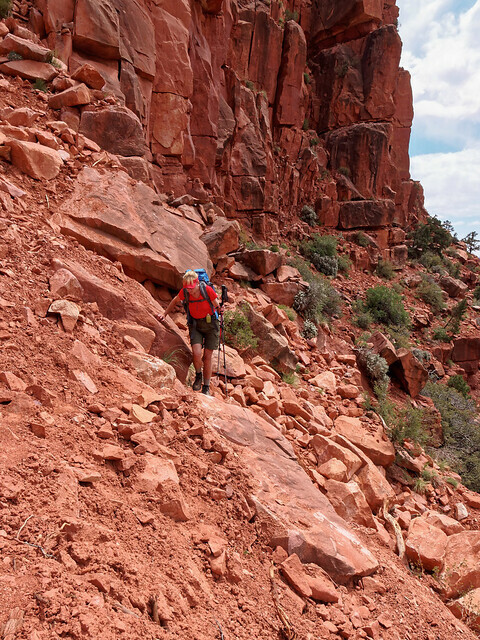 The Park Service Trail description does a good job describing it - “steep and loose, minor route finding, lack of meaningful trail, and many miles of ankle-twisting drainage bottom walking”. But it still does not accurately convey the actual experience of hiking it. We had gotten some less than positive remarks from rangers when we mentioned we would be doing it. A ranger at Bright Angel Campground, Bil (with one l) Vandergraff, said “Go to the trailhead and walk over to the rim. Look down to see if it is a trail you really want to do”. 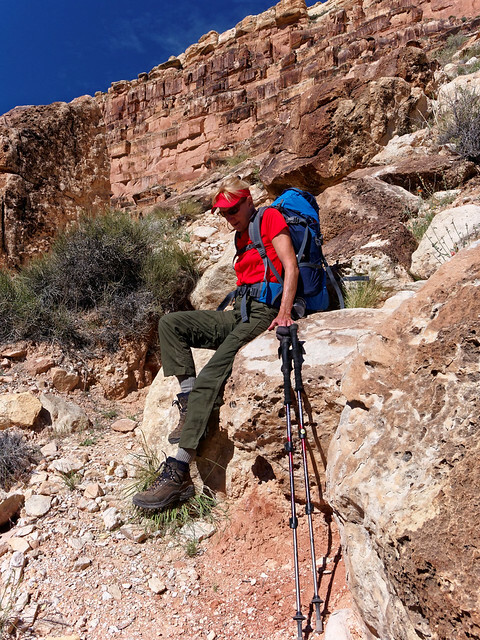 And a ranger we met while on the Nankoweap Trail recommended that we do it as a dayhike as she had. She said that at the time she was relieved to not be carrying a heavy overnight pack. We considered that but we prefer to be in scenic places late in the day as well as early in the morning so John has more photo opportunities. 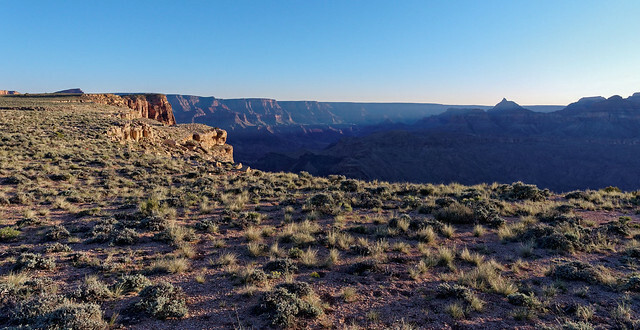 We also want to have more time to just enjoy being in the canyon. We again left our motorhome at Lee's Ferry and did another early morning drive to the trailhead. It was cold and windy so we were both bundled up. We did the short walk to the rim and then looked down. We didn’t know it at the time but we were looking down on essentially the entire trail. Yes, it looked steep but we were undaunted. Not all of it is visible in the photo below. However, there is an orange knob visible at the bottom of the photo. 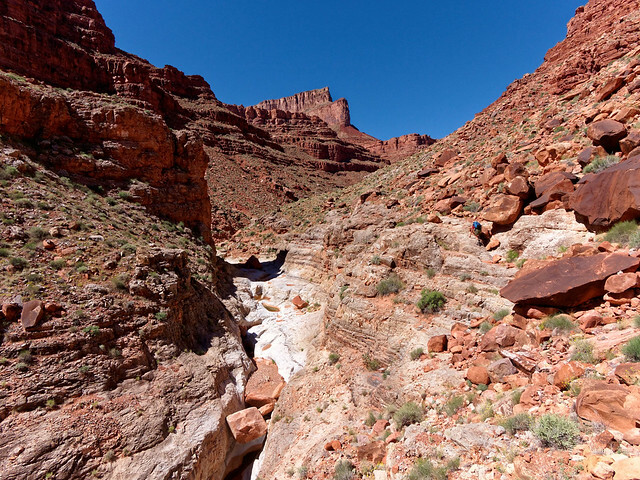 The trail comes from the left of it, crosses it and descends through the broad chute immediately to the right of it. 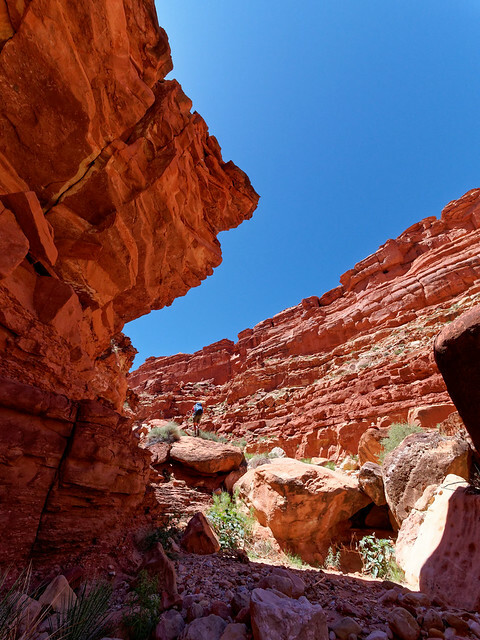 The trail starts its steep descent through a narrow chute. Once out of the wind we warmed up and could shed clothing. We had an excellent view of our route down the canyon. It looked so easy from above but I was reminded of that part of the description - "many miles of ankle - twisting drainage bottom". The first part is quite steep and there are definitely lots of loose rock. I used my trekking poles enough to put up with them getting in the way on the more “climby” parts. We took a short break at the “scenic overlook” (that orange knob). The trail continues down to a pour-off in the limestone. John felt comfortable down climbing the steeper section of this feature wearing his pack but I did not so we used a rope to lower it. In hindsight John decided it would have been faster for him to just come back up and carry my pack down. 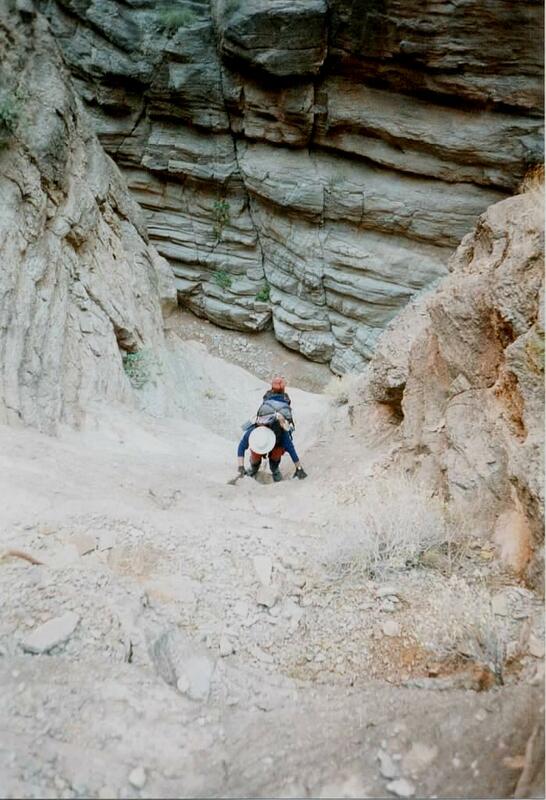 It took us a long time to reach the bottom of the canyon. It was such a relief! But there is no clear trail or route and we initially had to fight our way through some brush. 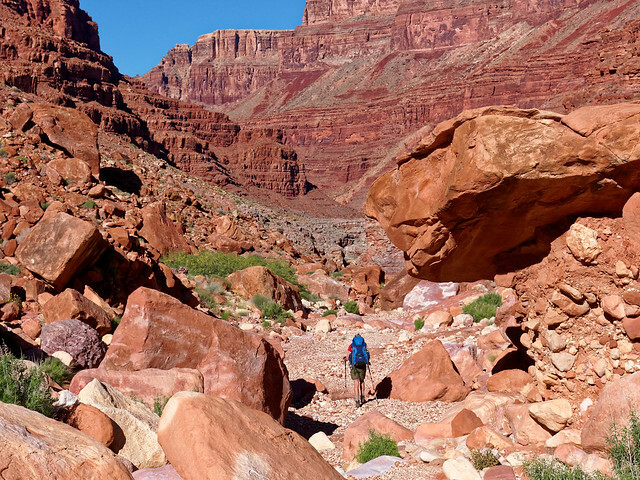 Fortunately the canyon does open up a bit but one must then contend with the many boulders strewn among the "ankle twisting" rocks. It was very slow going and we had some route finding issues. We had to keep an eye out for bypasses around obstacles and fortunately they were mostly marked by cairns. I kept looking for recent boot prints to help us with route finding but only saw some disturbed sand. It just so happened to be my 61st birthday. We were stopped for lunch when John excused himself for a few minutes. I didn’t give it a second thought. But he soon came back into view carrying two chocolate cupcakes with the numbers "6" and "1" on top. I couldn’t make sense of what I was seeing! 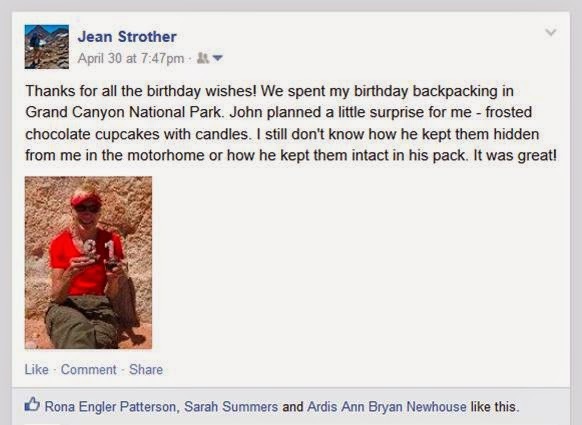 I still can't imagine how he kept them a secret in our modest sized motorhome or how he snuck them into his pack not to mention how he kept them intact on the rough trail (he did try to light the candles but it was simply too windy). 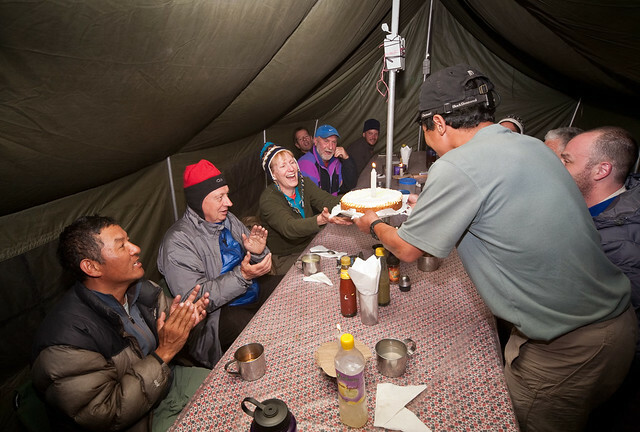 It was an even bigger surprise than when I was presented with a birthday cake while trekking in Nepal. After eating the cupcakes we eventually got going again. At times we were treated to some broad open surfaces to walk on and it was sheer pleasure. 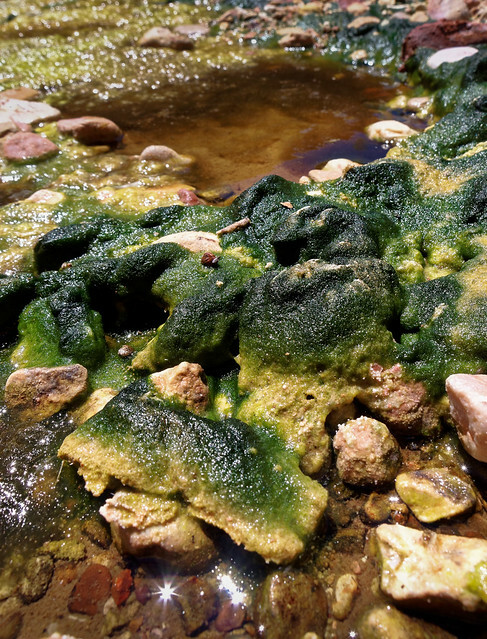 We saw some water in stagnant pools rich with insect larva. Not a problem for us as we were planning to get water from river and fortunately the river was still not muddy. However, some pools did appear much clearer. 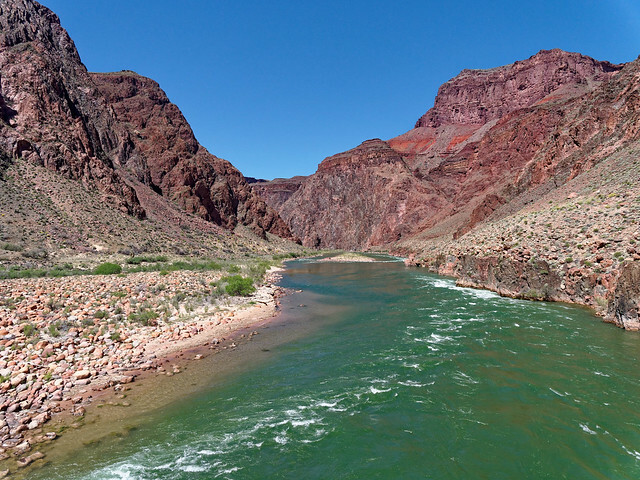 Water within Grand Canyon is such a valuable commodity and not to be taken for granted. You always want to know where the nearest water is and it was reassuring to know there was something to drink nearby if for some reason we couldn't get all the way to the river. We were not too concerned about our slow pace. After all it is only 6.5 miles to the river. 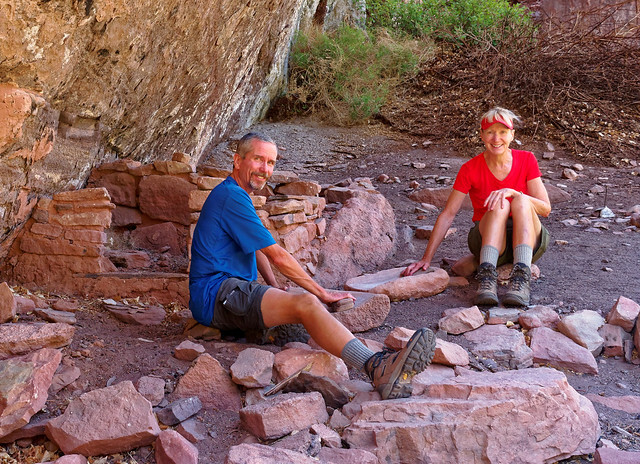 There were quite a few ledges with some tempting shade so we took long breaks, something we tend to do. 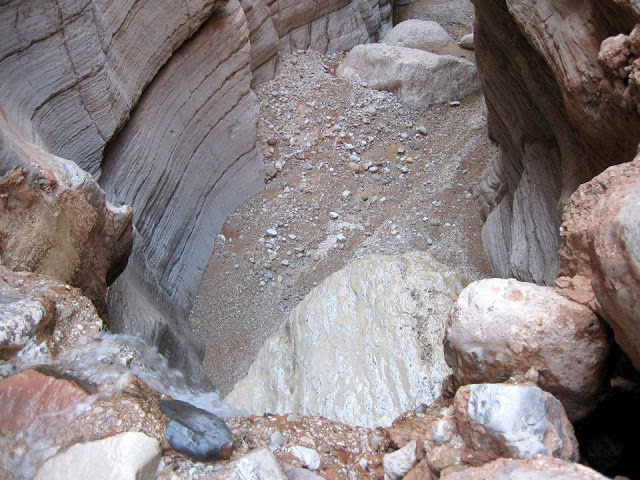 At one point we reached a broad tall pour-off and nothing we would ever want to climb down. 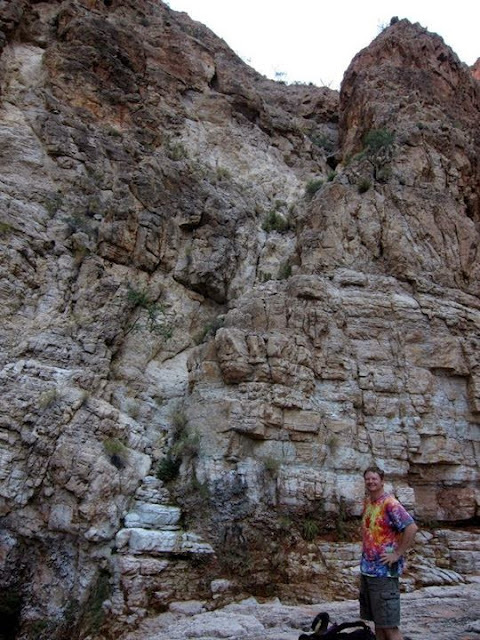 ... before descending back down to the canyon floor. ... and I followed some obvious cairns that led up to the right. Before too long I rounded a corner and was confronted with the body of a dead eagle. I should have taken it as a sign that this was not the way. But I didn't. 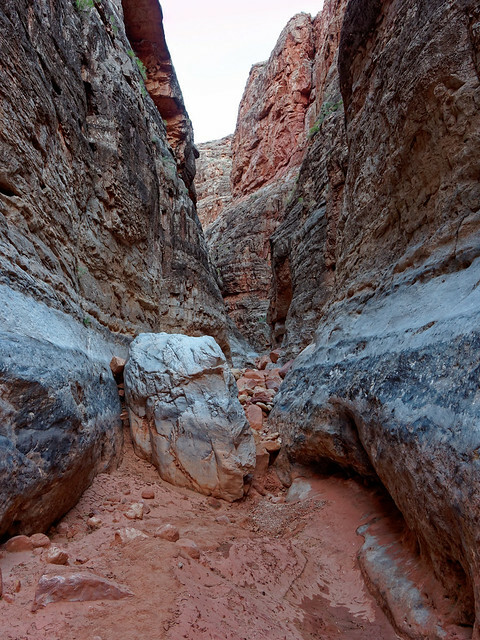 We continued on until we reached a chockstone in a narrow portion of the canyon. My heart sank. I had never been confronted with anything like that before. We thought that we might be able to “chimney” down it but I was doubtful that I had the skills necessary to get back up it. We were stymied. 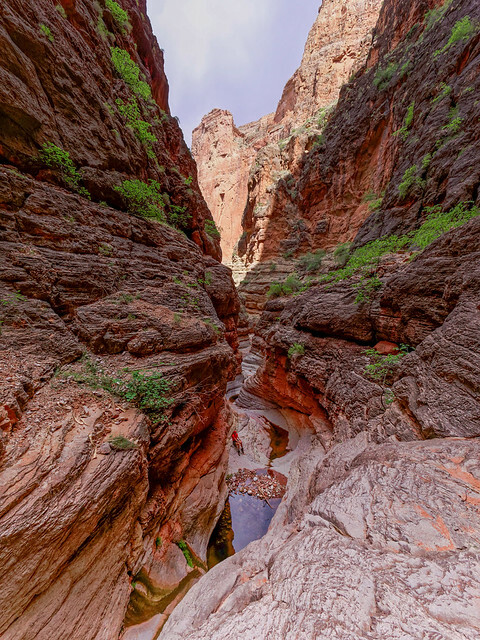 But John reread the trail description which states “A cairned path leads up and around the Redwall narrows on the left side (north side) of the canyon. 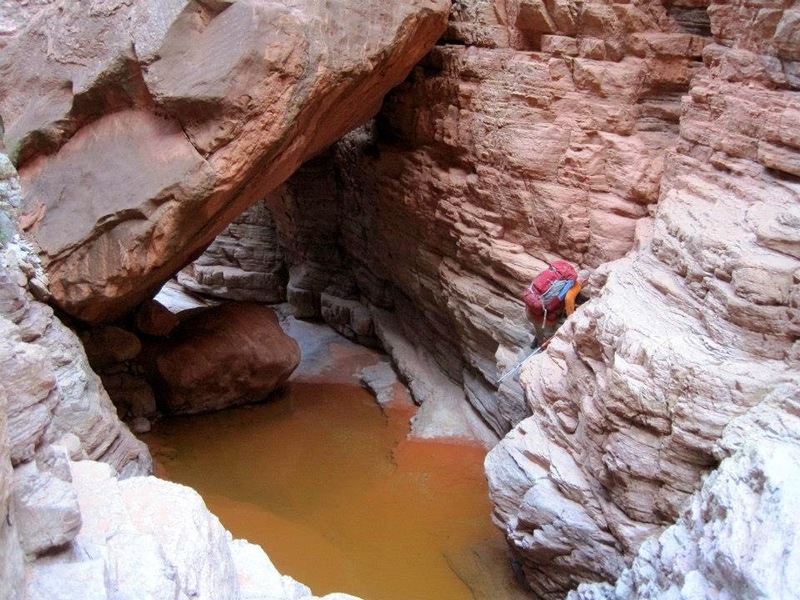 This traverse is loose and crosses several small ravines”. 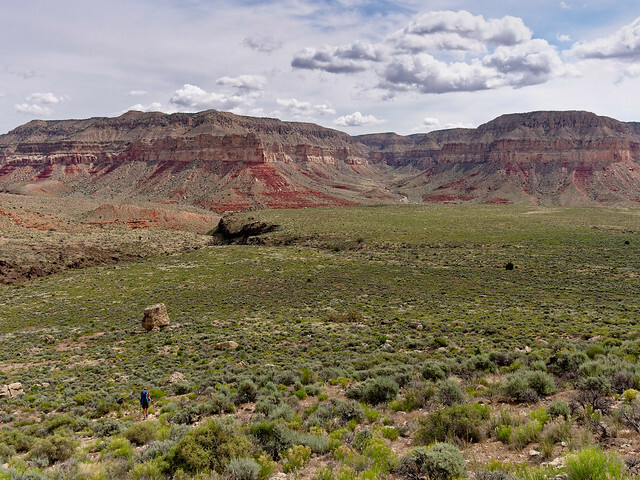 So we backtracked and found the cairns off to the left (facing down the canyon) just a ways up the canyon from the misleading Redwall ledge. When you get to this spot in the photo below it is time to look for the bypass. 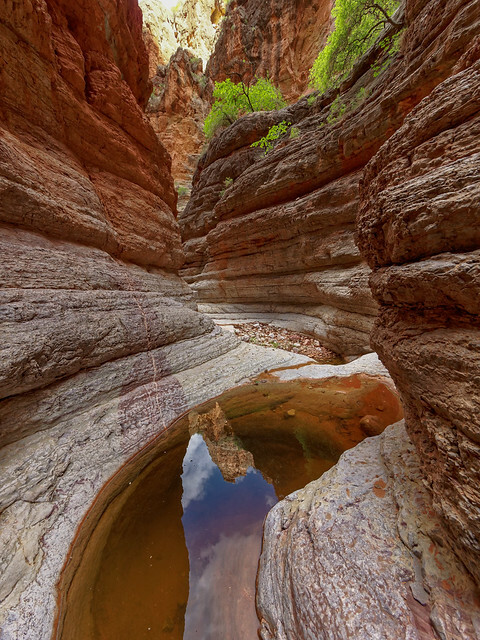 If you have time you could continue exploring down canyon. If you are adventurous then you can probably get to river that way. If you do then you can be confident that there is a bypass in case you can't get back up the same way. But if you want to take the bypass on the way down then look for the cairn on the big rock. I am pointing up toward the bypass in the below photo. 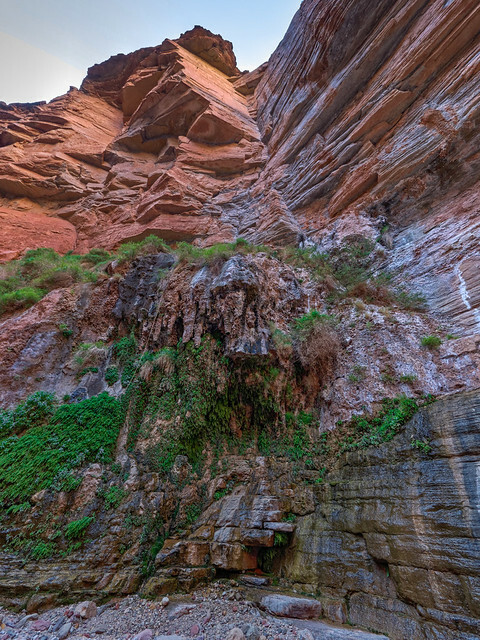 This bypass trail leads up above the Redwall narrows. After the hours spent picking our way over and through rocks it was a joy to walk on a pretty good trail. 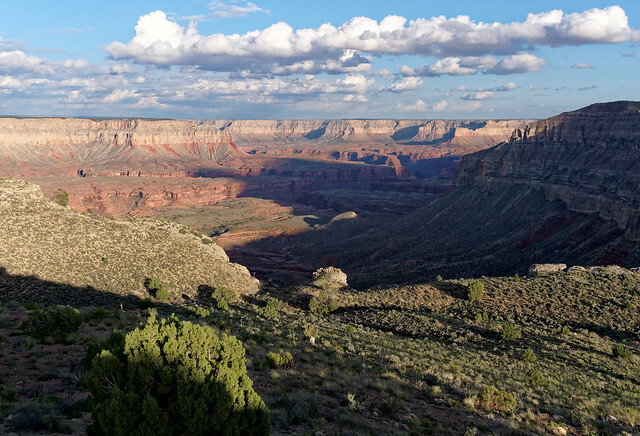 However, we had lost about an hour going too far down the canyon and were running out of daylight so we couldn’t dawdle. We were now paying for all those long breaks we had taken. We got to the beach with enough light to enjoy the sight of the Redwall (stained by the varnish which gives it its name) rising directly out of the river. We have been to the river many times before but it has always been further downstream where the river is well below the Redwall. I hadn't expected to get such a unique view and it made the trail worth doing. The next morning we got a much better view of this unusual sight. ... or down, the Redwall is a very imposing presence!. John headed downstream to take some photos. 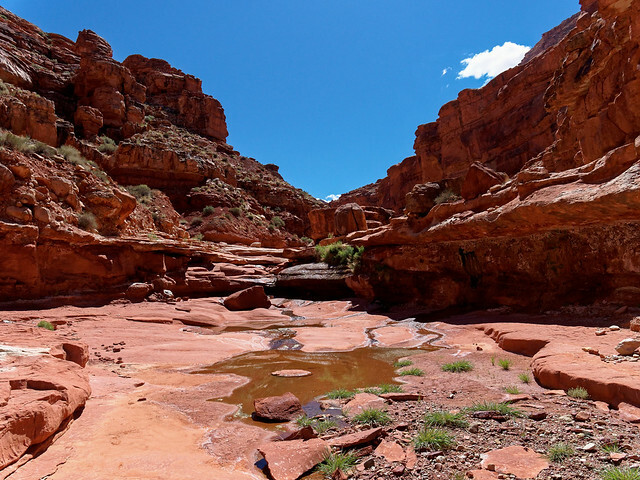 One of the highlights of this hike is supposed to be visiting Vasey’s Paradise located downstream from where we were camped. 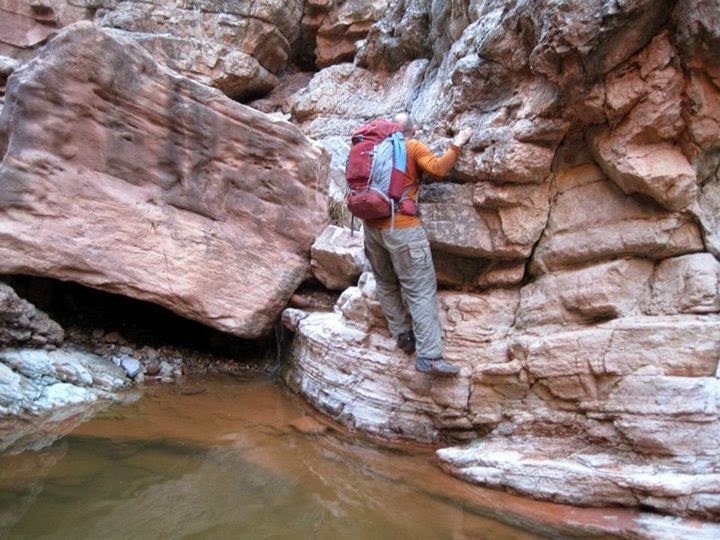 However, in order to get there one must cross very sloped (toward the river), and potentially wet and slippery rock (partially shaded in the photo below). In addition there are warnings about Poison Ivy. He chose to not give it a try largely due to a lack of time. However, those on boats have good opportunities to see it without the risks. ... but quickly encountered a chockstone. He didn't want to take the time to see if he could get up it so he turned around. Even though we had only 6.5 miles to hike out he knew they would again be slow miles. If you arrived at the river via South Canyon but you want to take the bypass back up then head upstream nearly as far as you can go. Then look through the trees for a cleft in the rock. Climb up it and you will soon see the trail The hike out affords one continuing views of the Redwall and river but now in brighter light. 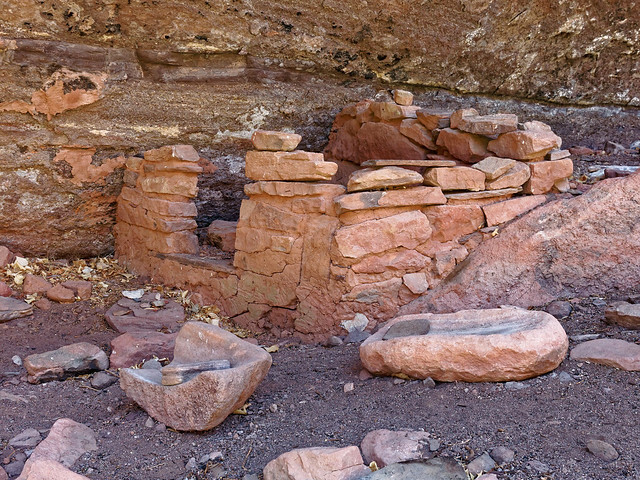 Once on the ledge above the river the trail passes the remains of a structure (ancestral Pueblan I presume). 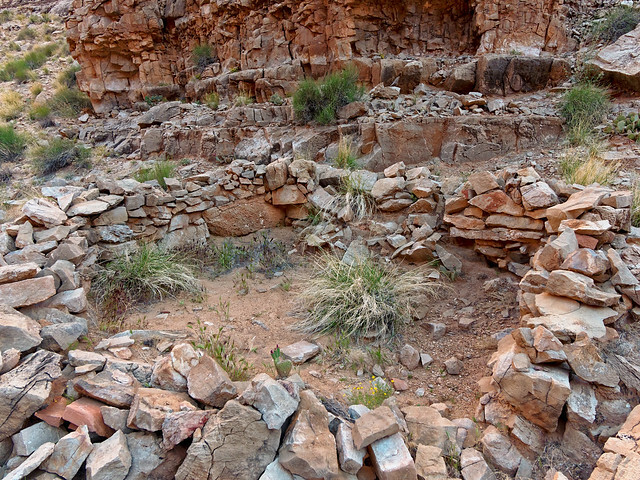 While some of the rocks are still held together with the original mortar most of the rocks appear to have been stacked by well intentioned but misguided modern day visitors. 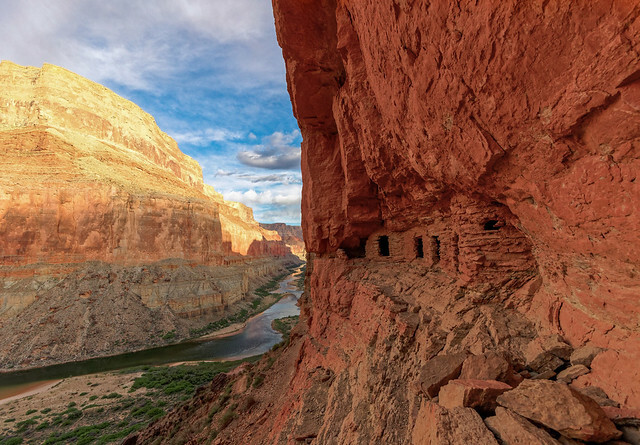 The Park Service does its best to instruct visitors to look at artifacts left by the hardy people who inhabited the area in the past but to not damage or remove them. I'm assuming they would prefer that structures such as this one are not rebuilt. 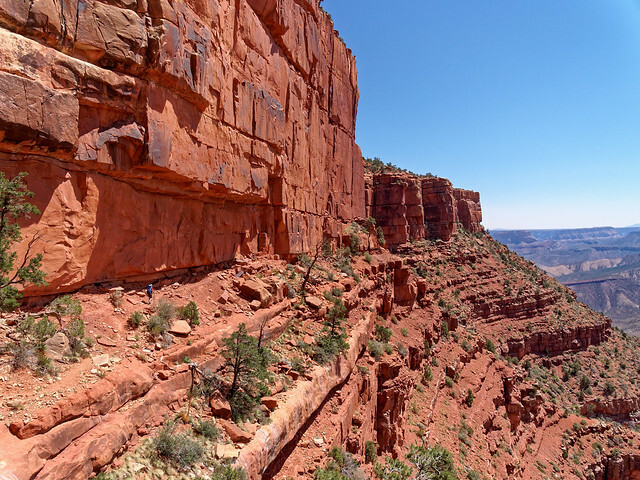 As we headed back on the bypass (I am just visible on the trail toward the right) we began to get views up the Redwall (back to its natural grey color) narrows below. 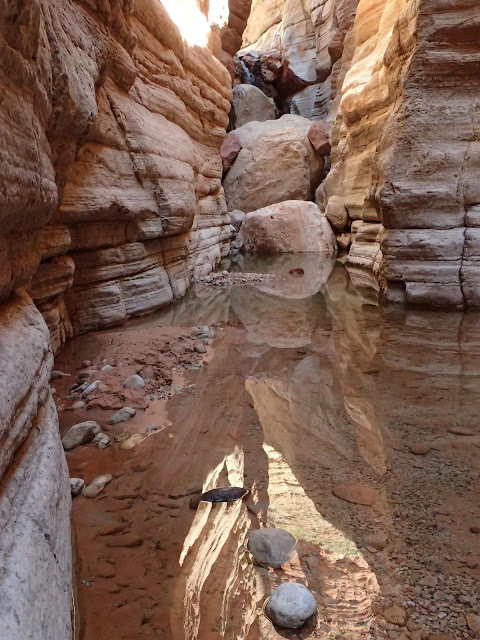 While South Canyon does offer some challenging hiking it also has its own unique beauty. Even though we had already found our way past all of the obstacles the day before they simply look different from below so it still takes just as much time. We finally reached the point where it was time to begin the steep ascent. 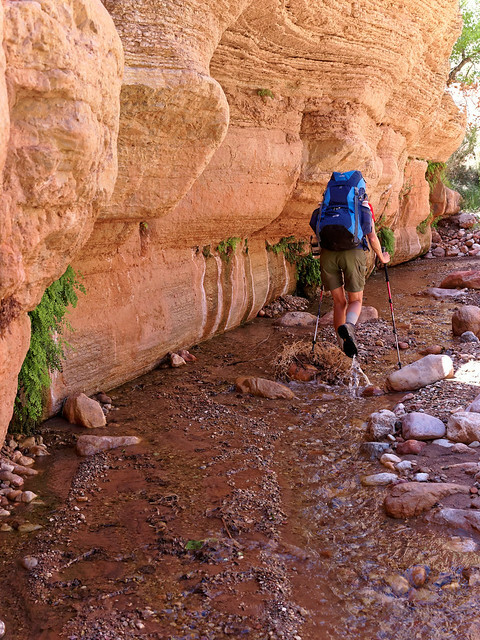 I used my trekking poles for a bit but found they got in my way too much so they got strapped to my pack. Once again I got to go into "4 wheel drive". In my opinion crawling is an under rated mode of locomotion. We were happy to finally reach the trailhead and welcomed the sight of our Jeep. Even though we had been in that location just the morning before it was still a shock to be in such wide open country. What a contrast to being within canyons. All of our photos from this backpack trip are on Flickr. 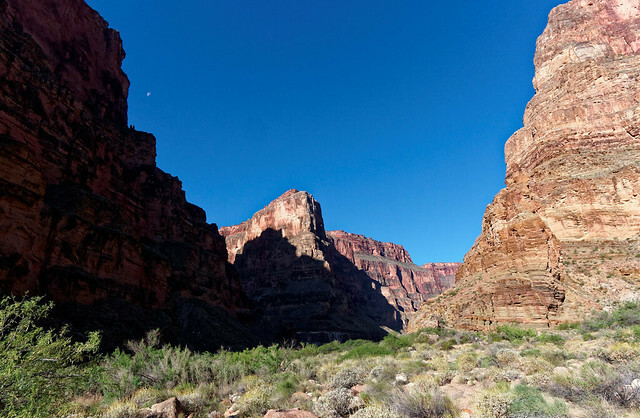 As I mentioned before we have been working on a project to hike every trail in Grand Canyon National Park. One trail we have not yet done is the Tuckup Trail. This is not an easy trip to plan because there are transportation challenges, water issues and route finding concerns. 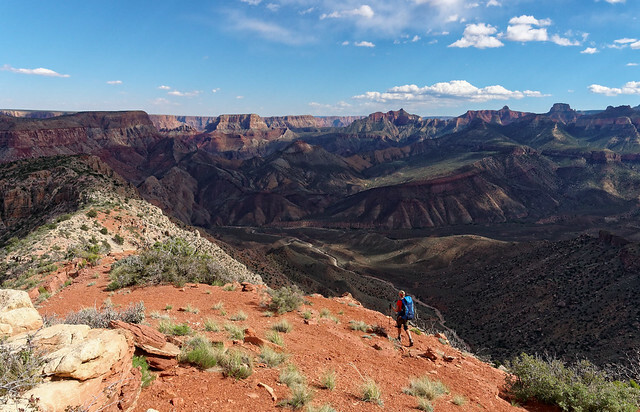 We will keep working on trying to figure a way to do this trail but in the meantime we decided to console ourselves with something a bit more adventurous in Grand Canyon. 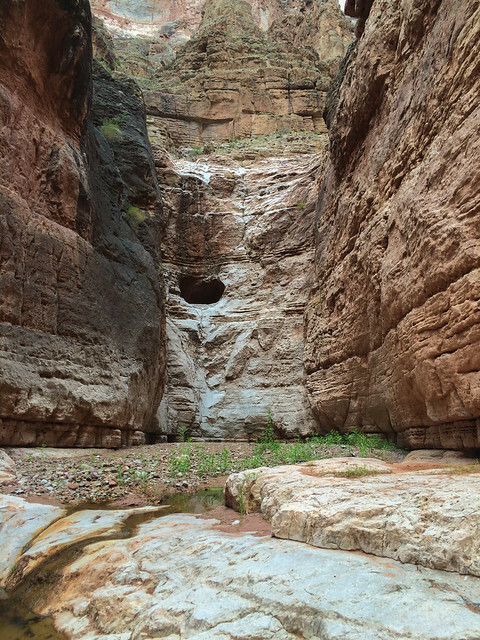 Our plan was to hike down Tuckup Canyon, follow the river downstream and hike up Stairway Canyon. 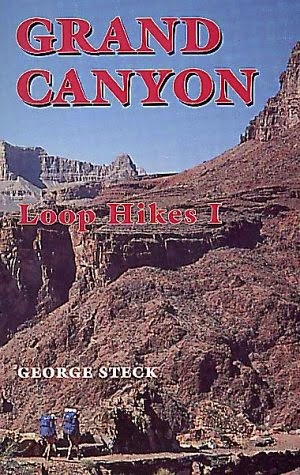 This is an unofficial route but it has been described in a book by George Steck, Grand Canyon Loop Hikes which contains this description of the route. In addition to Steck’s book we read trip reports by a woman, Stacy, on her blog, Go Carefully, and a fellow, Rich Henke, on SmugMug. We also searched the Grand Canyon Hikers Yahoo Group and sifted through the large number of posts for helpful information. This trip was more adventurous than anything else we have done in the canyon. However, as we had hiked nearly every trail in the park we thought we were up to the challenge. We had read that having a rope would be useful for lowering and raising packs. 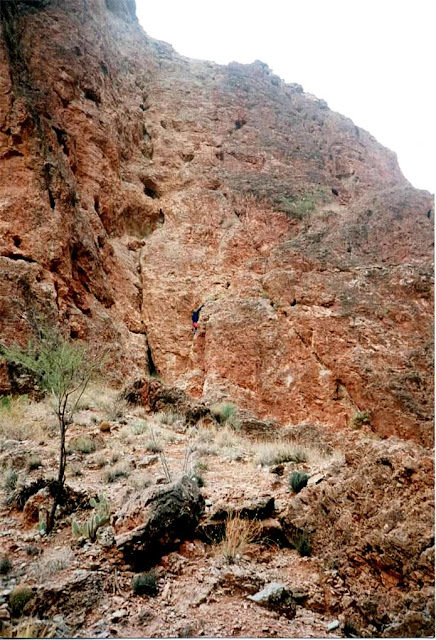 We had also read that there was an impressive down climb near the mouth of Tuckup Canyon. I was anxious about this and to assuage my fears John suggested that I rappel down it so he brought 60 feet of rope, 20 feet of webbing and a harness. We also took water shoes as there had been recent rain and our preference was to keep our boots dry. In addition, as our camp on the fourth night would be dry we carried extra water bottles. We could each carry nearly two gallons of water. And we both had our iPhones with Steck’s book and several trip reports loaded as PDFs so we thought we were well prepared. 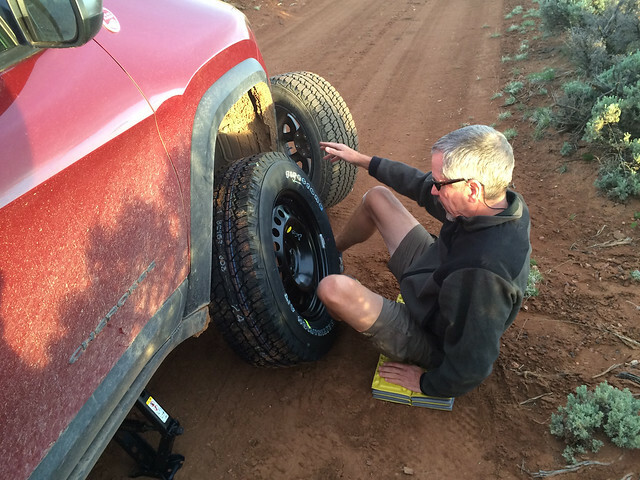 "Bring tire plugs and a portable air compressor to repair flat tires. Ensure you have enough fuel, full size spare tire, jack/lift, and owner’s manual. Tow service costs $1,000–2,000 and assistance is not guaranteed ...". Given that I suppose we shouldn't have been too surprised when we got a flat tire. Fortunately the rain held off long enough to change it. We continued on our way to the trailhead but we had lost valuable daylight. Once we reached the National Park boundary we noticed that the road deteriorated significantly and it would be getting dark before long. Therefore, we decided to back up and camp in a large clearing located just outside of the park. We also decided it was unwise to continue farther down the road without a spare and we were becoming more concerned about the weather. Therefore, we decided to return to town the next day, get our tire fixed (or replaced) and get a new permit. So Two days later we again made the long drive to the trailhead with plans to camp there so we could get an early start. We drove on Highway 389 to the Toroweap turn off. We then drove on this road for 31.6 miles to the cutoff for June Tank Road. This is a wide, well graded gravel road and it took about 45 minutes. However, the last 16 miles took us almost one hour and 15 minutes. A high clearance vehicle is a must! It was a relief to finally reach the trailhead. 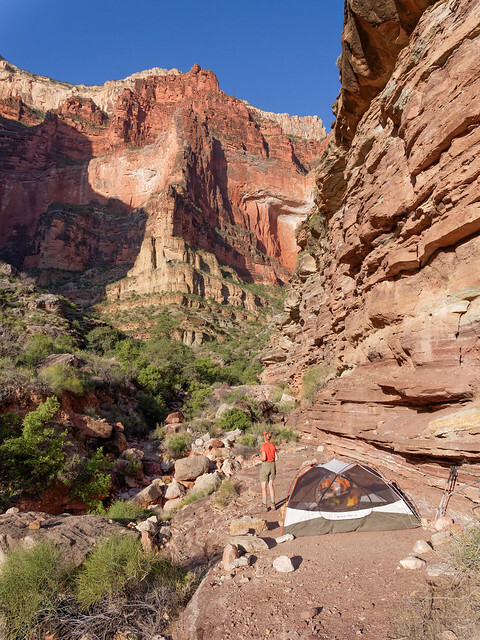 There are at least two good sized established campsites. ... and the beautiful evening sky. We were up early the next morning. 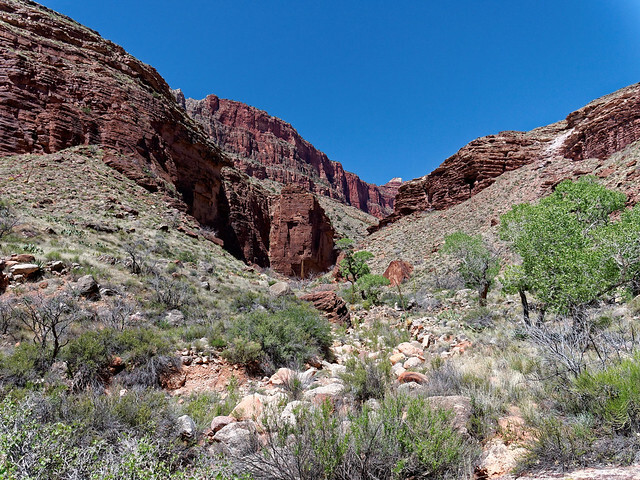 The descent into the canyon here is said to be the most gentle of all trails that go into the canyon as the trail initially follows an old road so the grade is gradual. We had read that there are many fossils in the rock and saw some really good examples. 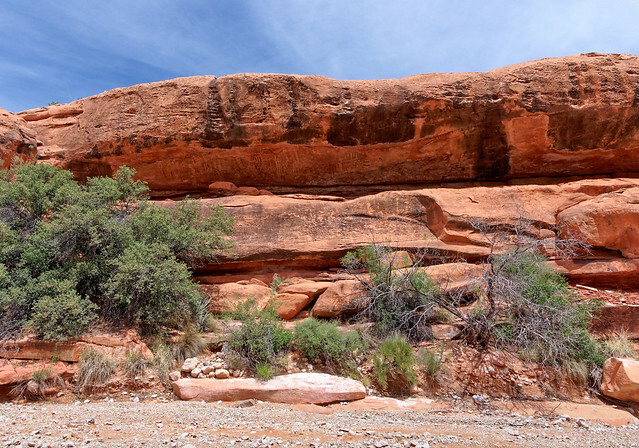 Cubicle Rock is a notable landmark which we would use when we completed the loop. We took the Tuckup Trail to the drainage that leads into Tuckup Canyon. According to Steck one can take a "shortcut" across the plateau (to the right in the photo) but we chose to not try that. 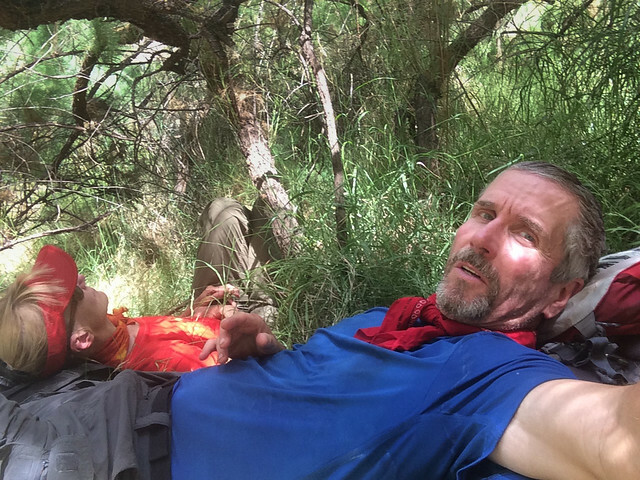 We had found the trail to be in good shape and believed it would be just as fast to stay on it rather than take off cross country and then have to hunt around for a safe way down to the drainage. ... as he wanted to find Schmutz Spring in case we needed it as a source of water on our way out. 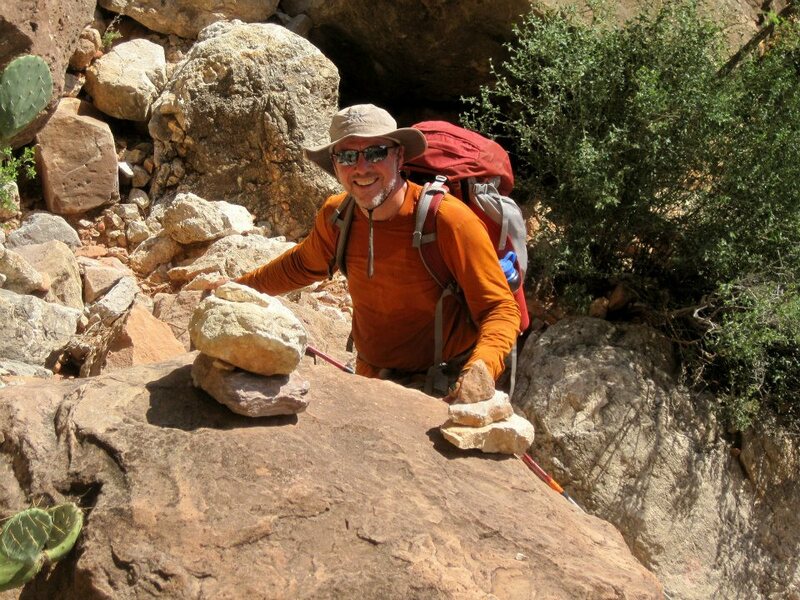 We continued on the trail until we encountered a cairn at a spot where it was easy to drop into the drainage. 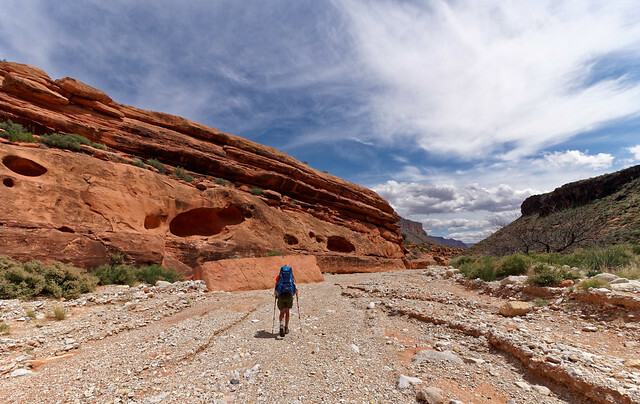 This route takes one to a popular destination for dayhikers - Shaman’s Gallery. ... others are deceptively simple. 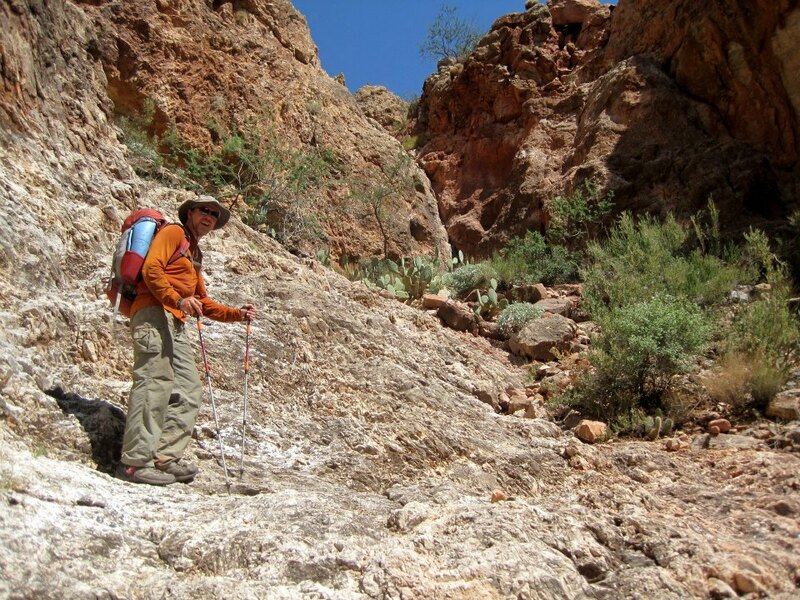 We continued on down the drainage toward Tuckup Canyon. Much of the walking was quite easy. 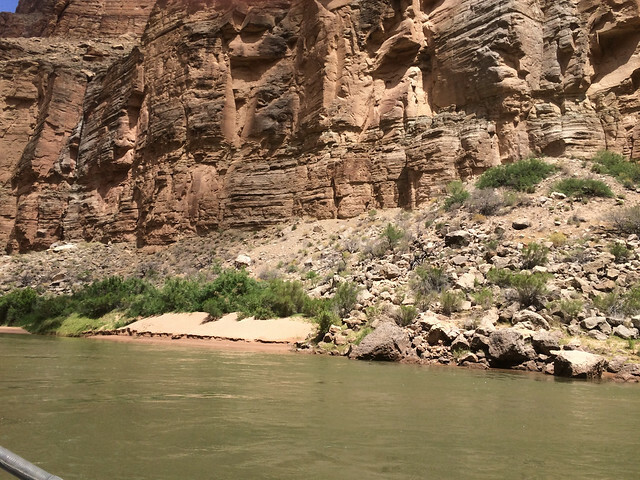 ... caused the canyon walls to appear to rise above us. ... while I set up camp on a convenient rock ledge. 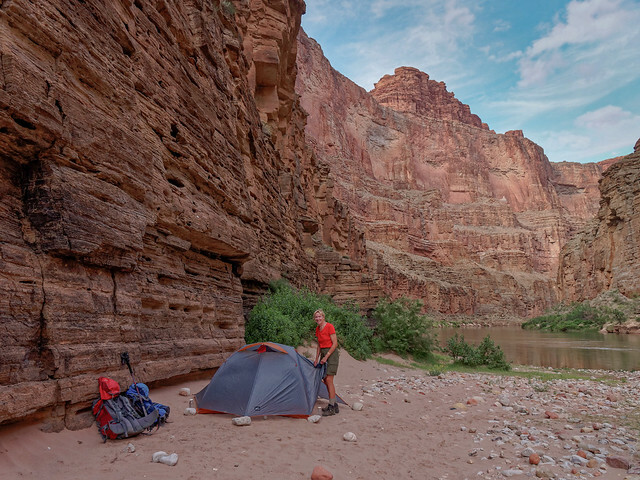 It was a bit windy as the narrow canyon acts like a wind tunnel but there are enough rocks around so we were able to anchor the tent. That night we were serenaded by a wide variety of frog voices. We heard familiar "tenors" as well as "basses" but we also heard some frog song unlike any we have heard before. One frog sounded like a chicken and another just like a barking dog. It was funny at first but less so as the night wore on and we just wanted to get to sleep. However, we shouldn't complain as we were the intruders. We left camp early the next morning and before long encountered a large chockstone. 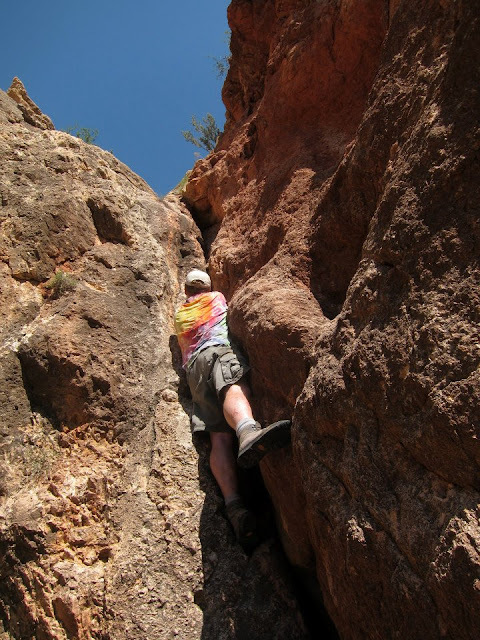 John has some rock climbing experience but I do not beyond some scrambling. So he belayed me while I did my first ever “chimney” maneuver. I did fine although it was a bit of a drop at the bottom. John had no trouble. Once down I looked back and thought how great it was that we wouldn’t be coming back that way because I was sure I would never be able to get back up it. 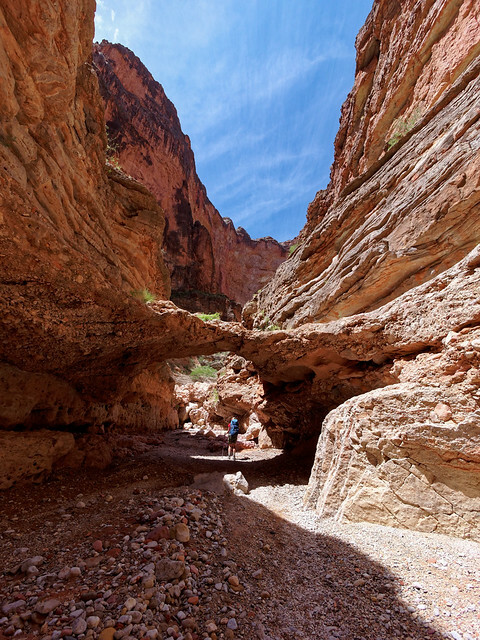 Between the periodic minor obstacles there were long stretches of easy walking through the beautiful canyon complete with an unusual arch. However, there were times when we had to negotiate minor obstacles that I was uncomfortable carrying my pack across (I'm a bit clumsy and lack good balance) so John sometimes carried it for me. 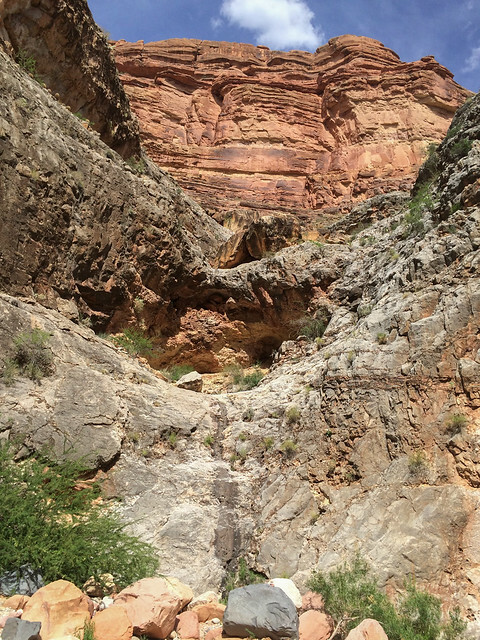 But everything we encountered was well worth it to see this lovely canyon. We passed some cairns on the left and were perplexed. 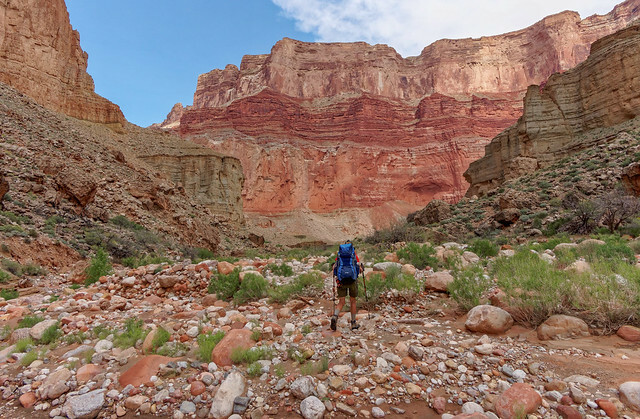 However, I know there is a special breed of canyon explorers who do all sorts of unofficial routes in Grand Canyon and maybe these cairns lead to another way into (or out of) Tuckup. Before long we reached Conglomerate Arch. 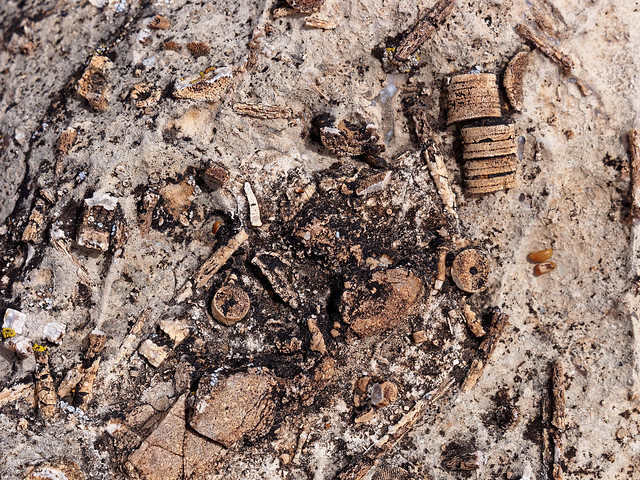 ... and looking up at its crumbly texture I decided it wasn't something I would be willing to do. We continued on and negotiated some minor obstacles. 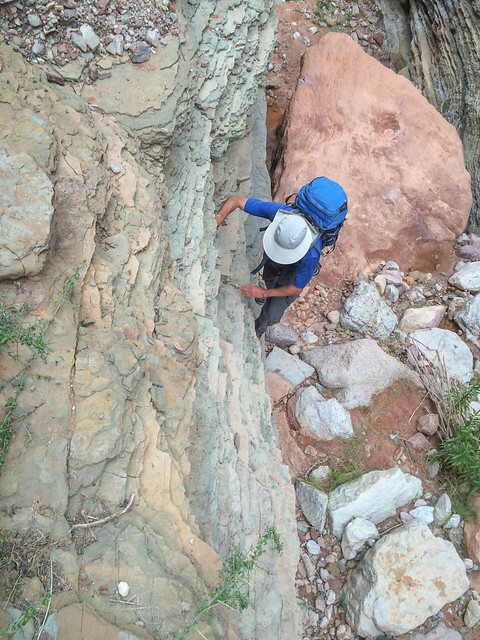 Not long after this we encountered a larger obstacle, a broad limestone chute. We decided to stop for lunch before heading down it (it looked a little intimidating from above to me). 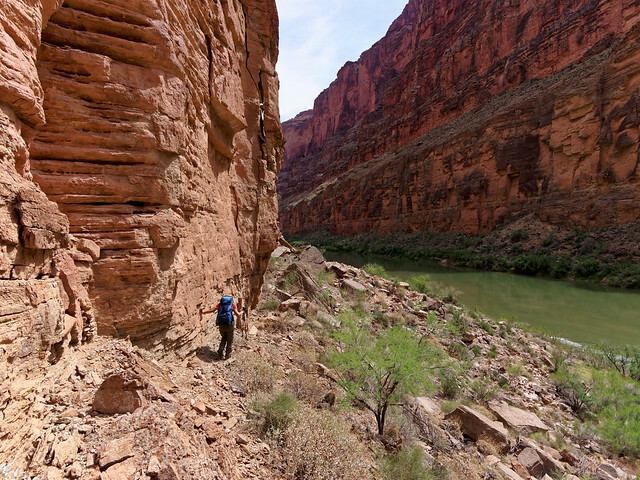 As we ate we began to hear voices and figured some adventurous rafters were making their way up the canyon. I was surprised to see a blond head just pop out of the chute. She apparently had on some very “grippy” shoes and literally ran up it. 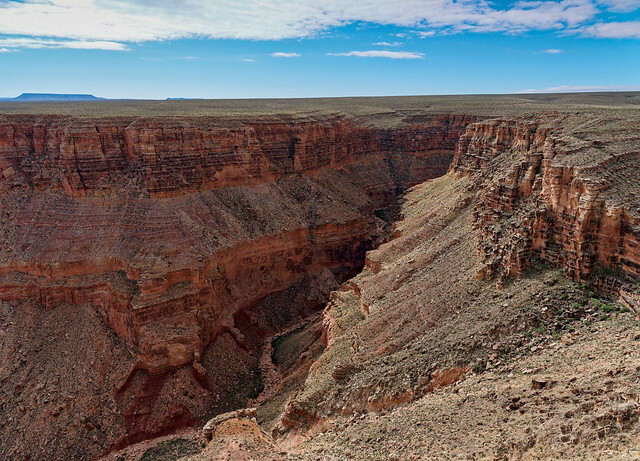 At that same moment I saw a head poke out of a hole at the left side of the canyon which was apparently another way up. But at the time, as we weren't planning to come back this way, I didn't pay too much attention to it. We talked briefly to the rafters. Then they continued up canyon and we continued down. 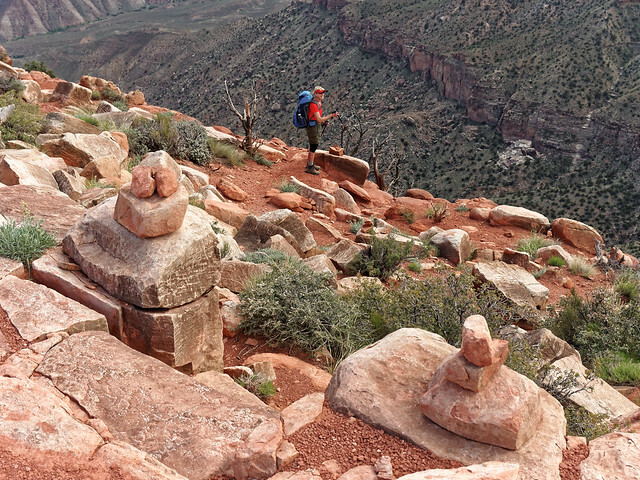 We encountered some cairns leading up to a bypass on the right (facing down canyon). It was a decent route although it was "airy" in places. 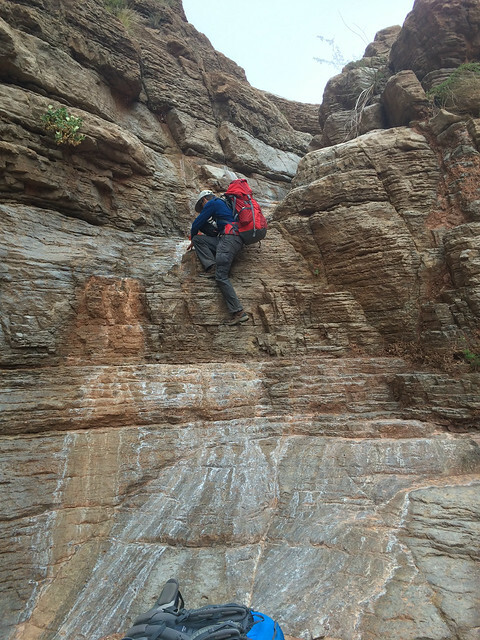 Later on we reached an obstacle in the conglomerate layer of rock. We couldn't see over the edge so were uncertain if there were secure foot and hand holds (and we are way too old to even think about jumping down). Fortunately, right at that moment the rafters were then making their way down canyon and they assured us it was easy. There was a hand hold right at the top and another lower down to the left. The underside provided several places just big enough to get a toe on long enough to safely lower myself. This is what it looks like from below. A belay is not necessary but I have a tendency to get nervous with anything a bit "climby". 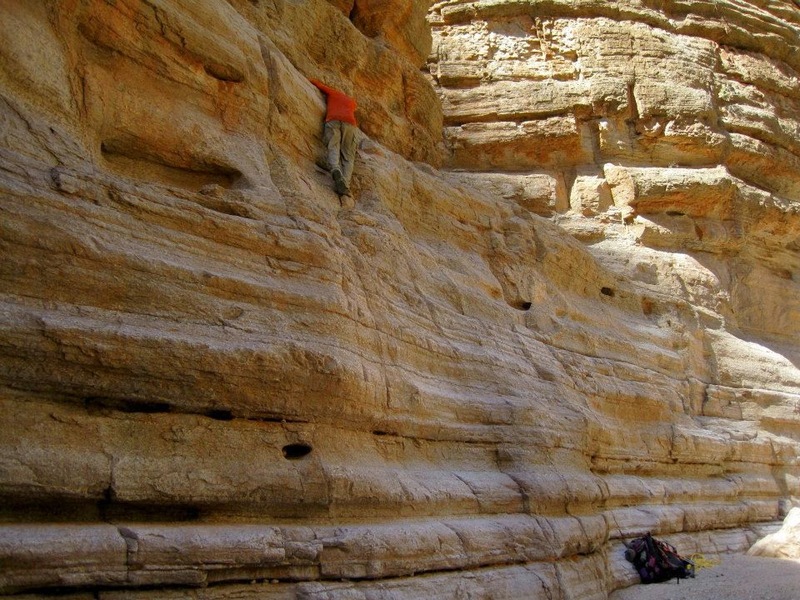 John had brought a rope and was willing to belay me at times during this trip but I never needed him to arrest a fall. It just gave me more confidence. 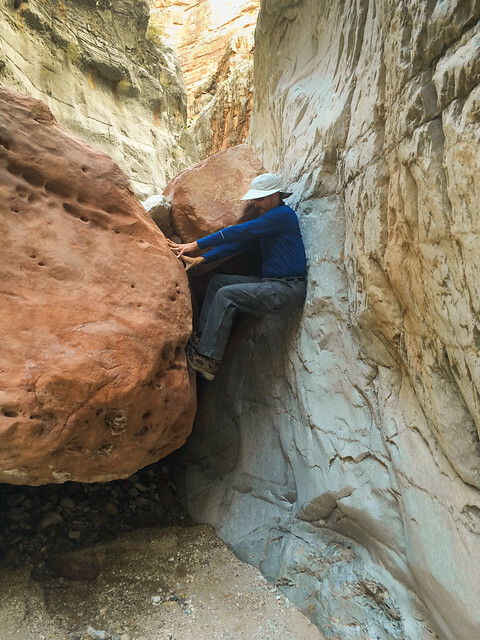 Once down on the boulder we still needed to negotiate a crack and to hand lower our packs. What we didn't realize at the time is this is apparently the obstacle that causes hikers to use the infamous "big down climb" that is mentioned in nearly every trip report I have read. I had been really dreading it. I sincerely hoped it looked worse than it really is but we had come prepared for me to rappel down it if necessary (using a Dulfersitz, something I had done once before). Had the rafters not been there to reassure us it was easy to get down to the boulder I don't know if we would have tried. 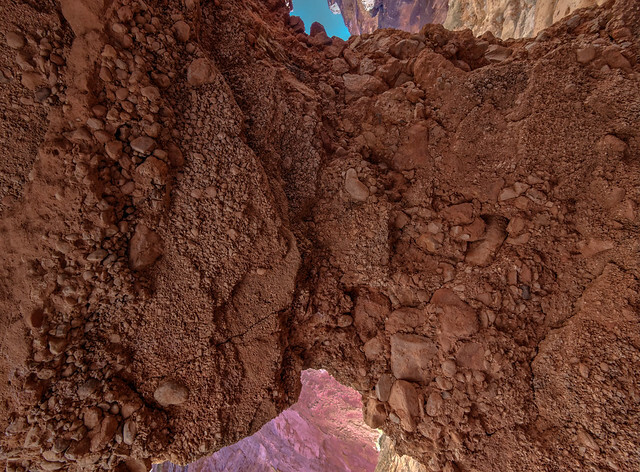 I don't know if it is possible to lean over the edge far enough to see what is underneath it. It is very possible we would have looked for a bypass. 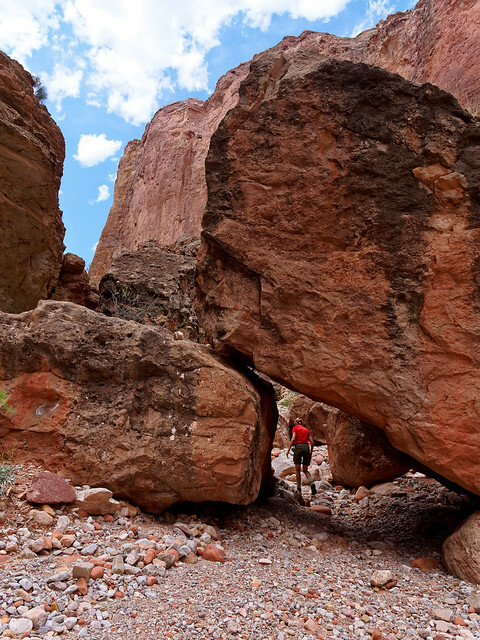 Perhaps hikers, even those who are more experienced than we are, would also choose to avoid this obstacle (or would see the big down climb as no big deal). 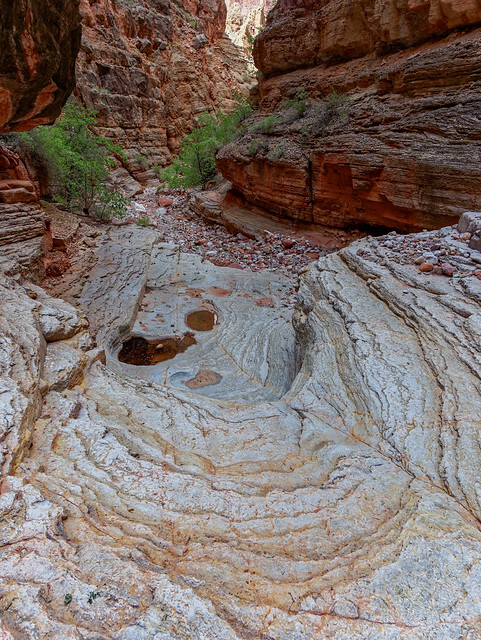 In addition, apparently water sometimes flows over it and pools beneath it (as shown in the photo below). This would require bypassing it unless someone was willing to get completely soaked. ... as well as in this one. 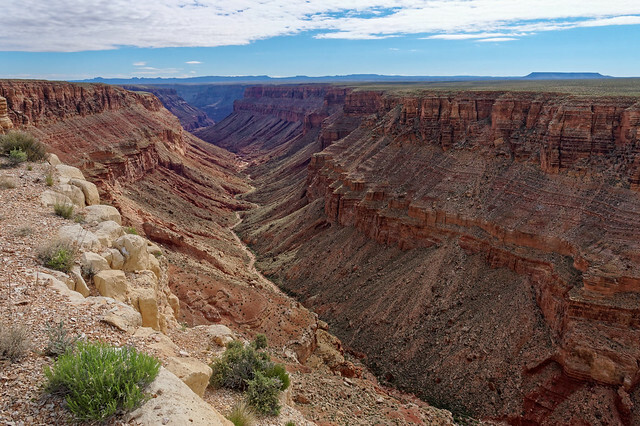 ... and views of this beautiful canyon. When we started to hear the river (without encountering the big down climb) and then actually saw it I was so perplexed. I was also quite relieved and willing to accept this as a gift from the Cosmos. ... we just prefer to enjoy the scenery in quiet and solitude. 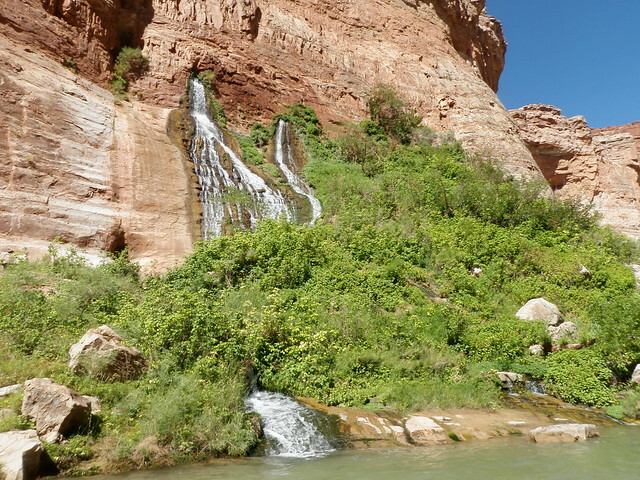 The following day our plan was to hike down the river for seven miles to the mouth of Stairway Canyon. 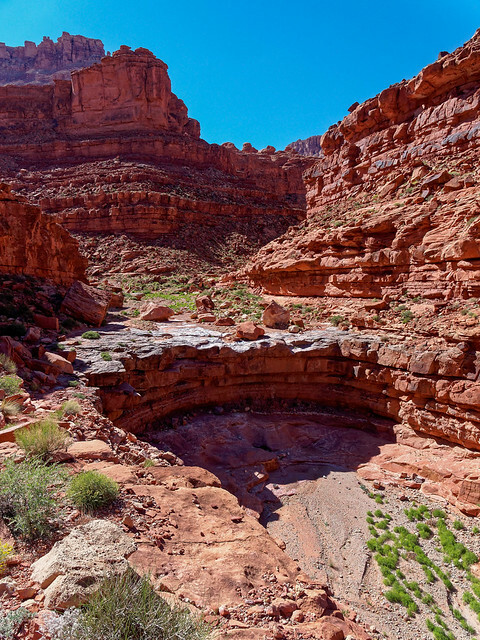 There is a narrow strip of steep loose rock between the river and the canyon wall lined with vegetation running between these two canyons. We have read different accounts of what it is like to hike down the river. One person went so far as to say it was “easy”. 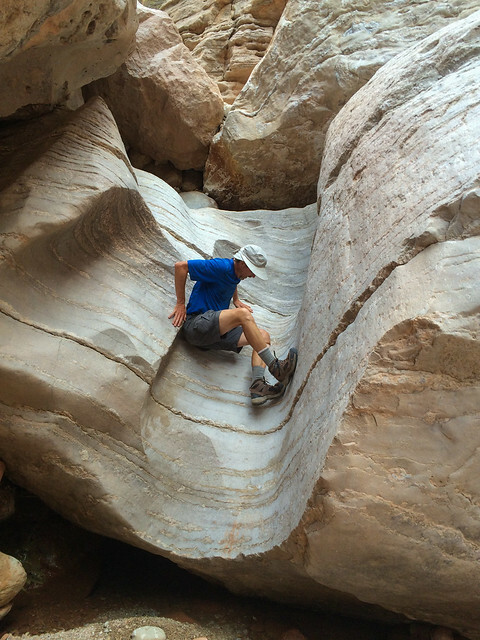 George Steck mentions fighting Tamarisk but his group made it from Tuckup to Stairway in one day. Stacy described it as a trudge at times and that they tried to avoid the vegetation by staying higher in the rocks. Her group spent a night at Fern Glen which is halfway between and went the rest of the way the following day. We have read other accounts where backpackers hitched rides with rafters. We decided to consider that option if it presented itself but I couldn’t help but feel it would be cheating. With that in mind John approached the group of rafters camped nearby to feel them out. Most of the group was willing but there was apparently some concern by at least one individual that they could get in trouble with the Park Service if they did so. 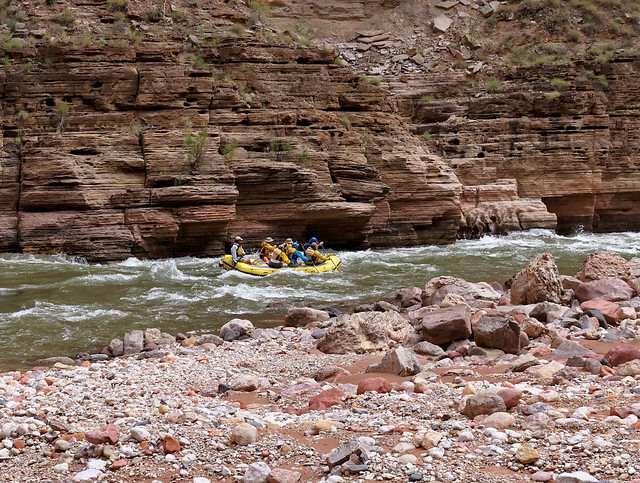 The next morning we talked briefly to the rafters and the consensus was if we wanted a ride we could have one but they would not be ready to leave for another hour or so and they would be stopping at National Canyon. So we decided to give it a try. Which was a big mistake. We bush whacked through the thick brush for an hour. The invasive Tamarisk is a problem all along the river and we have encountered it before but it was nothing like this. 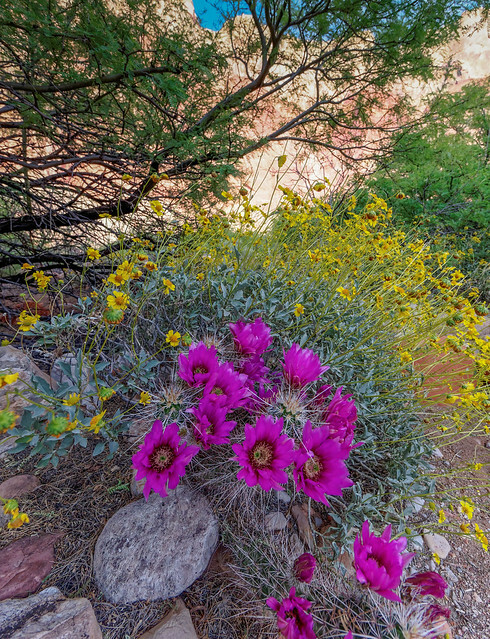 However, the worst was the Mesquite, a shrubby and very thorny tree. We had gone less than a mile in an hour when John suggested we find a beach and wait for the raft group hoping they were still willing to give us a ride. While we waited it became windy and it started to rain. I’m sure we looked quite pathetic so the two rafts pulled over and we thanked them profusely and happily hopped aboard. 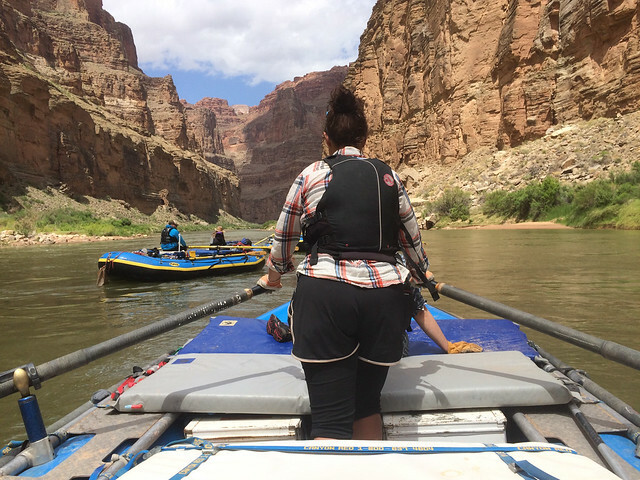 As we floated down the river I scanned the shore and observed that the brush thinned out in places but that it was steep and rocky the entire way. The more I saw the more I appreciated the gift of this boat ride. The rain even stopped and the sun came out! 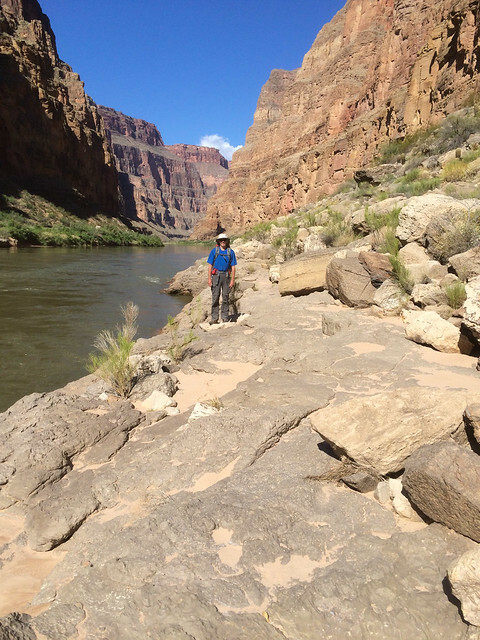 The raft group stopped at National Canyon and John went up as far as he could with them without getting his boots wet. 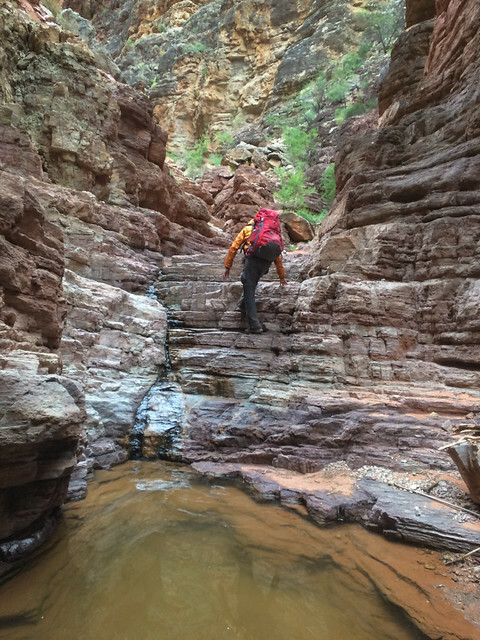 We continued down river and arrived at Stairway Canyon by lunchtime. After saying good bye (and again thanking them profusely) we looked for a place to set up camp. Once done with that we hiked up Stairway to see if we could locate the ways around the four obstacles that George Steck refers to in his book. Shortly after encountering the "chockstone tunnel" we thought we found the bypass for the third obstacle. We then returned to camp more confident. We got an early start the next morning because we knew it would be a long strenuous day. One of the issues with the hike up Stairway is water. 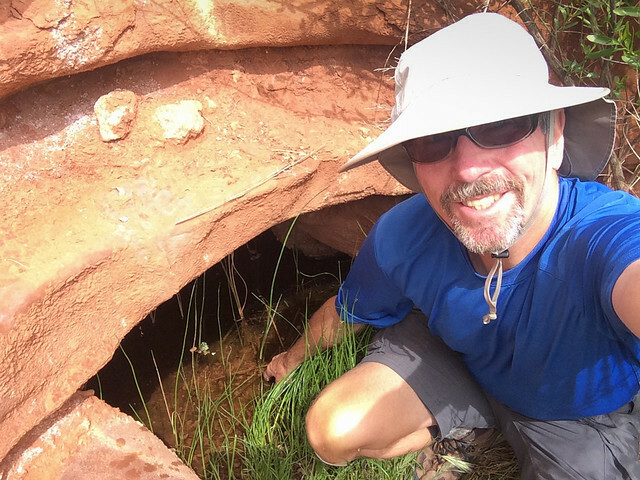 Our plan was to camp at Willow Spring that night but by most accounts it is considered to be too mineralized to be drinkable. Problems include bad taste and intestinal upset. Therefore when we left camp early the next morning we were loaded down with nearly two gallons of water apiece. I found it quite difficult to carry my pack up obstacles I had done without trouble the day before when I wasn’t carrying anything so I relied on John to carry it up for me on multiple occasions. “There are basically only four Redwall obstacles and you encounter them in their order of difficulty – the easiest coming first. This is a small pool in a sharp turn. You have two choices here. One is to skirt the pool and climb the left side of the falls. The other is to climb the right wall. Your choice will probably depend on how much water there is”. We found the "grippy" rock a joy compared to the polished limestone we have encountered elsewhere. We arrived at the chockstone tunnel by mid morning. It had started to rain so we decided to take break there in hopes it would stop or at the very least let up. The more it rained the more concerned we became about losing traction on wet rock. The rain did eventually stop but it was still quite cool. 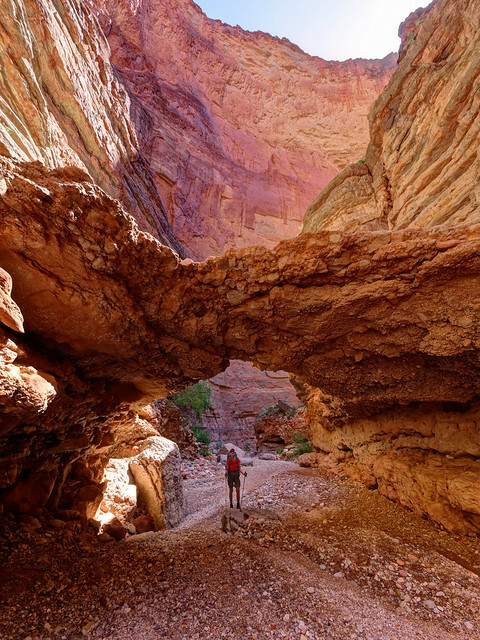 “the next small obstacle comes shortly after going through a chockstone tunnel where the canyon widens some and there is a 10 foot wall diagonally across the drainage”. At the time we thought this could be the wall he was referring except that it came immediately after the chockstone tunnel. But we didn’t see anything further up that matched his description. I wonder if we just didn’t continue high enough in the canyon. We could have misinterpreted what Steck meant by “shortly”. I have since searched high and low for photos of the route. I regret not doing this before the trip but we assumed it would be straight forward to follow Steck’s descriptions. The best I have found so far are from a trip done by Ned Bryant and Chris Forsyth but they took a different route from the chockstone tunnel. 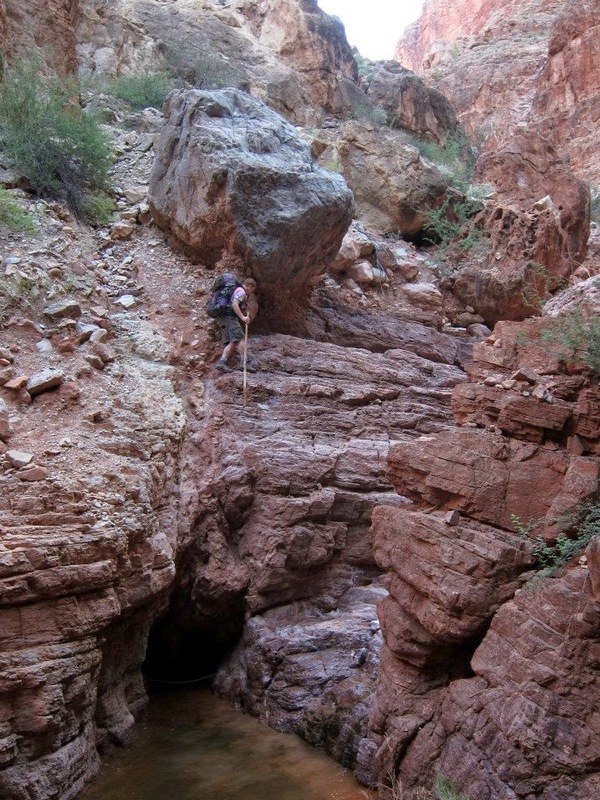 The photo below shows Chris climbing up on the left side facing up canyon (creek right) from the chockstone tunnel. I don’t recall our considering that way but it looks like there was more water than when we were there so that may have made that route more desirable. “You reach the third obstacle shortly after climbing this wall: a 50 foot pour off… The 50 foot pour off can be bypassed in two ways. 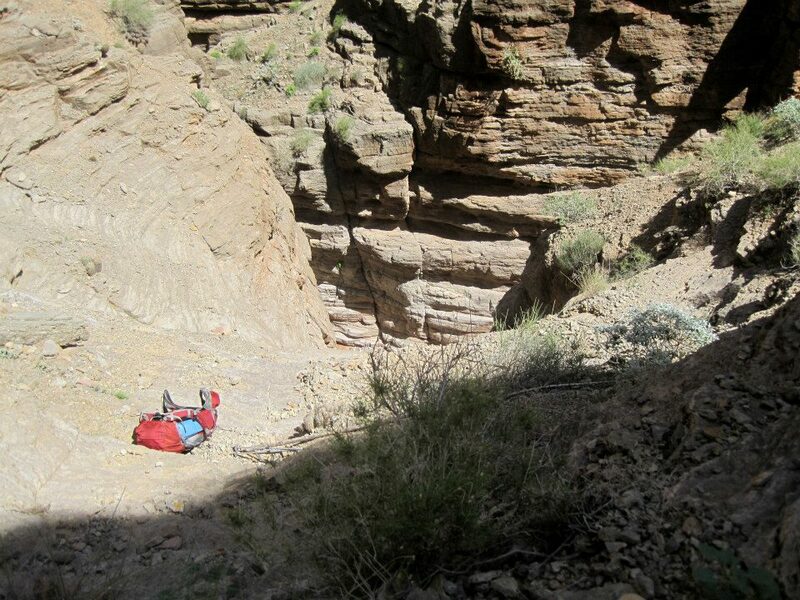 Our “rest day” exploration team climbed a chute to a saddle on the left side of the 10 foot wall (as you face it from below – this is stream right) but Stan also explored a small cleft further down canyon on stream left – my notes say ‘about 100 yards up canyon from the chockstone tunnel”. 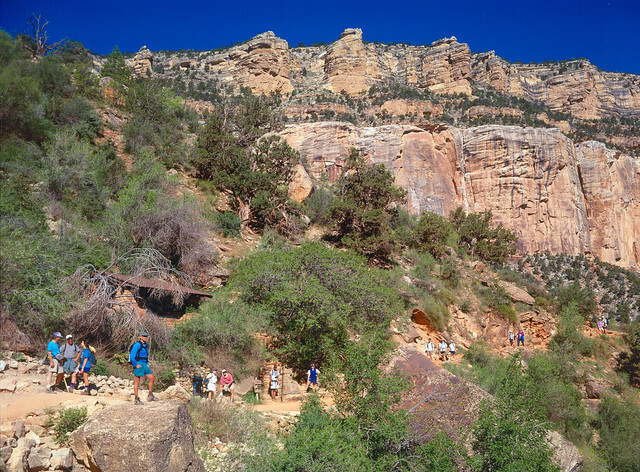 Steck goes on to describe the following day when the entire group would hike up the canyon. "Stan thought the route we had used the day before was a bit risky for a large group – too much loose rock in the chute – so he opted for the cleft he had previously explored … We left the drainage and climbed the cleft, diagonally up to the right (east), until we were on a pair of buttresses. 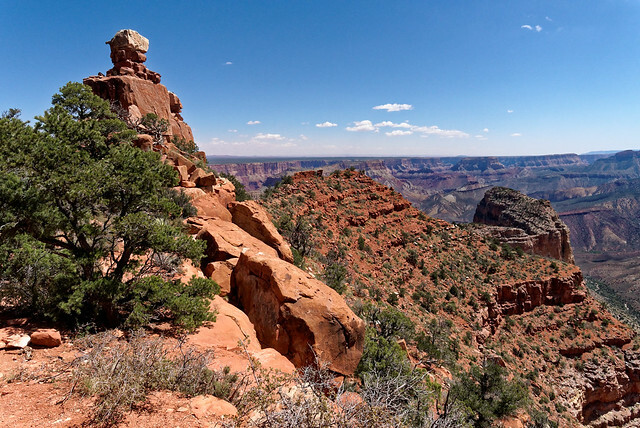 Then we contoured up canyon on top of them – in and out – until the deer trail we were following went diagonally down to the top of the 50 foot fall”. As we thought we could be past the wall we thought it was time to look for the bypass around the third obstacle. 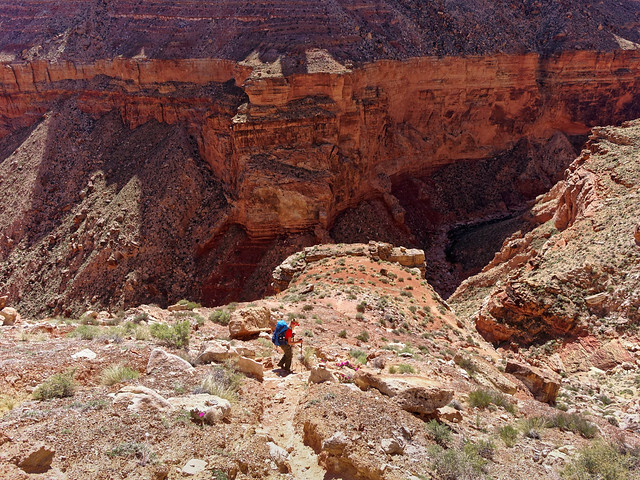 On the previous day John explored a possible bypass on the right (looking up the canyon). 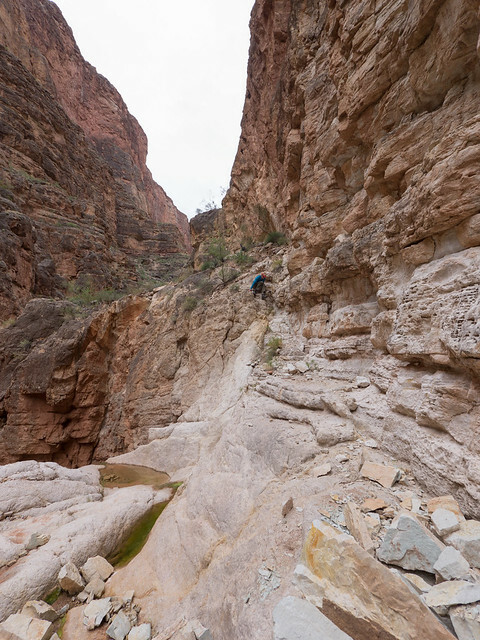 He had climbed up this wall and then traversed up canyon a short ways until he encountered what he described as a 30 foot pour-off and nothing he wanted to try climbing up. We thought this could be the third obstacle that Steck refers to. 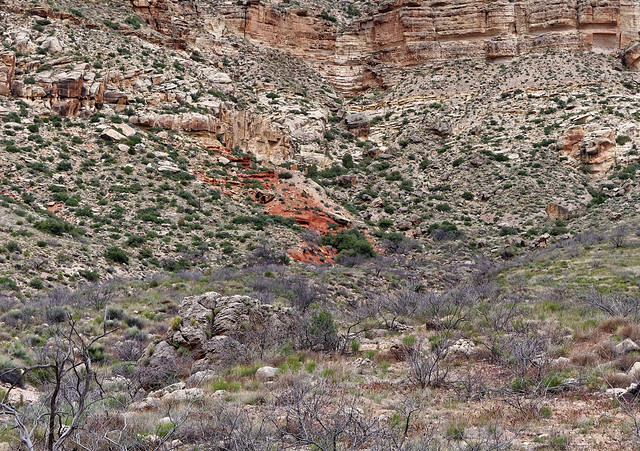 He came back and then looked on the left side (looking up the canyon) and went up the rocky chute in the photo below. We were uncertain how far up from the chockstone tunnel we were. John thought it could be a hundred yards, I thought it was less. We considered the possibility that Steck’s estimation of distance was incorrect. We decided this chute was the best way to go. It was quite steep (steeper than it looks in the photo) and we had to raise both packs with a rope. 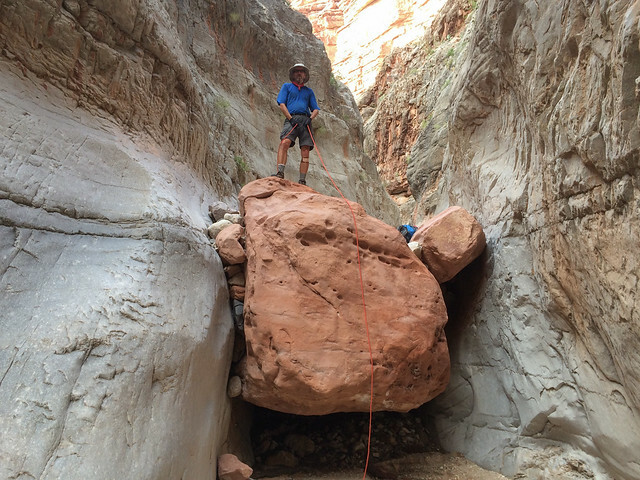 We wondered if this was the route that Steck’s group initially explored and then decided against because of the loose rock. 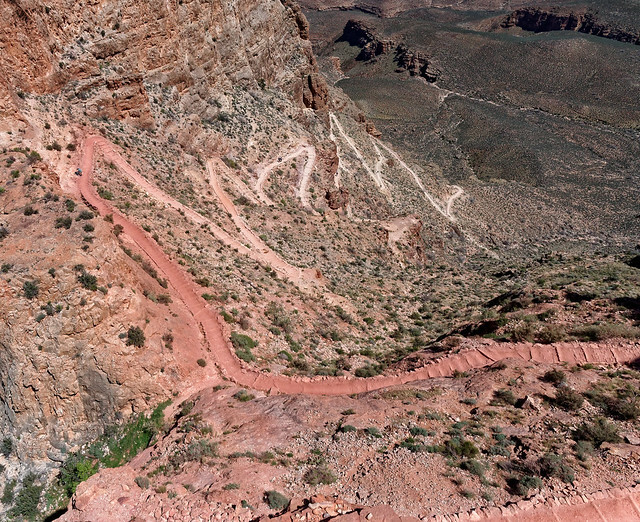 This route traverses a ways, goes up another chute and traverses some more. It was steep and loose and I felt the need to go quite slowly. Traversing talus is one of my least favorite things to do (I am a bit clumsy and periodically I trip and fall which has resulted in injury). 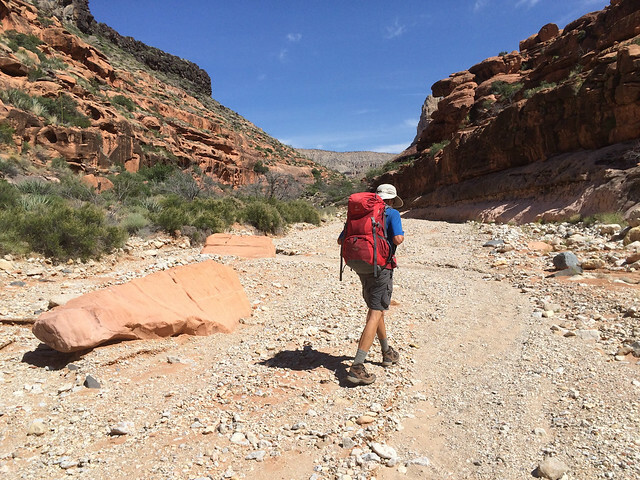 John helped me out immensely by shuttling my pack for me. 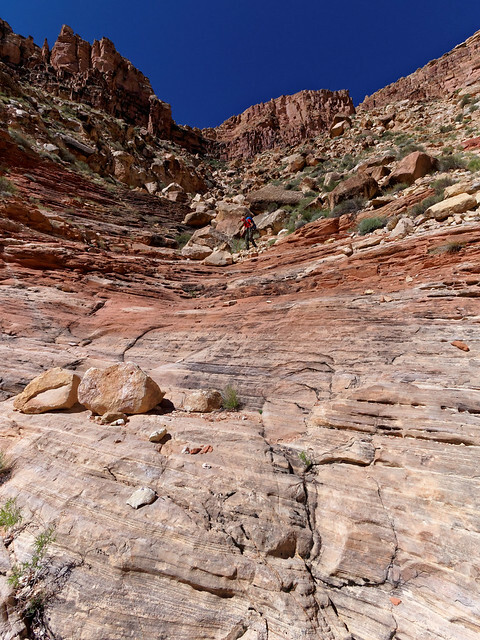 The traverse came to an end and we were able to scramble back down to the canyon floor. We assumed we were well past the 50 foot pour-off. After all it is supposed to come “shortly” after the wall that comes “shortly” after the chockstone tunnel so it did seem like we had come at least as far as two “shortlies”. However, starting after the photo with the chockstone tunnel in it Ned Bryant’s photos show some spots we did not encounter. I am assuming we simply bypassed them. … or if this is it. 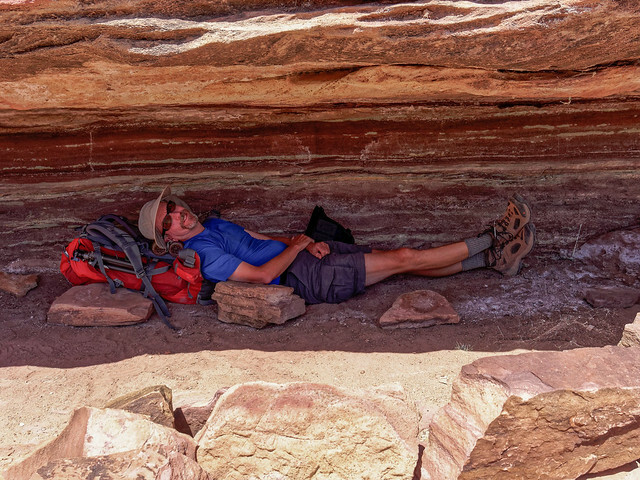 After we returned to the canyon floor from our bypass John did a little exploring up canyon while I took a break. He was confronted with must actually be the 50 foot pour-off. But even with our bypass we had ended up in the same place as Ned Bryant and Chris Forsyth had because Ned took a very similar photo of this feature. John came back and we didn’t see any way up to the left looking up the canyon (actually creek right) other than the way we had just come down. We then climbed up the steep talus slope on the right (actually creek left). 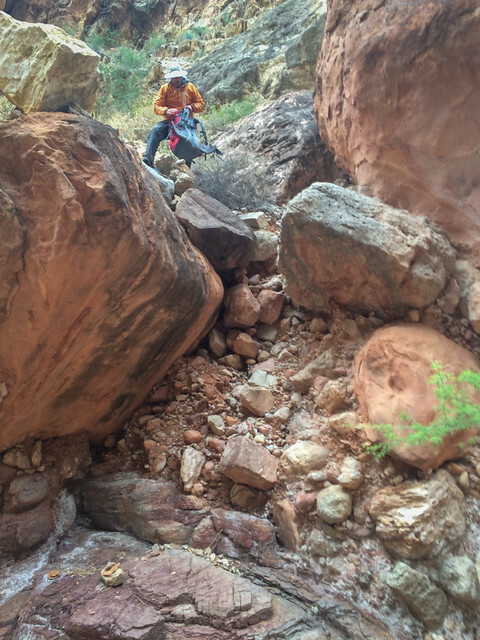 We first scouted up canyon but it didn't get us above the pour-off. 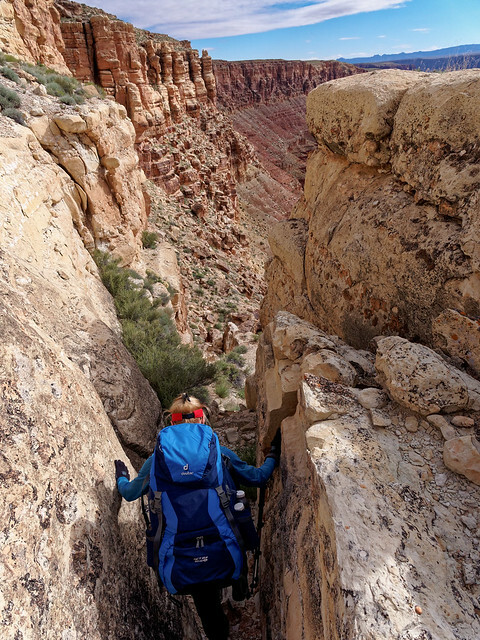 We then backtracked and followed along the base of the wall at the top of the talus slope down canyon looking for some crack or cleft or chute, anything that would enable us to climb up the wall but saw nothing. We eventually ran out of slope and we were both completely perplexed. We reread trip reports and Steck’s description but just couldn't get anything to match up with his descriptions. We had been concerned about our slow progress but now we were stuck. It was at that point we made the demoralizing decision to turn back. 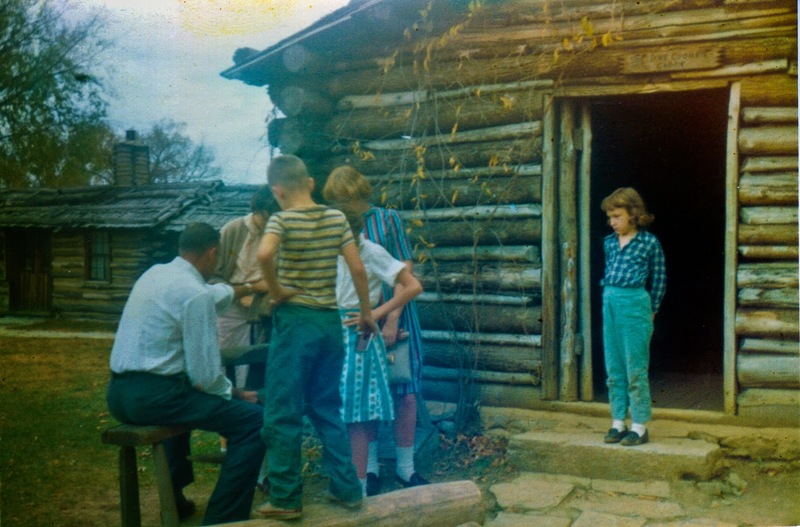 After the trip I found this photo by Ned Bryant labeled “The bypass route”. It was apparently taken after his photo of the pour-off. 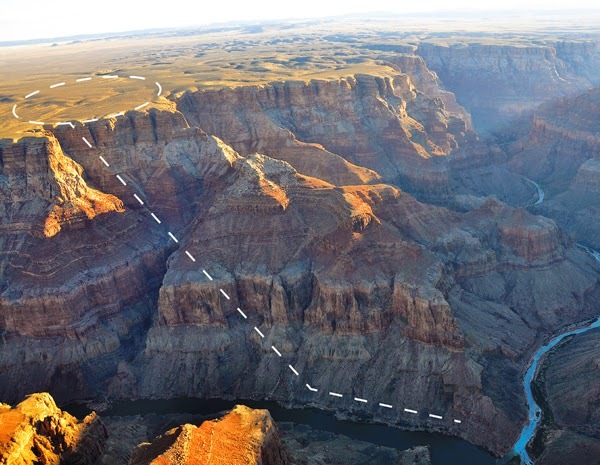 I don’t know which side of the canyon it is so I don’t know if it could be the “chute” or the “cleft” that Steck described in his book. All I know is we did not see it and this fact has haunted us. 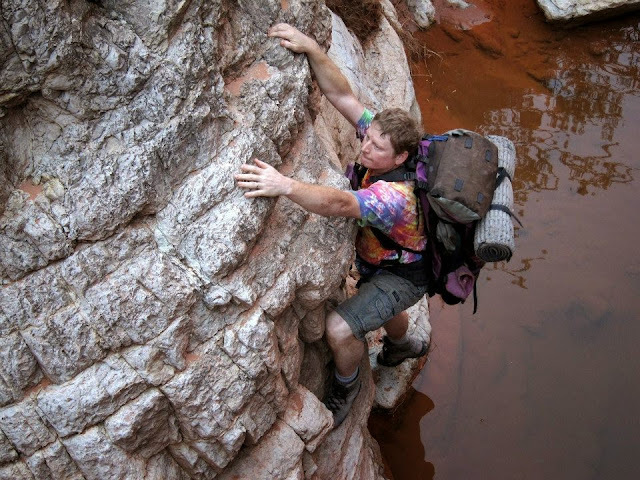 "What I immediately remember is that you walk/climb to the 40' pour-off in the Muav, if you then backtrack the bypass route is on creek right, just before another obstacle, and not too far down creek from the pour-off". 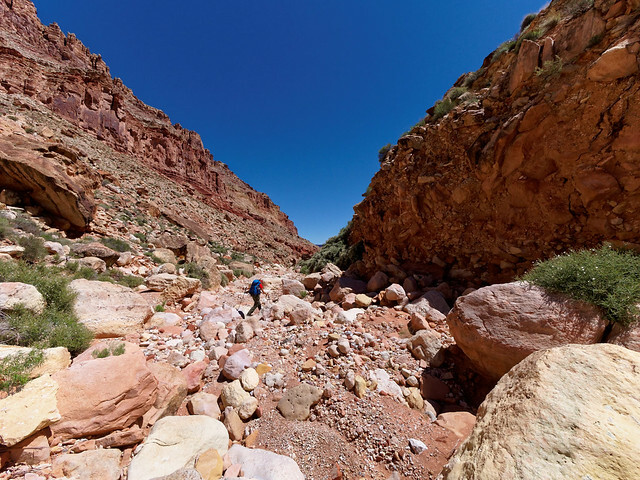 Perhaps when we were on the bypass on the left side of the canyon (facing up stream, creek right) we should have looked up rather than continue to traverse and then descend back down into the canyon. At the time we just didn't realize we needed to ascend farther than we already had. As we didn’t make it past the 50 foot pour-off we didn’t even get to see the 200 foot pour-off. However, Ned Bryant has this photo captioned “The 200' Red Wall pour off requiring a serious bypass”. This was the bypass we had been most concerned about finding. Stacy wrote in her blog. Ned Bryant has this photo which shows some cairns which apparently lead up to the correct bypass. “We had some route finding problems at the end in Stairway, as we started too far south and went up the wrong gully. Luckily, we were able to traverse to the correct gully (the next one north). We finally reached the 40-foot crack we were looking for. The short vertical section at the bottom of the crack worked OK”. 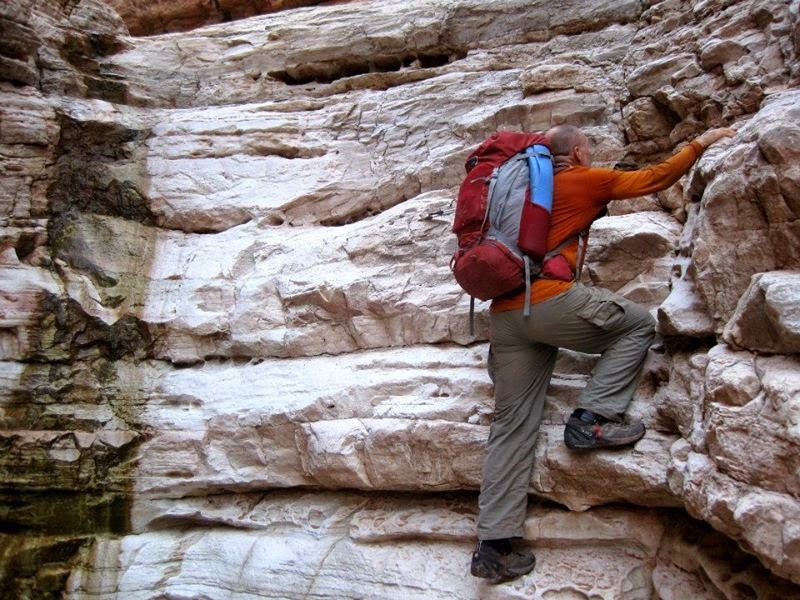 I don't know if the photo below is of the crack that Stacy or Rich is referring to but Ned Bryant captioned this photo "Just climb up that crack!" But I also found this photo, by Roger Spaulding, taken on his Tuckup/Stairway trip which is labeled “the final Redwall obstacle.” A person is barely visible in the middle of the photograph but this doesn't look like anything in Ned Bryant's photos. 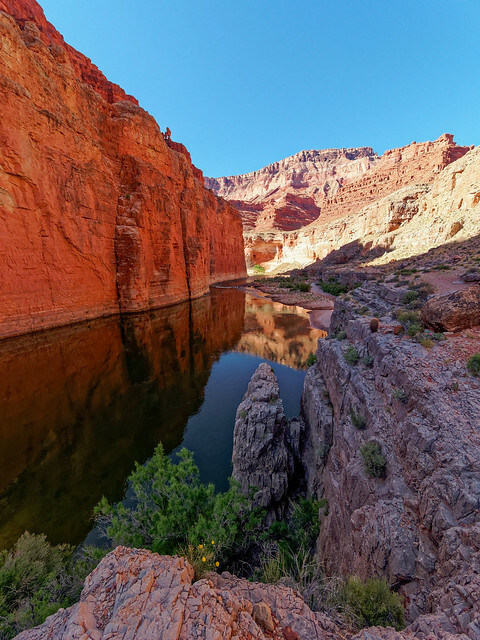 Prior to this trip I had a grandiose notion that I would write the kind of trip report that I would have liked to have read prior to our trip; one complete with photographs of all the ways around the obstacles. But I fear I have only created more confusion regarding the route up Stairway Canyon. For that I apologize. After we made the decision to turn back we descended the talus slope. Unfortunately, a hand hold that I thought was secure gave way and I took a tumble. Fortunately my injuries were minor, only some lost skin and blood but it shook me up a bit. We stopped long enough on the canyon floor to clean me up and eat lunch. We also dumped out all the extra water we had laboriously been carrying all morning. 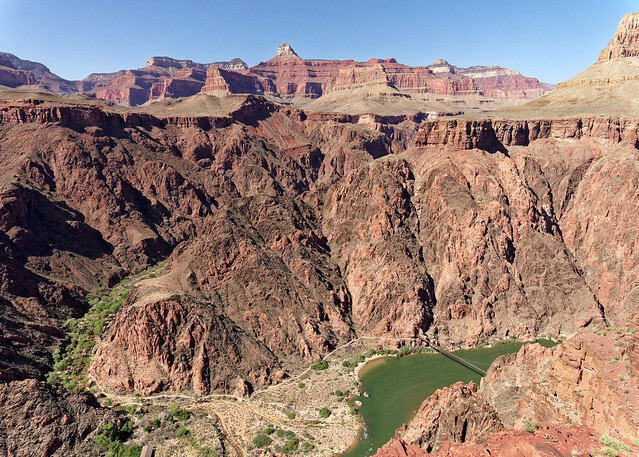 We again crossed our bypass and proceeded down the canyon. Once we reached the river we took another short break. Our plan was to continue hiking to Fern Glen located 3.5 miles upstream. On the following day we would then go from Fern Glen upstream to Tuckup Canyon with the intent of getting as far in as Conglomerate Arch. We would be off itinerary but this new plan wouldn’t add any days to the trip so we had enough food. However, it was already 3:30 when we left Stairway beach and I was skeptical we could make it to Fern Glen before dark. I was remembering our failed attempt to hike downstream along the river where it took an hour to go less than a mile. On the boat ride I had scanned the route along the river and didn’t remember seeing anywhere we could camp in case we were unable to get that far. But John was determined. 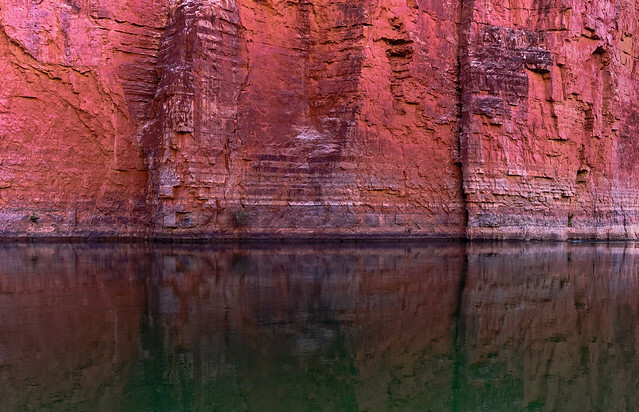 However, he had spent his time in the boat engrossed in conversation and was oblivious to the terrain along the shore. We had not gotten very far before he tripped and whacked his shin on a sharp rock causing a deep cut. It was extremely painful and bled quite a bit. At that point I put my foot down and was then able to convince him to return to the beach at the mouth of Stairway. The next morning our plan was to cover the seven miles to Tuckup beach. This would add a day to our trip so we cut back on food. It was slow going up the river. We tried to avoid the brush by staying higher on the slope against the wall but it wasn't always possible and we would be forced to drop back down into the brush. We did get a brief reprieve when we encountered these wonderful ledges which enabled us to actually make good progress. ... or the dense vegetation. 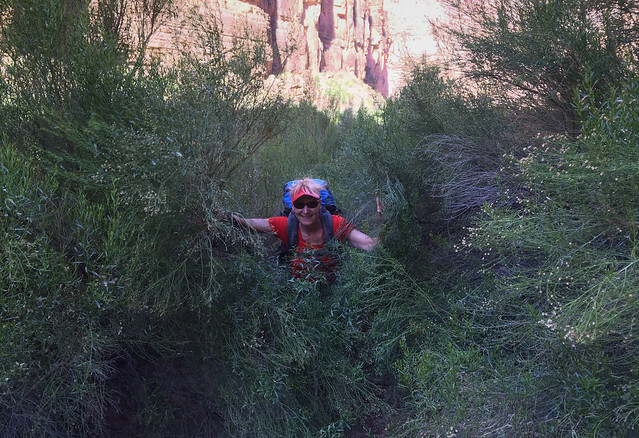 We found walking through the immature willows to be easy and pushing our way through thick Tamarisk doable as long as it wasn’t too mature (as in the photo below). When it was more treelike we could sometime step over the thick branches and other times stoop (or crawl) under them in order to get past. However, there were times when it was impenetrable and we had to find another way through. By far the worst vegetation was the Mesquite. This shrubby tree has thorns, many thorns. We quickly learned it was inevitable we would get scratched. We kept our zip-off pants legs on despite the heat. A long sleeved shirt of some tightly woven fabric and leather gloves would have helped but we had neither. I accepted the pain but found that sometimes the Mesquite was also too thick to penetrate or that it severely impeded forward progress. It grabbed at my pants, my arms, my hair and even my face. We worked hard at maintaining a positive attitude but I was growing concerned about our slow progress. When we got low on water I was dismayed by the fact that even though we were quite close to the river it didn't mean we could actually get to it. Often times there was too much of a drop off to allow a person to reach far enough to fill a bottle (assuming one could penetrate the vegetation). Finally, Fern Glen came into view and we saw that there was a raft group camped there. It had taken 5.5 hours to go 3.5 miles. We still needed water and could have gotten to the river where we were but we pushed on. I was afraid they would pack up and push off before we got there. But they didn't. We were hot, tired and hungry when we arrived in their camp and we must have looked terrible with our assorted large band aids and scratched up arms. We explained our predicament and they fed us lunch - a summer sausage and cheese wrap along with some fresh carrots and even fruit! It was heavenly! We came to the conclusion it was unreasonable to try to go another 3.5 miles to Tuckup that day so we camped near there that night. We had now added two days to our trip. We have heard many stories of the generosity of rafters to backpackers including offers of beer and ice cream. However, this was a private group and their leader was nervous about their group running out so donations were meager, basically their leftovers ( but we were sufficiently grateful. But we had another problem. As we would be in such a remote area of the park John’s sister had been instructed to call the rangers if she didn’t hear from us by 5:00 PM on Tuesday and at this point in time we estimated the earliest we could get out would be early Wednesday afternoon. Therefore, we gave the raft trip leader a message to convey to her as soon as he got somewhere his SAT phone would work. There was a moment of awkwardness; many in the group wanted us to come to supper and breakfast but the leader took John aside and told him this "wouldn't work" for them. So we thanked the group and parted ways. I sincerely hope our intrusion did not mess up their group dynamics. 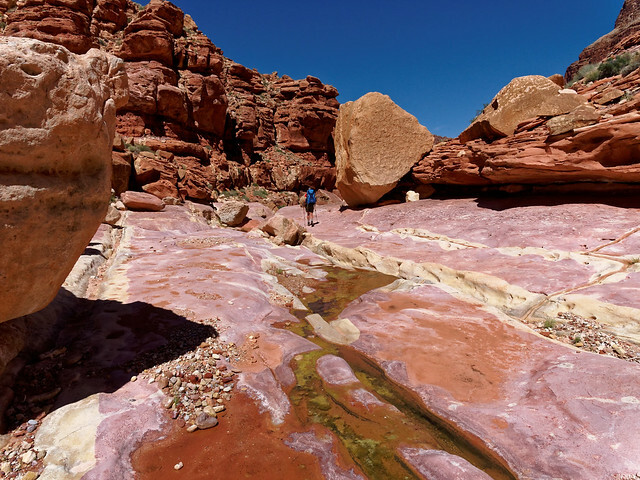 We then headed to the far end of the beach and while I set up camp John and his camera went to explore Fern Glen Canyon. We left Fern Glen early the next morning and it took most of the day to get back to the beach at Tuckup Canyon. We allowed ourselves to take breaks as we had less time pressure that day. We also carried and drank more water. 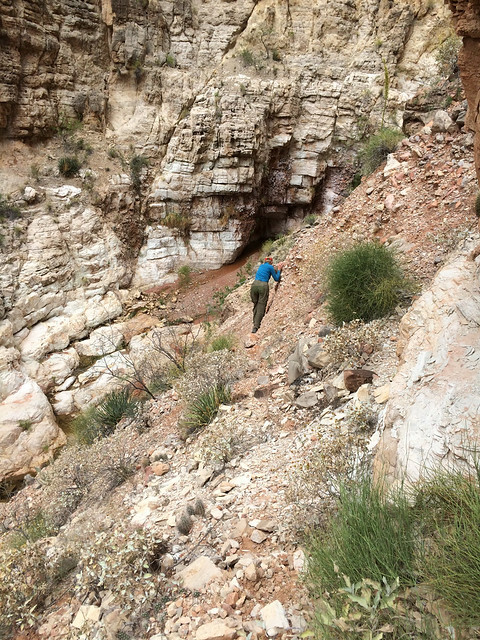 We still encountered the frustrating brush and tried to stay higher on the loose talus slope. 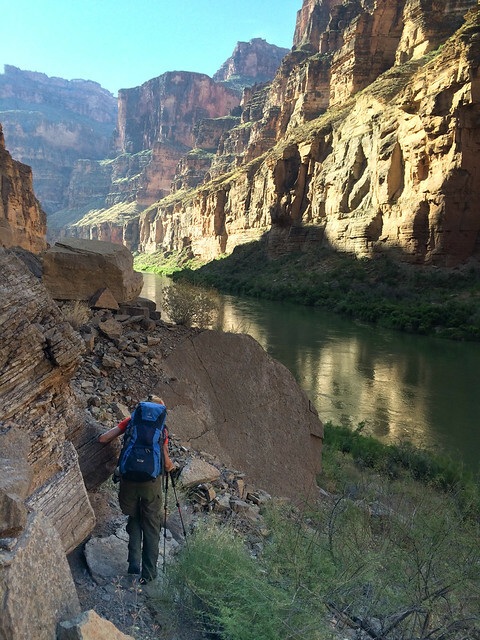 We occasionally encountered an obvious track that skirted the canyon wall but there wasn’t enough to enable us to make good time. Along the way we flagged down a commercial raft and gave the guide a copy of the message to John’s sister to improve the probability she would get it. Once we finally made it to the beach at Tuckup Canyon we were surprised to not find any rafters as there had been two groups when we were there before. We had been hoping to bum a little more food (or even a full meal) from them but did our best to be content splitting a single serving of Ramen Noodles for supper. 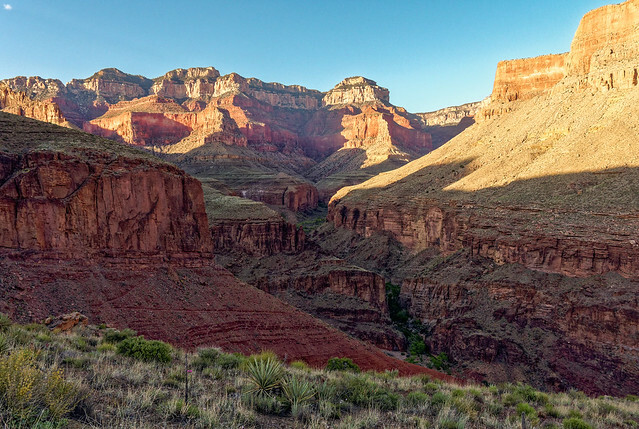 We started up the canyon early the next morning. I had been remembering some of the obstacles we had encountered on the way down Tuckup. But I decided to be optimistic and allow myself to enjoy this canyon in a way I had not on the way down when I had been anxious about the “big down climb” (little did I know we were going to walk right by it as seen in photo below). 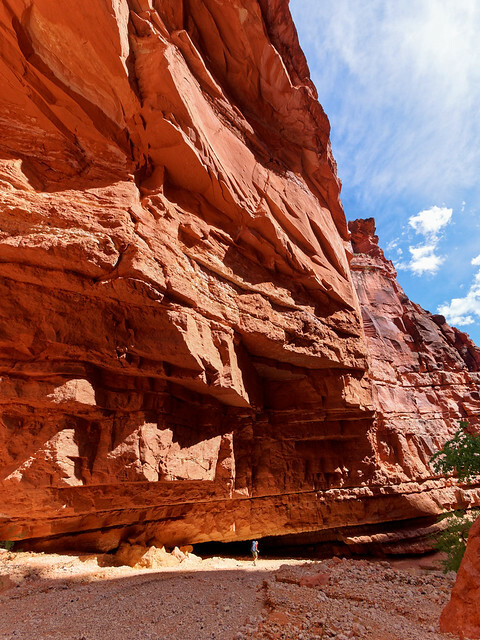 We thoroughly enjoyed being back in this beautiful canyon. Before long we reached the spot where we had to climb up the conglomerate rock. I found the climb up this to be easier than I had anticipated and felt a bit silly with the rope tied around me. When we encountered this chute again John was able to get back up it with a fair amount of effort. I, on the other hand, had trouble making upward progress. 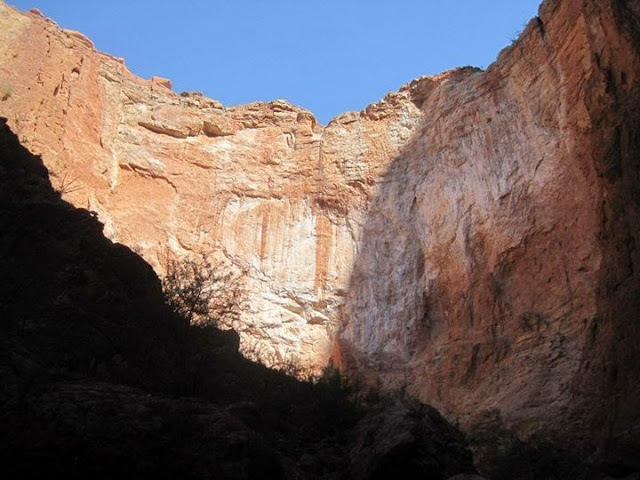 I then remembered the "hole" I had seen one of the rafters come out of and checked out the other side of the canyon to the right looking up canyon (creek left). 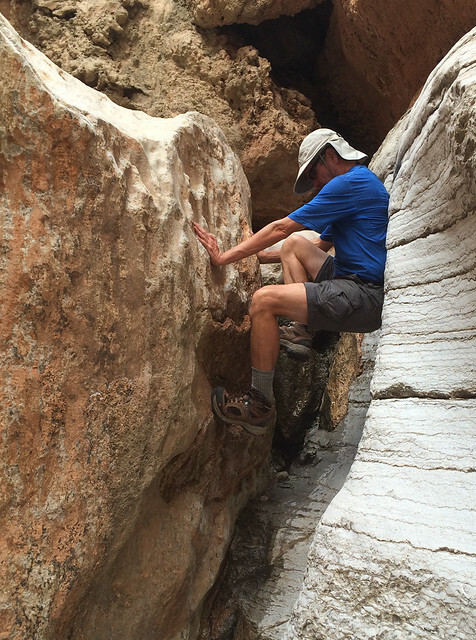 There was a steep wall covered with sand left from numerous feet so I could tell it was a commonly used route. However, with all the sand on the rock I was skeptical I could get enough traction. But my first step felt surprisingly secure so I quickly "walked" up it (before I lost traction) to the boulder jam and worked my way through the hole. We again got to enjoy the sight of Conglomerate Arch (and I still felt no desire to get on top of it). We continued and I was really looking forward to reaching Cottonwood Canyon where we planned to camp that night. But first we had to get by an obstacle that I had conveniently forgotten about. The chockstone that I said "I would never be able to get back up" (note to self - never say never). To make a long story short - John was able to chimney up the right side but I wasn't. I ended up climbing up the left side. I have written a more detailed account below but basically I was able to get my arms around the orange "C" shaped rock and worked my knees up the boulder (leaving a bit of skin behind). I was relieved to finally reach Cottonwood Canyon. It was quite windy that evening and we had to be creative about anchoring our tent. Once again we were serenaded by a multitude of frog voices but I welcomed it. Ever since we had made the decision to turn back I had fantasized about this moment when the hardest parts of the hike were behind us. I expected to feel euphoric but instead all I felt was fatigue. We split our single serving of instant mashed potatoes and went to sleep. The next morning we started our hike out. As we could not be certain that John’s sister had gotten the message that we were delayed we were concerned that at any moment we would hear the sound of a Search and Rescue helicopter (we would later learn that after three attempts a SAT phone call did get through to her). Fortunately the temperature remained cool and there were some clouds. 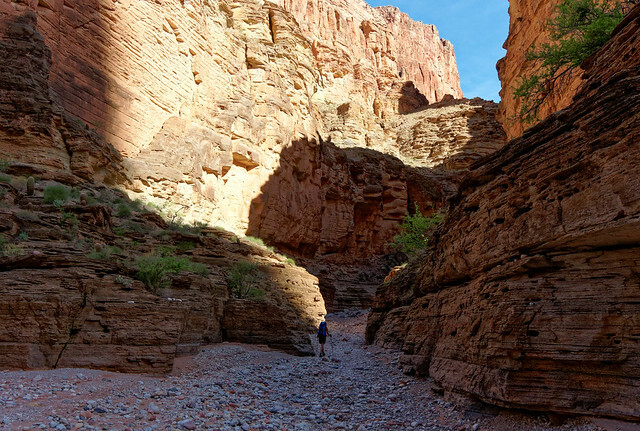 In addition the canyon walls provided some shade. We again encountered some boulder jams and had some route finding issues but we eventually got past all that and the walking was quite easy. I was so happy to finally be back on an established trail! We knew we were getting close to the trailhead as we were running out of topography. I was keeping my head down watching my feet on the rocky trail but when John said he could see our Jeep I looked up. Once I got a glimpse of it through the trees I did something I have never done before when returning from a backpack trip, I started crying. I think it was an indication of how stressful this trip was at times and how hard my “adult self” had had to work at keeping my “inner wuss” under control. All of our photos from this backpack trip are on Flickr. Like I said we have been haunted with our inability to find the route past the third obstacle in Stairway Canyon. I’ve tried to imagine what would of happened if we had found this bypass. Would we have had trouble finding and/or getting up the bypass around the 200 foot pour off? Even if we had found it quickly it would have still taken us a long time to get above it as we were carrying so much water. Our original plan was to dry camp at Willow Spring that night but I now seriously doubt we would have made it that far. We were just moving too slowly. We would most likely have had to dry camp just above the Redwall. The following day we would have probably needed to drink from Willow Spring (unless we found some potholes) and add a day to our trip. We have wondered if we would ever consider trying this trip again just to satisfy our need to feel successful. The biggest issue we have with the route is the seven miles one must travel down river. Unless we were guaranteed to get a ride with a raft group we currently don't think we would ever want to do this trip again. The stretch along the river is just too tedious and unpleasant. However, I also think we need to be realistic. 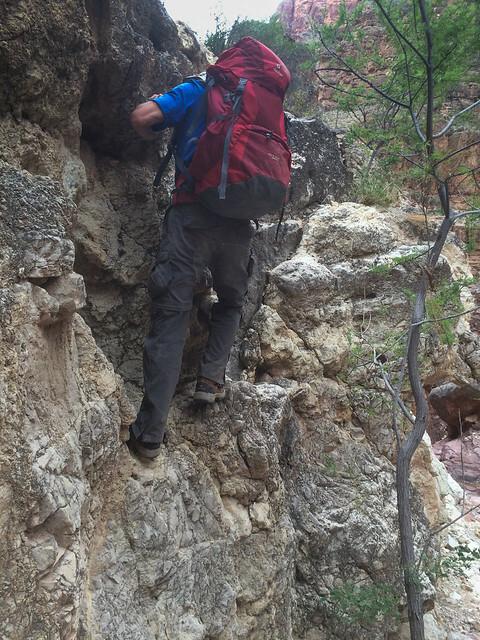 I am not sure that I am strong enough to carry a pack with 16 pounds of water all the way up Stairway Canyon. And it is unrealistic to expect John to shuttle my pack up everything I might not be able to do. But we have considered the possibility of approaching Stairway from the top and descending far enough to see the bypass that we missed. I have mixed feelings about that. 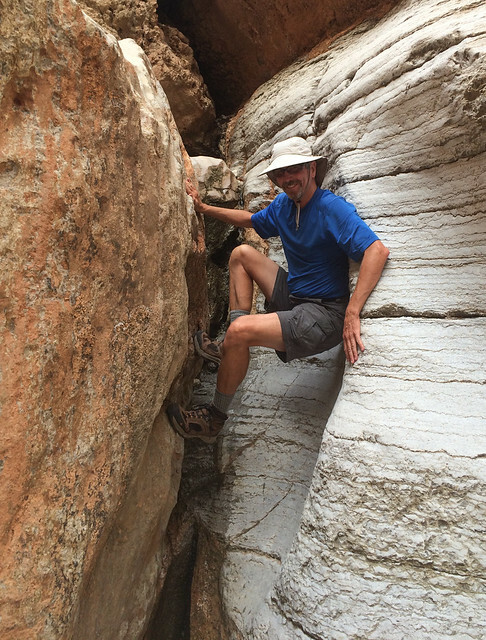 It could be that I am not cut out to be a true canyon explorer and must be content with just being an experienced canyon hiker. 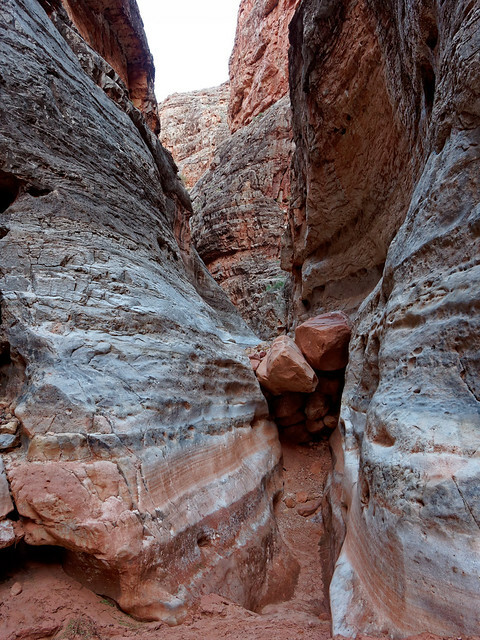 That said, Tuckup is a beautiful canyon and it is well worth going down it. One could stay at the river and then go back up. I hope my account of our trip helps you decide if this is a trip you are interested in doing and if the obstacles are within your reach. 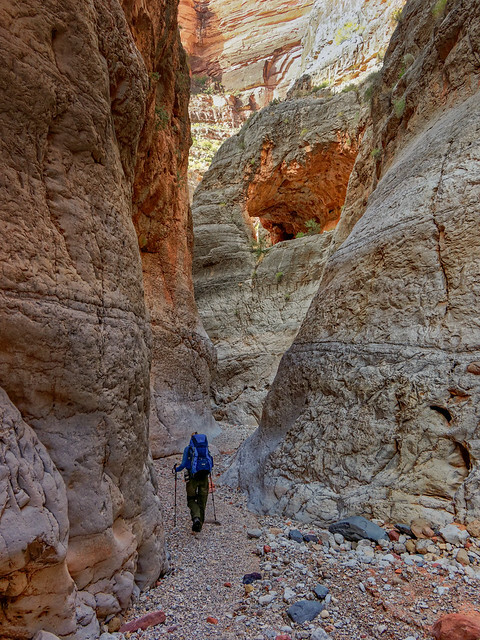 While this trip will never make our list of "Favorite Backpack Trips" Tuckup Canyon is now one of our favorite places. 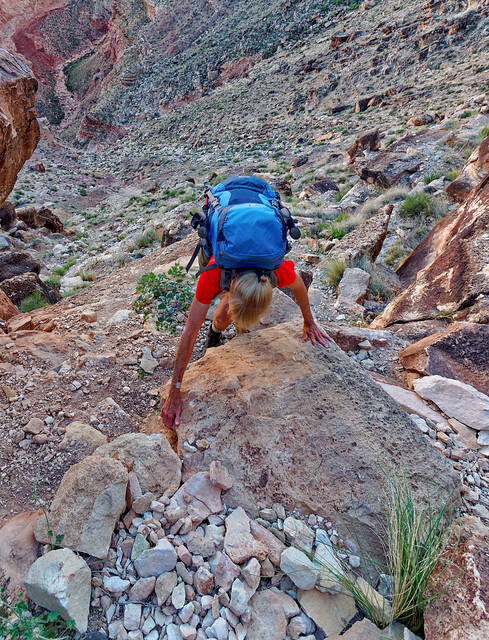 The bottom line is that a 60 year old woman with a fear of heights, no rock climbing experience (beyond a little scrambling) and bad knees did it as long as her husband belayed her, boosted her, and sometimes carried her pack. 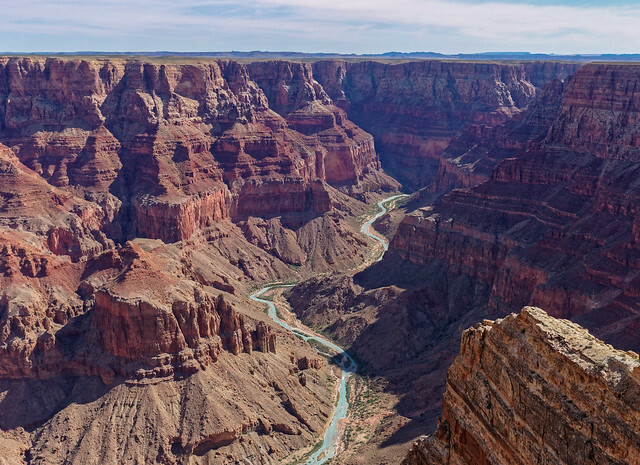 Hopefully, with time I will get my nerve back and we can try another "unofficial route" in Grand Canyon. In hindsight the Tuckup/Stairway Loop was simply more than we should have attempted. We will just choose more carefully in the future. Prior to this trip we had obtained a permit for the North Bass Trail to begin five days after completing this trip. Between coming out two days late and being rather beat up we decided to cancel this trip. We were disappointed but it was just as well because the weather was atrocious, wet and cold. 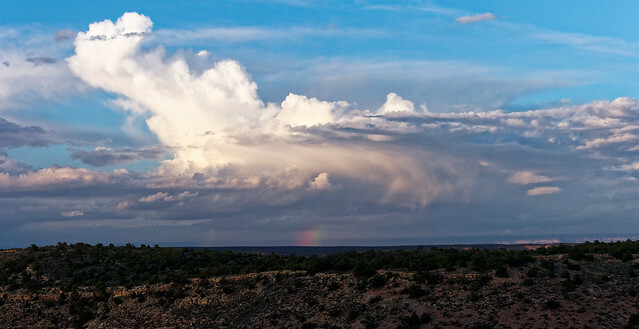 We spent two weeks hunkered down in Fredonia, Arizona. We had intended to at least do some dayhiking on the North Rim but the weather continued to be unseasonably wet and cold. 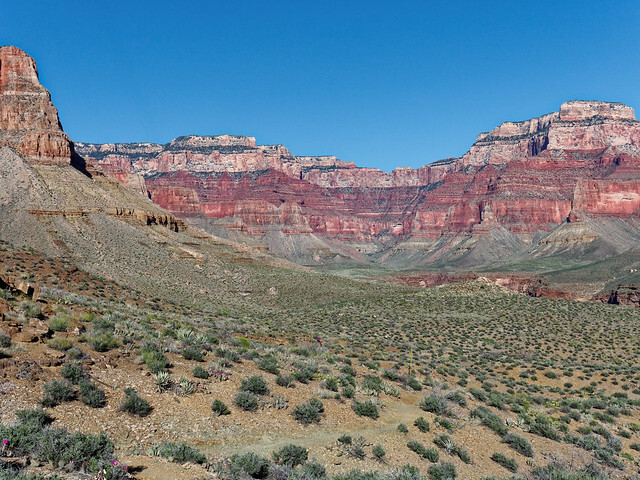 Maybe we’ll come back in October to continue working on our goal to hike every trail in Grand Canyon National Park. 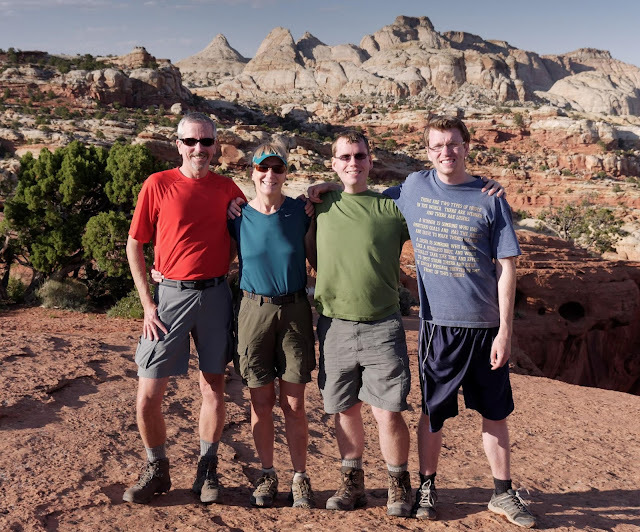 At the end of May our two sons, Dan and Tom, came for a visit and we spent some time in Capitol Reef and Arches National Parks in Utah. We are now heading to Colorado to do some backpacking and climb some "fourteeners". We will do our best to avoid being struck by lightening! 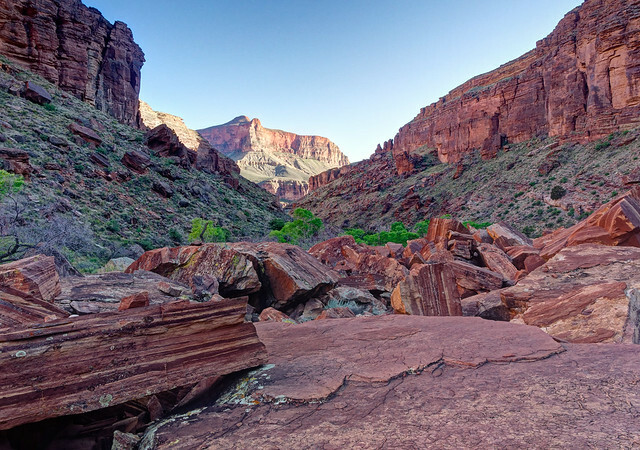 We recently completed the Nankoweap Trail in Grand Canyon National Park. I have been nervous about hiking this trail ever since we decided we would hike every trail in the park. 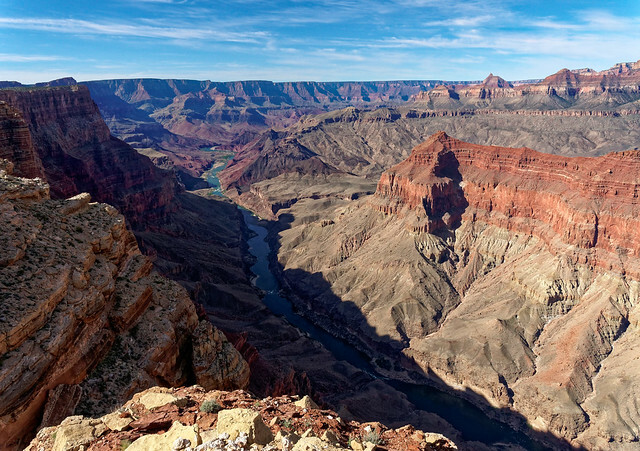 The Park Service Trail description states it has “... significant exposure in places". That it "is not recommended for people with a fear of heights..." and "is classified as MOST difficult of the named trails in Grand Canyon”. Well, not only do I have a fear of heights but I have poor balance and a tendency to trip and fall which has resulted in injury. 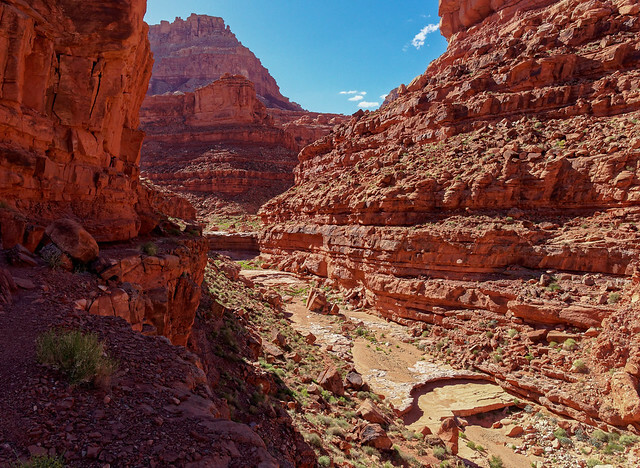 Several of the trip reports I’ve read about hiking this trail have referred to the “scary part”. 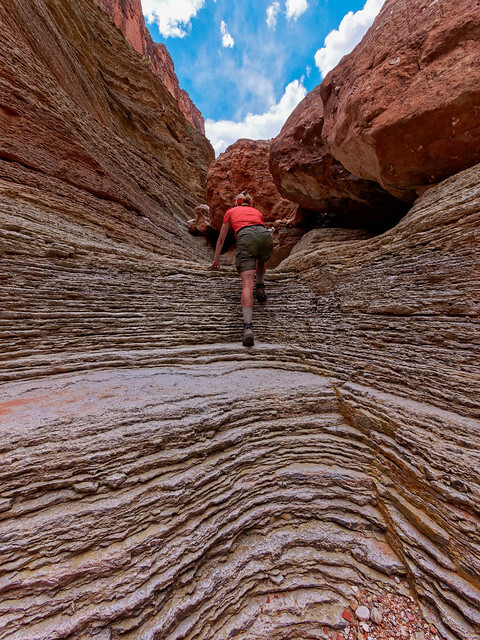 I have spent far too much time examining this photo and had trouble visualizing walking on it and not slipping off the edge. So I was a bit anxious when we started out. We have experienced exposure on other trails; a stretch on the Beamer Trail stands out in my mind. 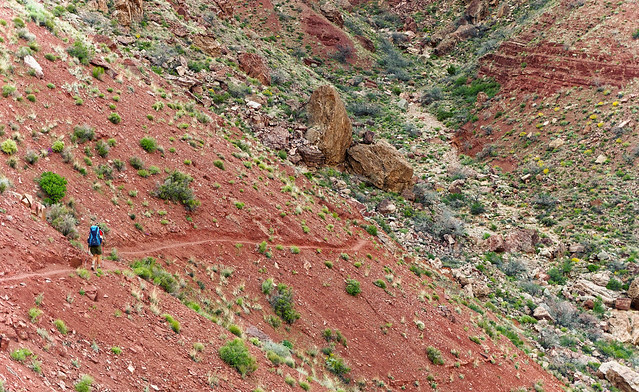 However, as the Nankoweap is the “most difficult” trail in the park, I assumed the exposure on it must be far worse. Yikes! 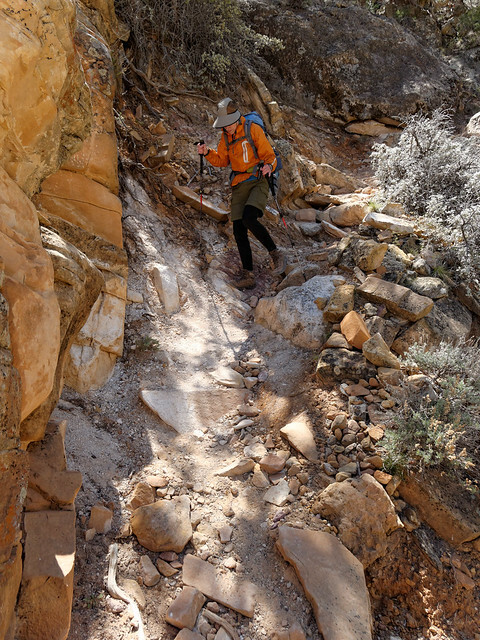 However, when we got to the part known as “the endless traverse” I did see that it was sometimes exposed but I was very careful with my foot placement and had no trouble. I kept waiting to get to the “scary part” and one spot did stand out where hikers must slip around a rock that extends over the trail a bit. After completing the traverse it was then time to begin descending. Okay, this must be where it gets really bad and “most difficult”. 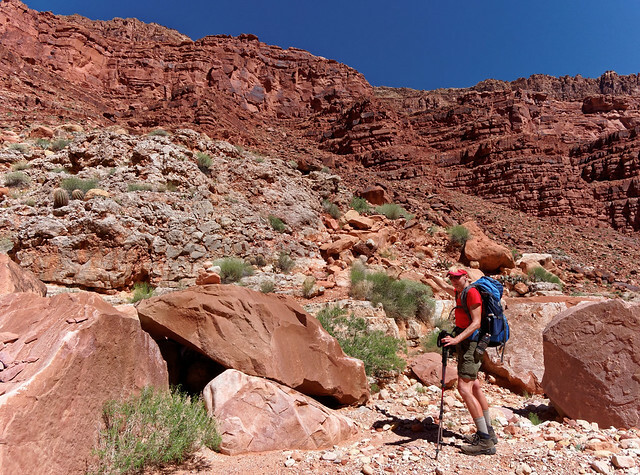 We’ve experienced conditions such as steep loose rock on other trails in the park such as the Tanner, Boucher and New Hance Trails and if the Nankoweap was going to be more difficult then it must be really bad. It was steep and loose in places but it just didn’t seem to be any worse than parts of trails we’ve been on before and we reached Nankoweap Creek without incident. I initially thought that this childish need for attention at the age of 60 must be coming from unresolved issues dating back to my less than optimal childhood. However, the more I thought about it the more I realized that in this day and age I am not alone. 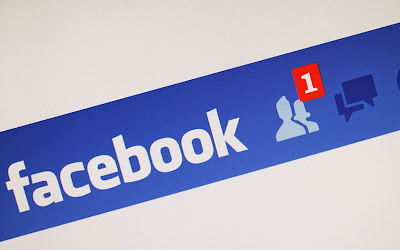 One only needs to look at the multitude of modern social media sites to see that many of us are also on this quest to be noticed. Take Facebook. We post all kinds of stuff on our Facebook page, everything from the most mundane every day occurrences to special events. Our “Friends” then have the option to comment on our posts or to “share” them. However, it seems that the most commonly used option is to “Like” it. 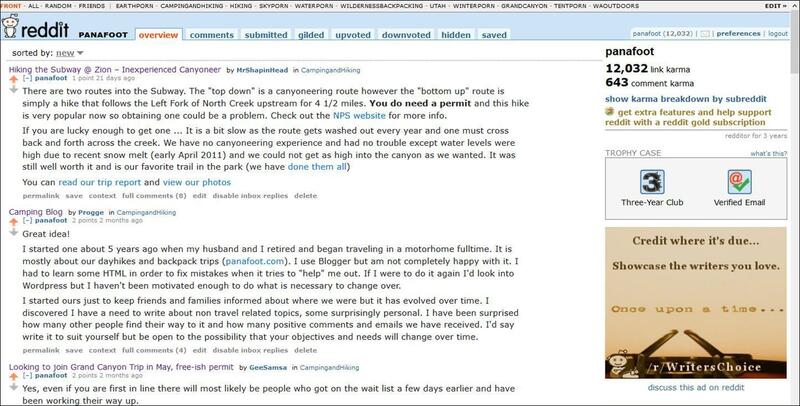 On Reddit, another popular site, people regularly post content apparently in hopes it will be “up voted” which will gain them “Link Karma”. In addition they can comment on posts by others possibly in hopes of being up voted so they will gain “Comment Karma”. For those who post photos on Flickr options to be noticed include “Views”, as well as other Flickr members can comment on photos, choose photographs as “Favorites” ” and add them to their “Galleries”. And if one goes so far as to join certain Flickr Groups their photos can receive “Awards”. So obviously I am not alone in wanting attention and I have already been using these three sites to get others to notice us and the places we’ve been. While I don’t post much on Facebook when I have I did notice if it was “Liked” by anyone. On Reddit I have periodically posted some of John’s photos. I have not paid much attention to our “Link Karma” but I do note how many “up votes” each photo gets. 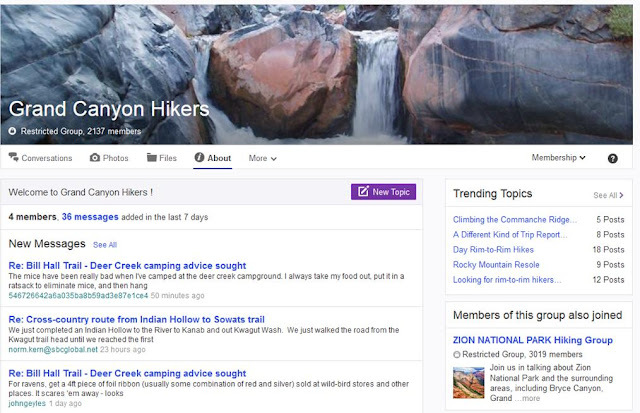 I have also tried to be a better member of our backpacking “tribe” by supplying information to help answer people’s questions about places we have been. I’m less concerned with “Comment Karma” but I always notice when people express their appreciation for my information. 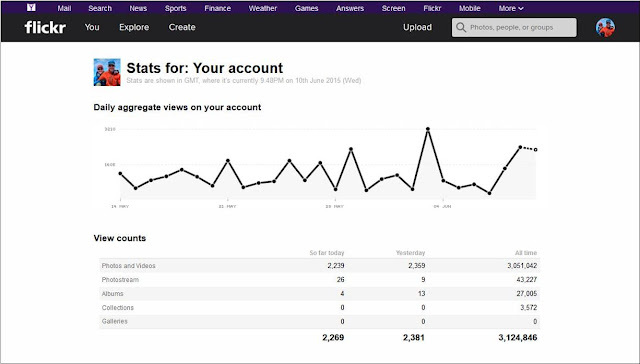 As John is an avid photographer and posts his photos on Flickr we pay a lot of attention to the “stats”. 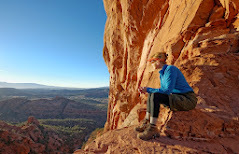 As I am already utilizing some social media then it would seem to be an easy next step to post something on Facebook about our recent trip on the Nankoweap Trail. But without an intimate knowledge of all the trails in the park it would be impossible for others to comprehend its significance. 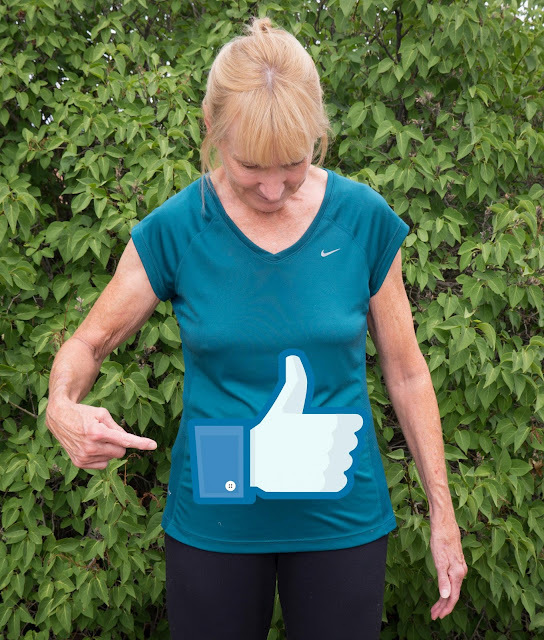 How can my Facebook Friends “Like” something they don’t understand? I then considered posting something on Reddit’s Camping and Hiking subreddit in hopes of some up votes and some positive comments. But what I have observed is that people most often up vote and comment on posts about trips they are familiar with and experiences they have shared. 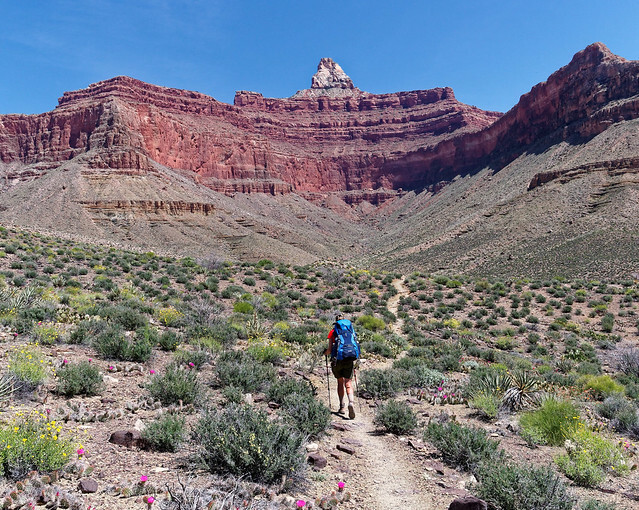 As far more people have hiked on the “corridor trails” in Grand Canyon; the Bright Angel and South Kaibab Trails, than on the Nankoweap Trail it is unlikely I would get the notice I craved. After John finishes editing his photographs and posts them to Flickr I can monitor the views of those photos but that recognition is for his accomplishment, not mine. 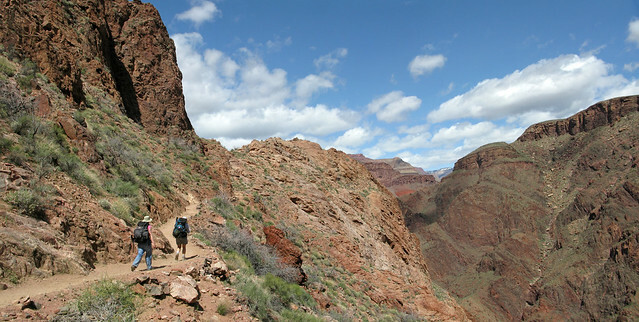 I then thought about another option, posting something about our trip on the Grand Canyon Hikers Yahoo Group. 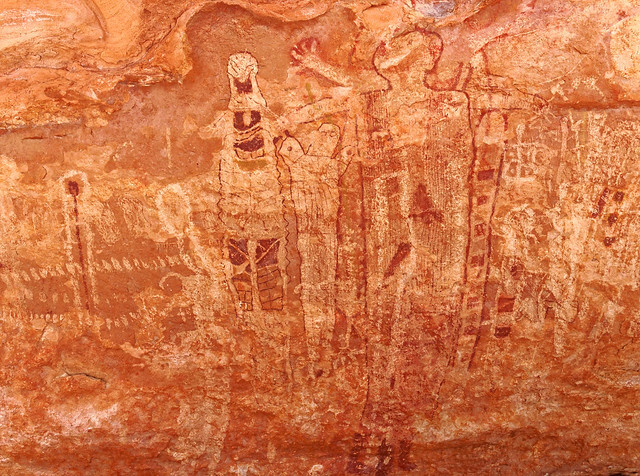 If anyone would be familiar with the Nankoweap Trail these folks would. 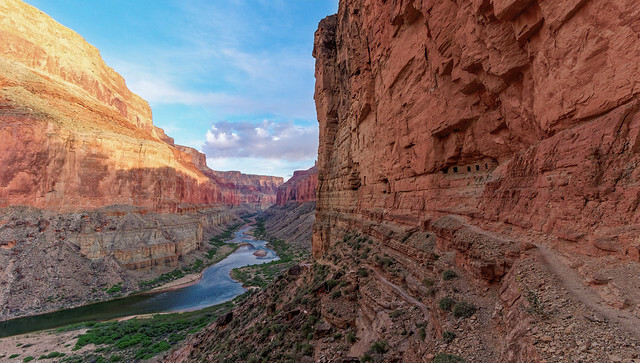 However, I realized that as a “named trail”, the Nankoweap is far less adventurous than the unofficial routes and side canyons that regular contributors to the group have explored in Grand Canyon. 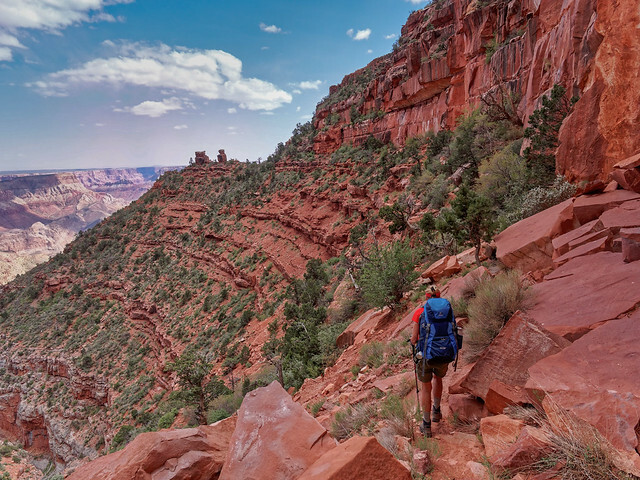 I assumed they would look down upon me with the same condescending attitude that I do when I read or hear about individuals who make a big deal about hiking the corridor trails in Grand Canyon. 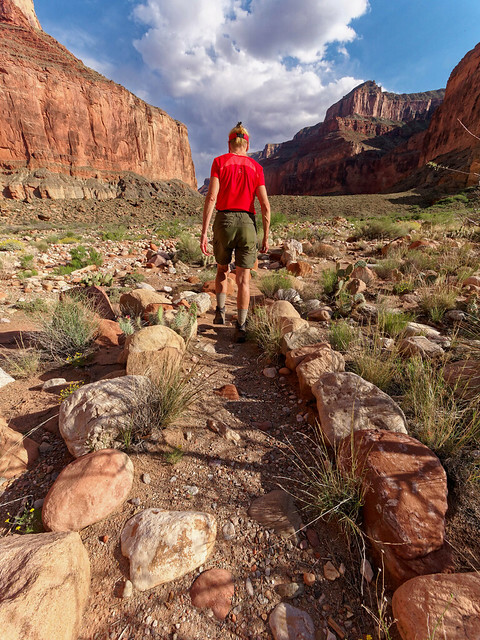 Compared to all of the other trails in the park these crowded trails, especially the Bright Angel Trail with its drinking water and toilets, feel more like a walk in a city park to us. 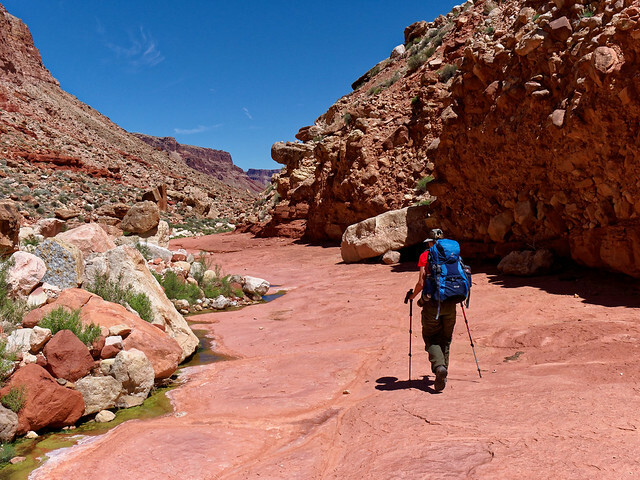 Some of those who have done the corridor trails as a multi day backpack trip have referred to it as a “trip of a lifetime”. 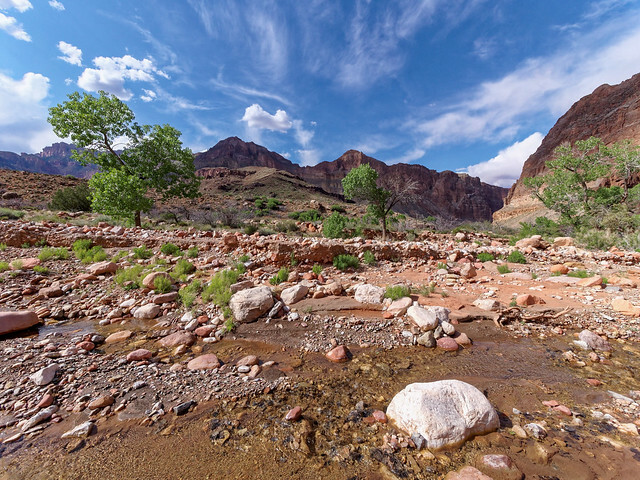 They treat staying at Bright Angel Campground like it was some extraordinary backcountry experience where for us it was like being in a state park campground on a busy weekend. All 33 campsites are well developed and even have picnic tables. 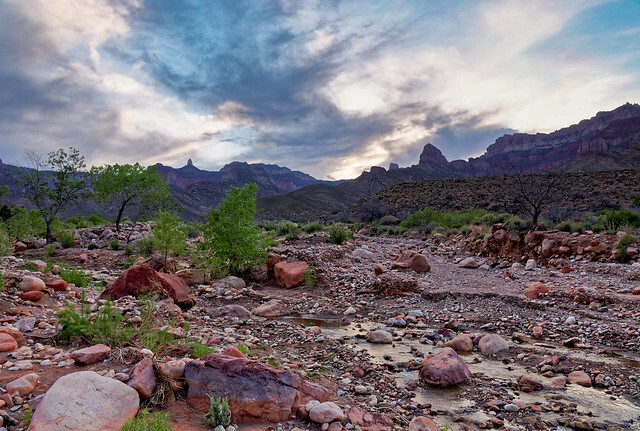 Amenities include flush toilets and potable water as well as a store and restaurant nearby at Phantom Ranch. There may be as many as 110 people camped there! I have wanted to say to them “Big deal”. I have wanted to tell them about our adventures in the park. I have wanted to tell them about spending a week on the west Tonto Trail, a trail where one must carry water to span multiple days. Out there our campsite was wherever it was level enough for our tent. The water we were lucky enough to find had frogs in it and one had to watch out for cacti and snakes when answering "calls of nature”. This trail is so remote that we went four days on a named trail during hiking peak season without seeing another person. We could take our breaks sitting in the shade of rocks completely naked. 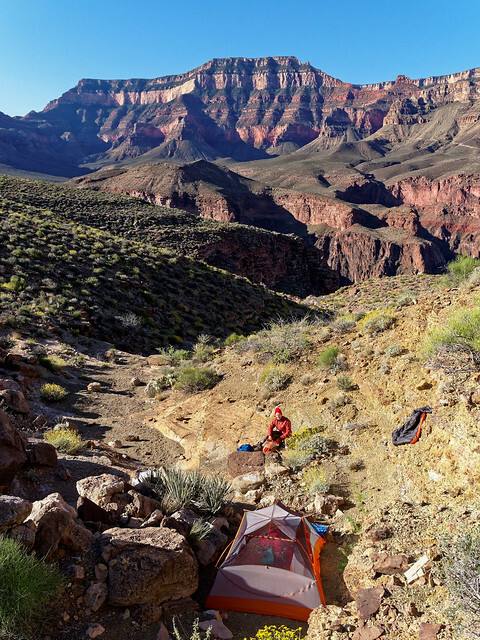 Now that is a backcountry experience! 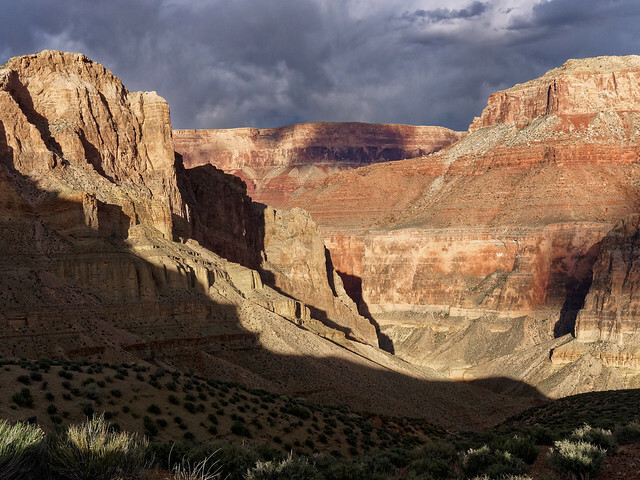 Now that we have been back from the Nankoweap Trail for a few weeks I have come to see it as no big deal as we have since done something more adventurous and more challenging in Grand Canyon. 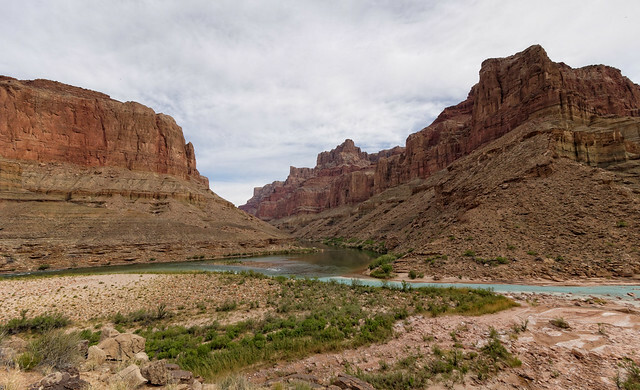 Given that we have hiked nearly every trail in the park (including the “most difficult”) we decided we could up the ante and do one of the unofficial routes; hiking down Tuckup Canyon, following the Colorado River downstream and hiking up and out through Stairway Canyon. … that he did without a second thought. Periodically I needed a boost up and at times I was unable to carry my own pack up an obstacle so he had to do it for me. I also needed to keep up a constant internal dialog of positive thoughts to avoid giving into my fears whereas he was out there just enjoying the moment. 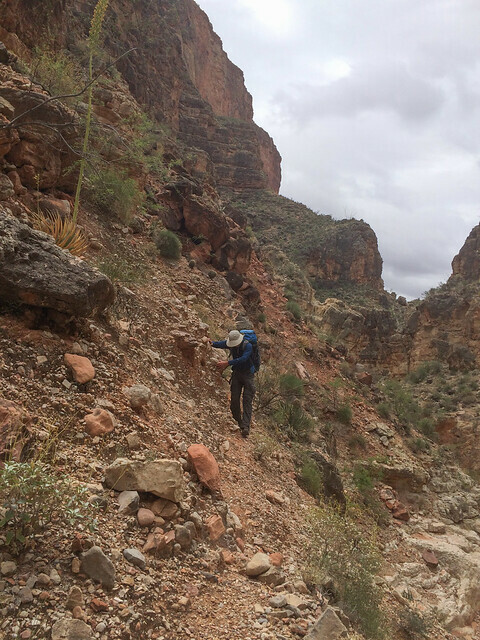 After we made the decision to turn around in Stairway Canyon I started thinking about the obstacles we would have to climb back up in Tuckup. I was apprehensive but each time I got up one I felt relief and even gained some confidence. However, I had forgotten one. 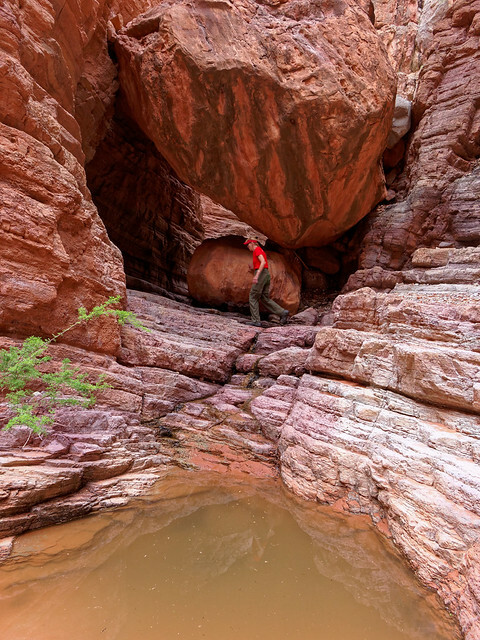 The largest obstacle we encountered on our entire trip was a large chockstone located in Tuckup just below where we were to camp on our last night. When we had come down the canyon on the second day of our trip we had both been able to “chimney” down it. John has done some rock climbing in the past and was completely comfortable executing this maneuver. However, it was my first attempt and my technique was undoubtedly poor. Fortunately I was going down and John was belaying me so I was safe enough. Once I saw this boulder again I remembered that right after I had gotten down it I had turned around and looked back at it. My first thought then was that it was a damn good thing we would not be coming out that way because there was NO WAY I would ever be able to get back up it! So my heart sank when confronted with this boulder again. We considered the options looking first to the right side where we had come down. John tried to boost me up in order to get started but I just couldn’t seem to make any upward progress. Poor technique and inadequate leg strength were the culprits and I was also very nervous about doing it without John belaying me from above. This was impossible of course because with him on top then I would need to stand on the packs in order to get started and then how would we have gotten our packs up? John is an excellent problem solver and was confident I would eventually wind up on top of that rock. He decided to get on top and then hauled up both packs which left me at the bottom feeling quite small and alone. I have a brain chemical imbalance that predisposes me to anxiety and whatever self confidence I had gained that day suddenly left me. 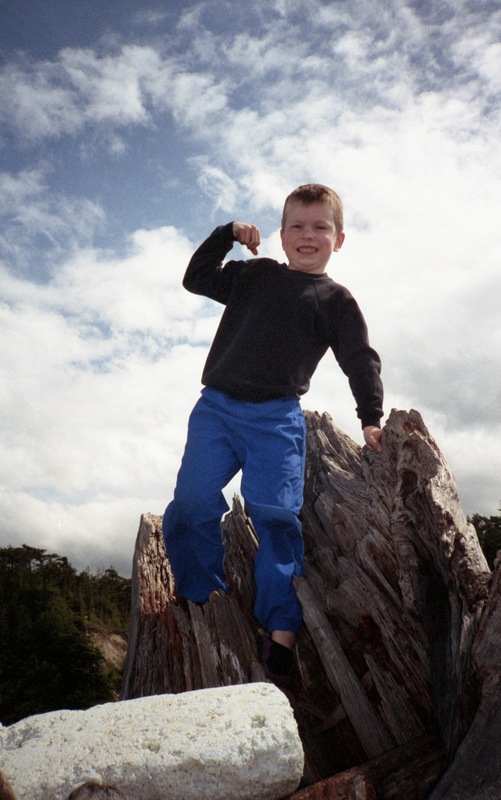 But intellectually I knew I couldn’t give in to panic so I worked very hard at maintaining a positive attitude. I consoled myself with the knowledge that whatever I did John would belay me so I would not be at risk for falling. But I understood that he would be unable to pull me up so I would have to get to the top under my own power. I just needed to find a way and if the right side wouldn’t work for me then obviously it had to be on the left. Climbing up this side had apparently been done before (or at least attempted) by others because there was a precarious pile of rocks below it. By teetering on the top of this pile and then getting a foot on the small grey rock toward the bottom of the boulder I was able to get up high enough to wrap my arms around the larger orange “C” shaped rock near the top. I hoped I could get my feet up on the boulder and “walk” my way up. Unfortunately my hip was wedged in the crack and I couldn’t move up so I lowered myself back down. 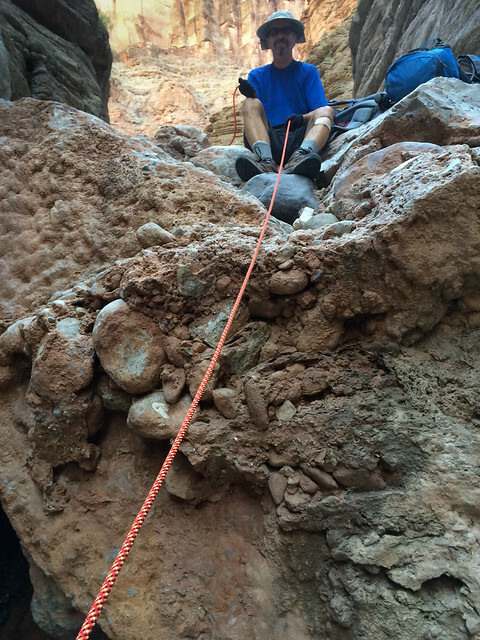 John then figured out a way to use part of the rope to belay me and anchor the rest of it. Not the best but worth a try. I was then able to make a loop on the anchored end of the rope, get my left foot in it and raise myself up so I could once again get my arms around the orange rock. Only this time because the rope hung further out from the crack I had a bit more room to maneuver. However, there wasn’t enough room to get my feet on the boulder so I had to rely on my knees. I gradually inched my way up and finally got my body over the top. I felt such an incredible sense of relief! I acquired a number of bruises, lost quite a bit of skin on the inside of both knees and I ached all over for days afterward. Perhaps after so many years I don’t remember childbirth accurately or what it took to get to the top of Mt Kilimanjaro but at that moment I was convinced it was the hardest thing I had ever done physically. I’m sure a skilled rock climber (or anyone younger and more agile than I am) would have made quick work of this boulder but compared to what I have done before it was a really big deal. I wish we had a photograph (be grateful I resisted the temptation to photograph my scraped knees and post it). Once home I again felt an intense need to tell someone to “Look at me!” And once again I felt like a little kid but I decided that it was okay. I decided it was okay to want attention and praise for what I had done even though to many it would have been nothing. 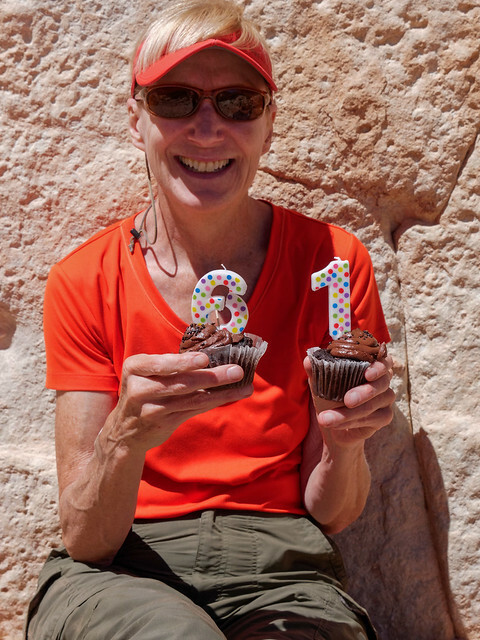 But it was also a very personal experience and I still didn’t feel like posting something to Facebook, Reddit or even to the Grand Canyon Hikers Yahoo Group. They just don’t know me and would not understand why it was such a big deal. So I sent an email and photo of my rock nemesis to my siblings, our sons and my sister in law with a brief description of my ordeal. Granted none of them have experienced anything like what I did but they all know me well enough to be suitably impressed. This experience has taught me something valuable. I have been reminded that we all have our own “comfort zone” and the capability to stretch it. We all have an “envelope” which we can “push” and there is no point to comparing how far we can go to how far others have gone. It is not a competition. I also accept that it is normal for all of us to sometime want others to be impressed and tell us things like “Wow!” and “Good job!” Therefore, I have decided to be supportive and complimentary of the accomplishments of others even if what they have just done is something I consider to be a “piece of cake”. 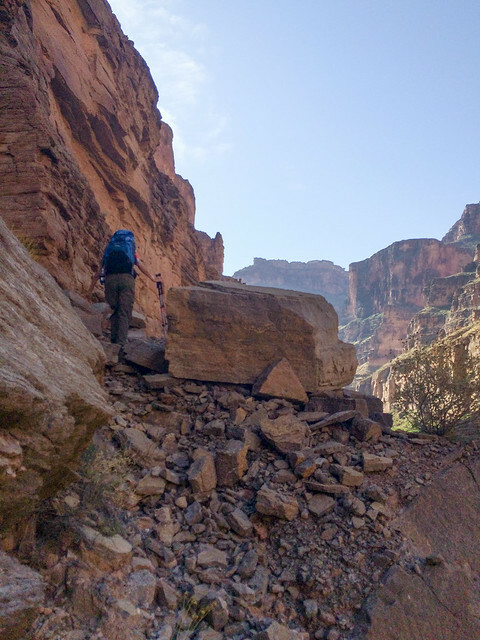 I now understand that hiking on the Bright Angel Trail in Grand Canyon is as big of a challenge for some individuals as getting up that boulder was for me. But I have to admit that even after getting all the praise and support from my family I still felt let down. I have always been aware that I am not as fit or as strong as John is nor do I possess his experience and courage. We have never turned back on a trip before this and part of me believed that it was somehow my fault. I felt like something in the Cosmos was trying to tell me that I was stupid to think I could do this. But then I remembered that the obstacles we encountered in Stairway Canyon had not defeated me. We did not turn back because I said “I can’t climb that”. 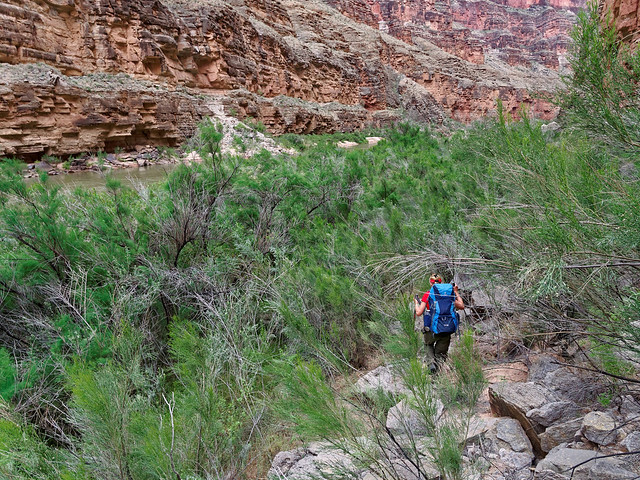 We turned back simply because we couldn’t find the route up the canyon. But something I need to understand is that it is unreasonable to rely entirely on others for all of the validation that I need. I must realize that there is only one person who truly understands what challenges me, what my accomplishments are and what they mean to me. And that person is, of course, me. 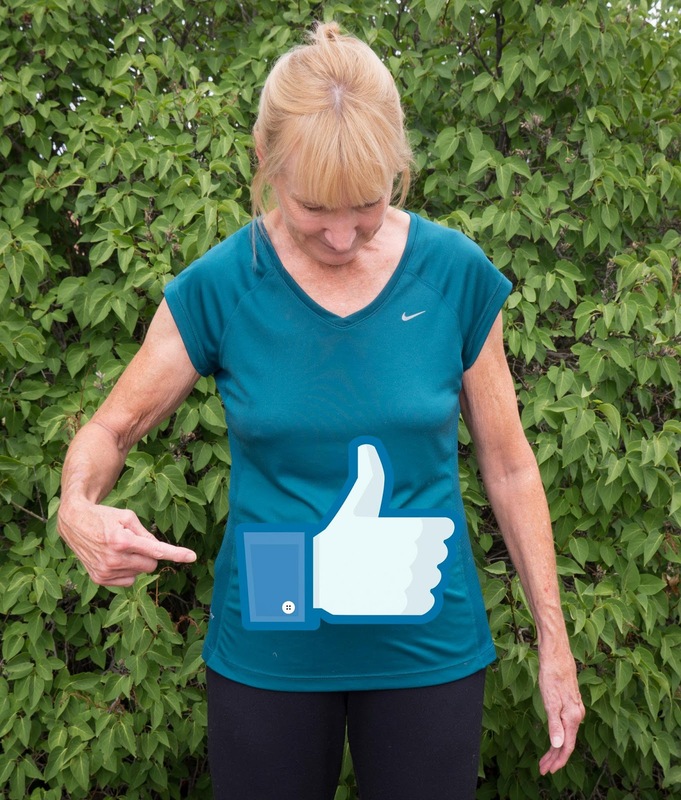 All I need to do is put forth my best effort and “up vote” it and tell myself “Good job, Jean!” And then I should find my own personal “Like” button and push it.